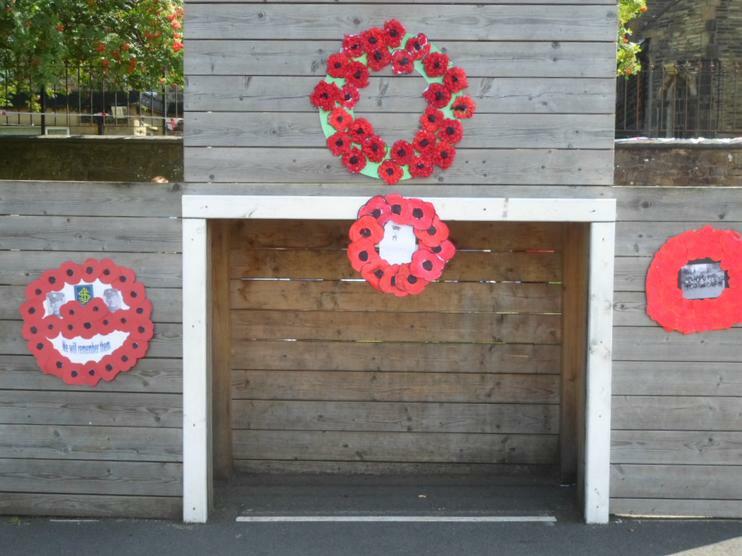 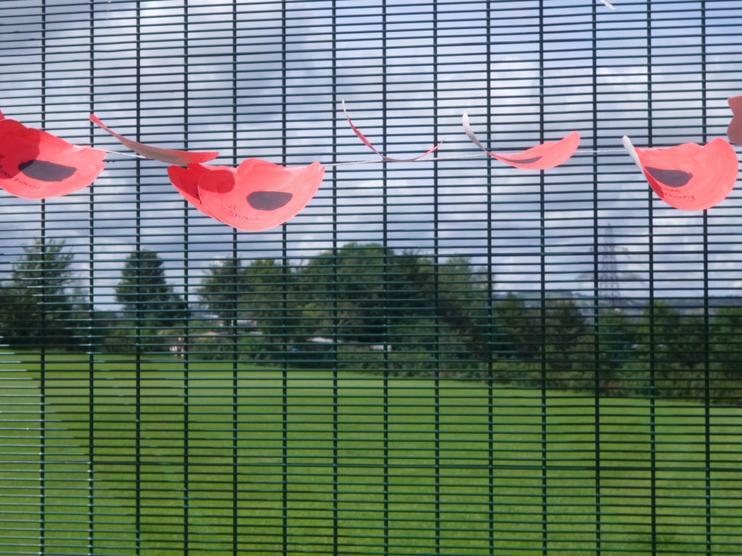 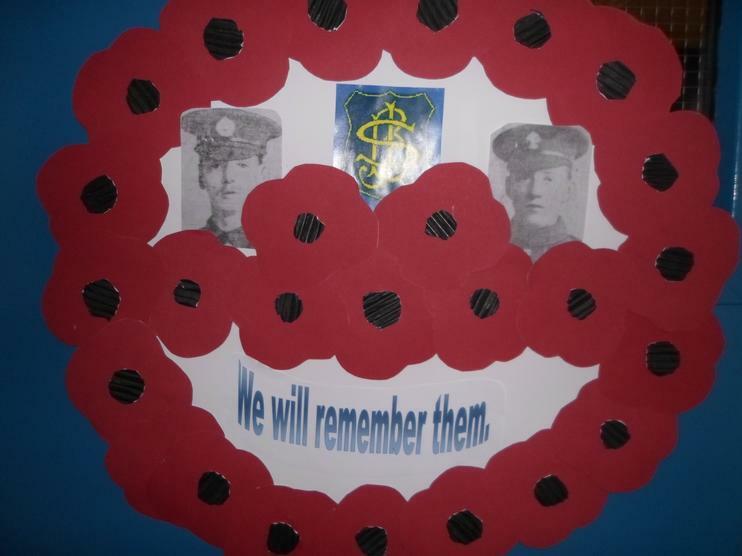 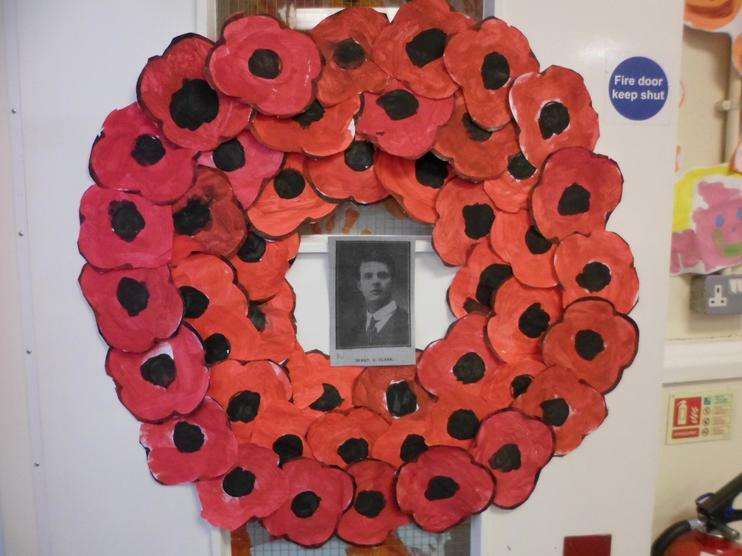 As a school, we wanted to continue our commemoration of all the soldiers who died and fought in World War I as well as all the other wars. 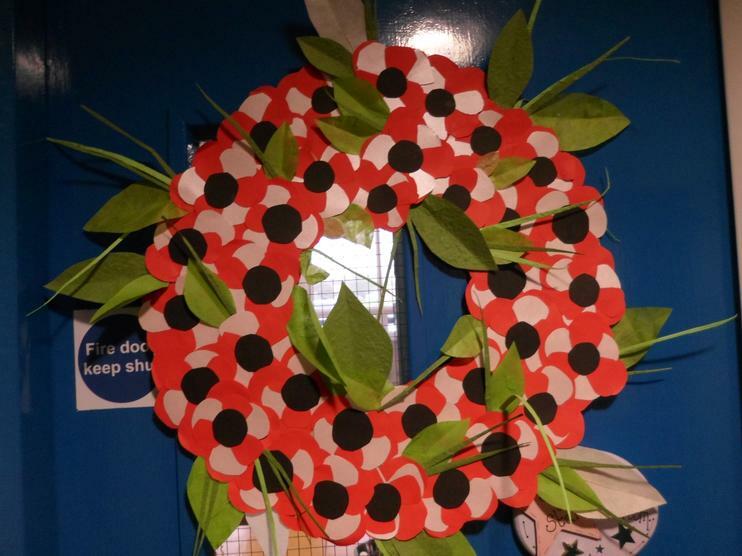 We have been fortunate enough to buy some of the beautiful ceramic poppies that had been on display at the Tower of London during the 100 years commemoration. 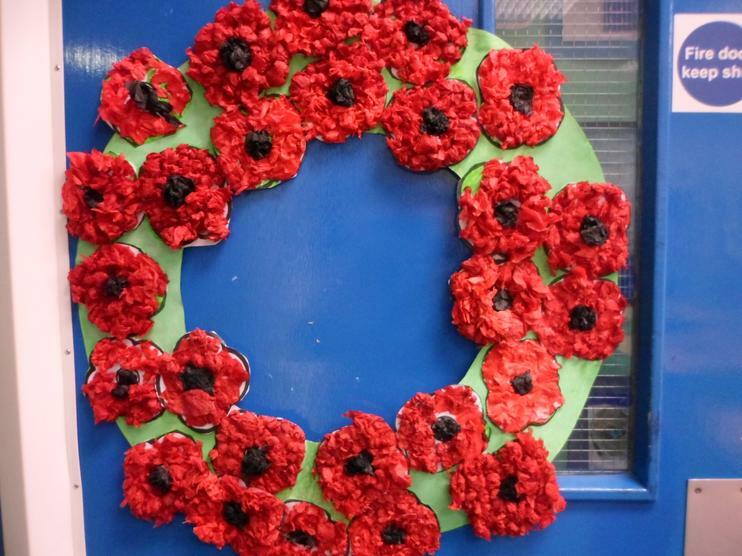 We have bought one for each class in school and are currently discussing ways in which we can display these. 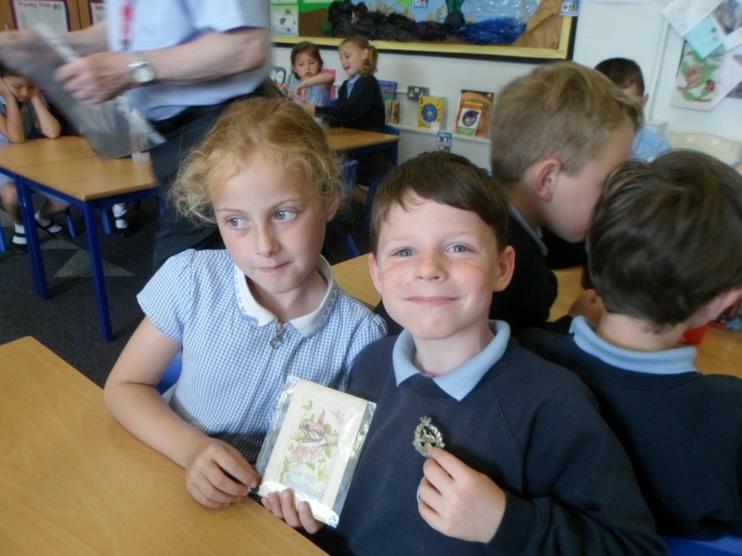 We are impressed with the way that these have been packaged and think that the boxes are beautiful. 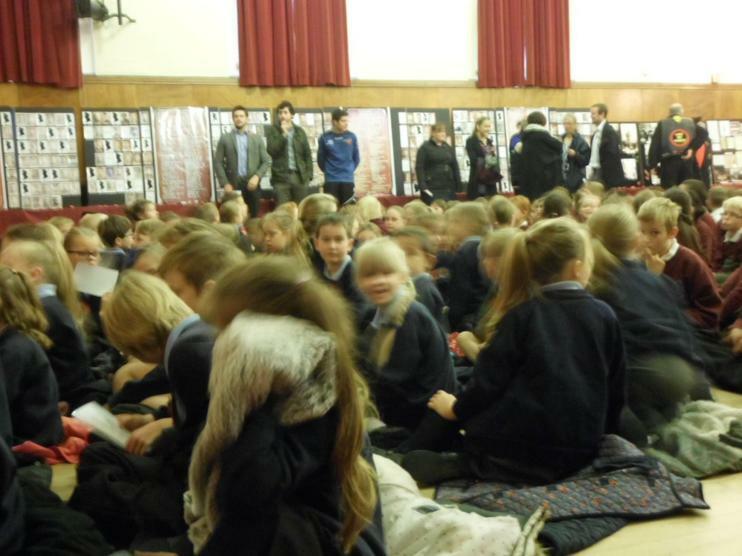 Here are a few photos of how they arrived. 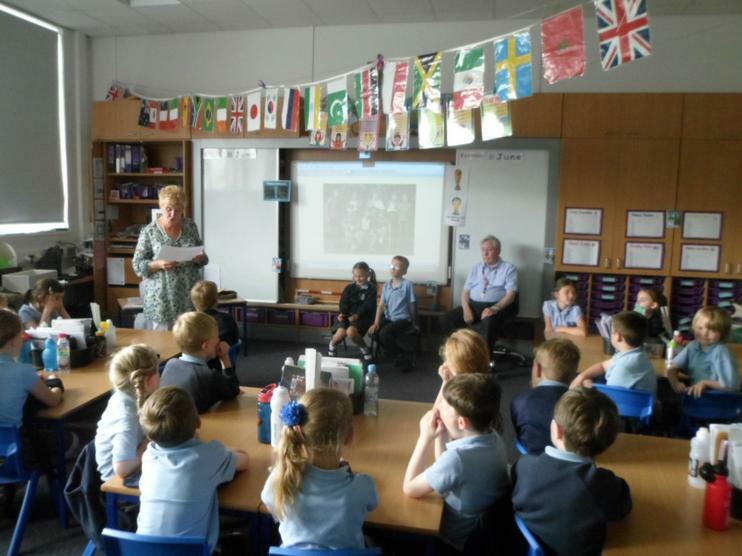 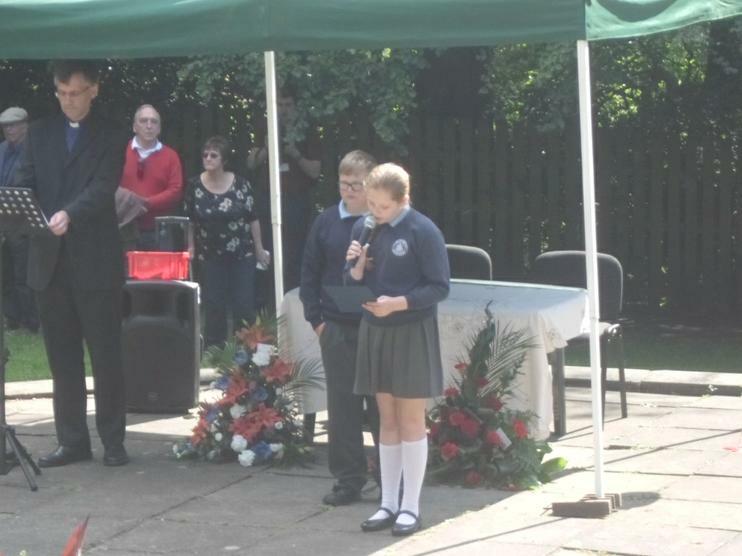 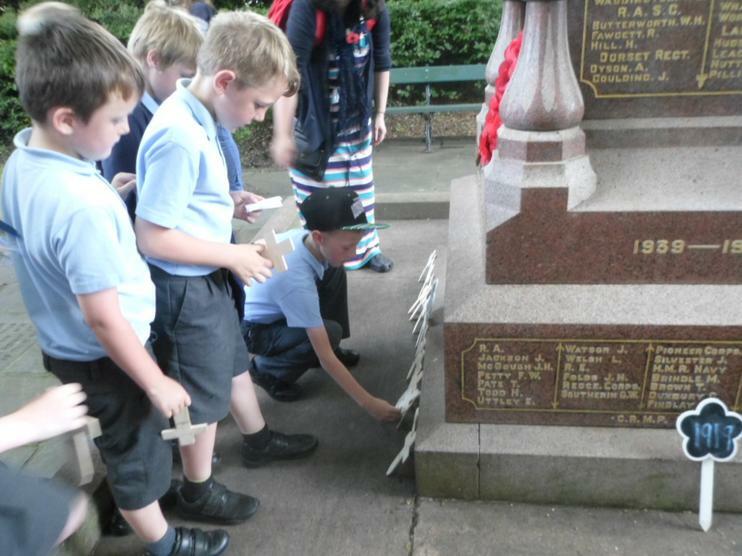 The children in Years 2, 3 and 5 attended a very special ceremony to remember all the soldiers who have fought and died in the wars. 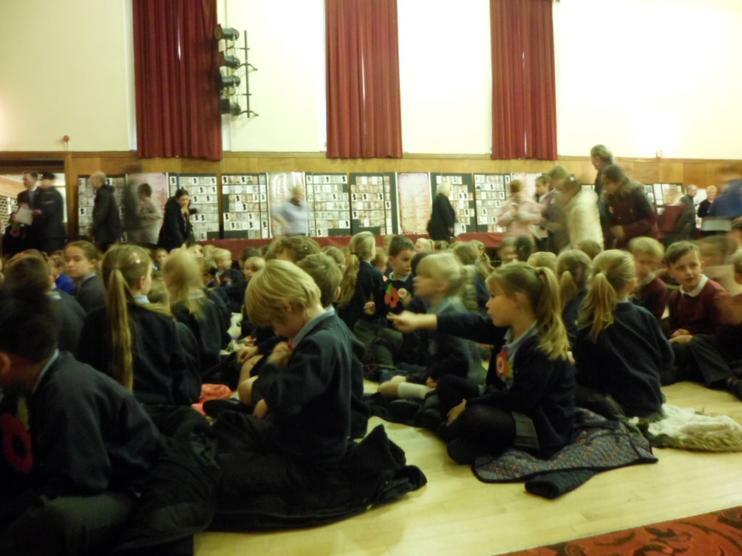 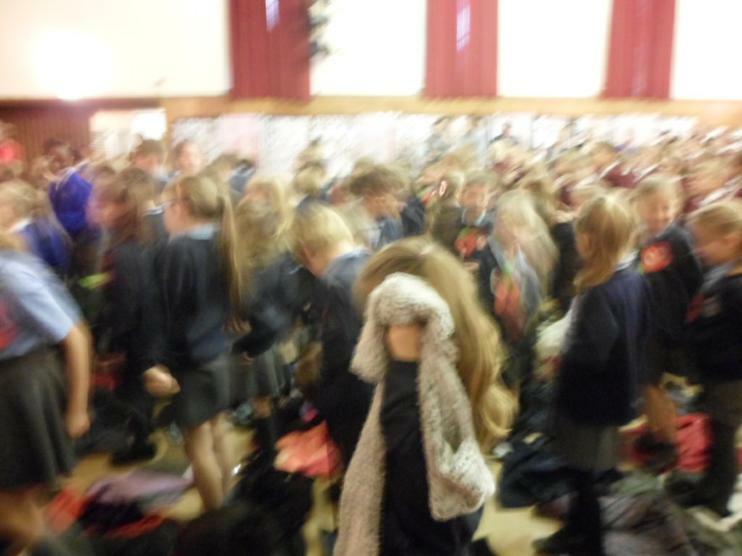 Their behaviour, as always, was exemplary and they were a credit to St. John's School. 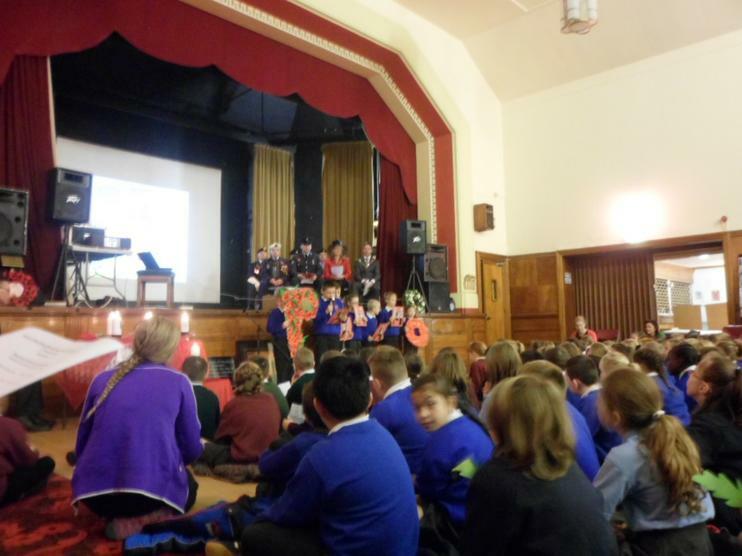 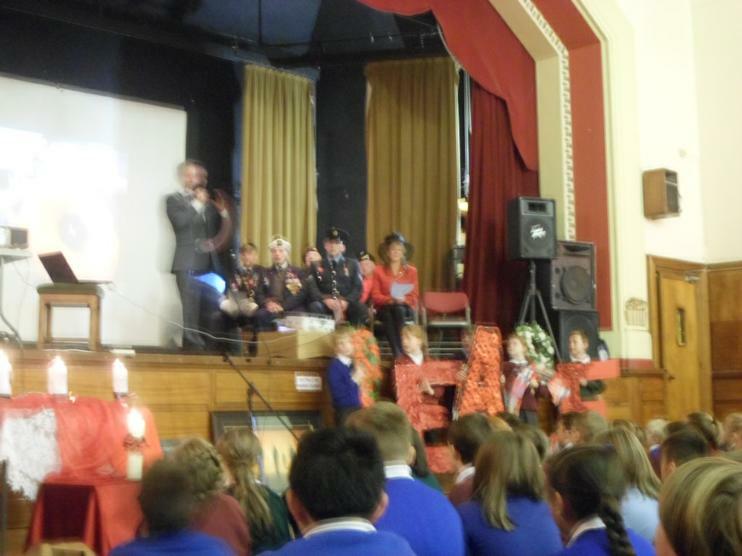 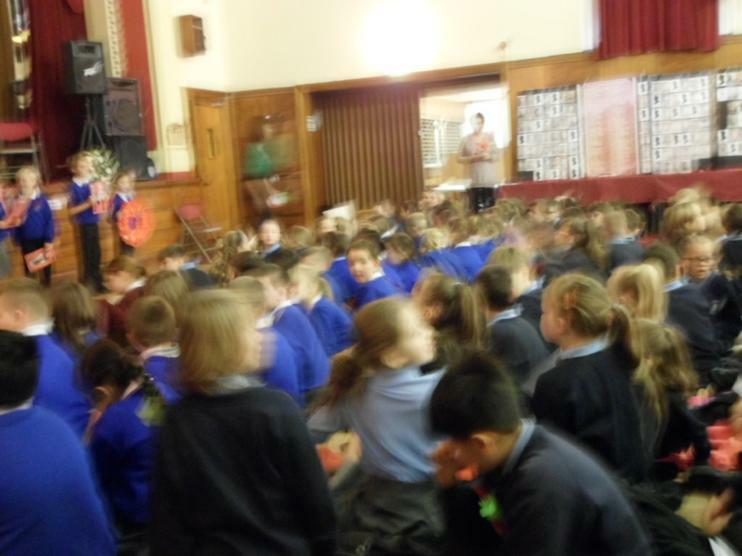 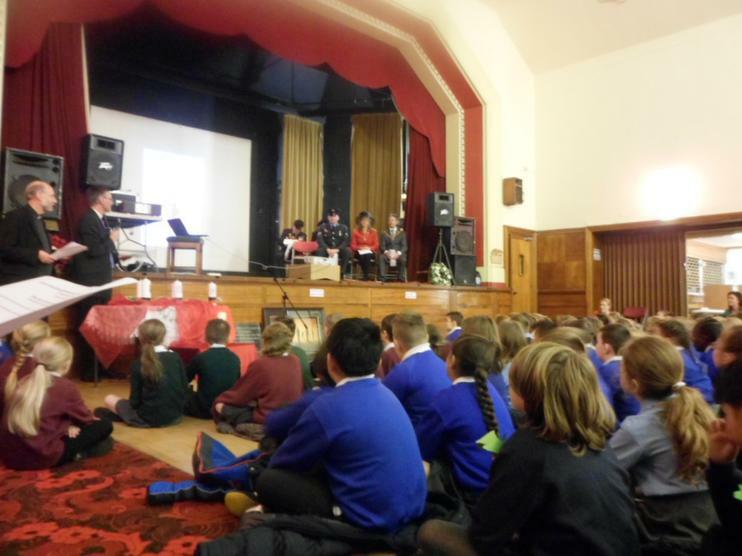 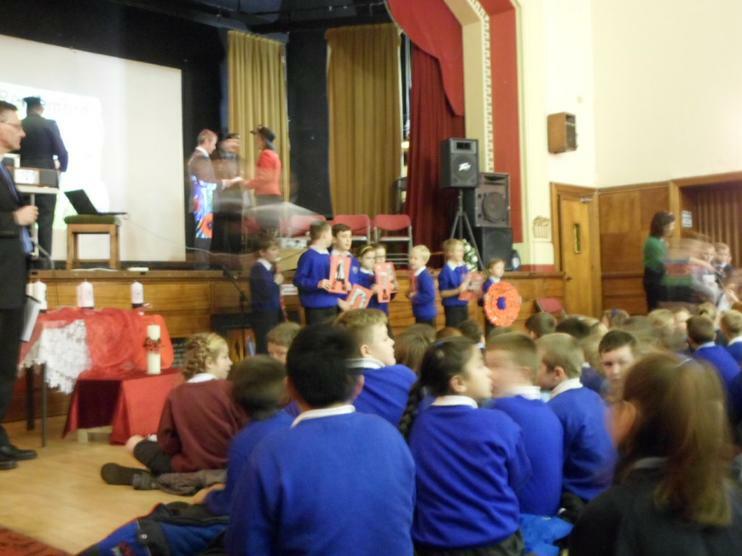 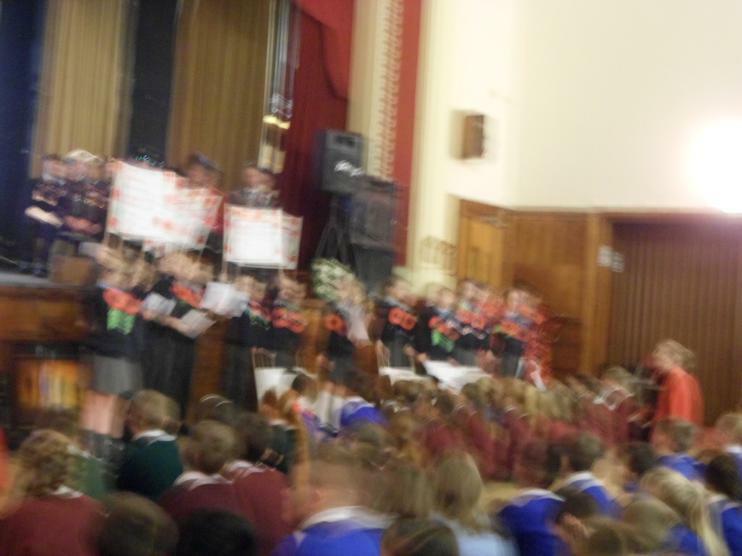 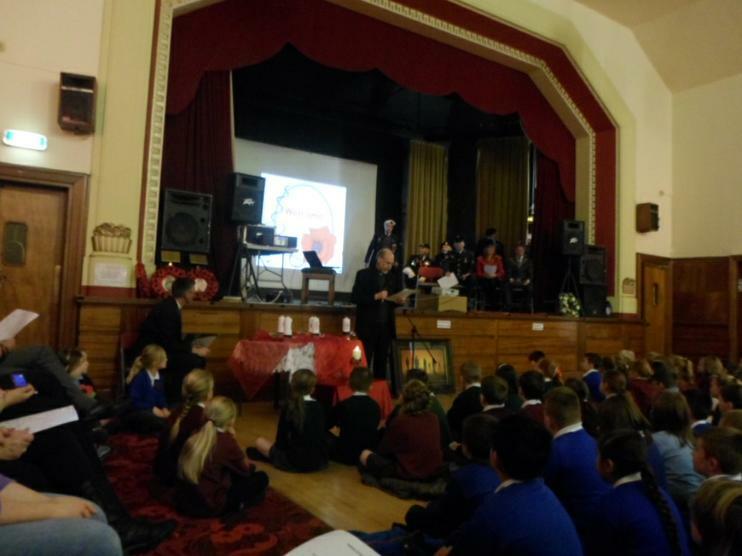 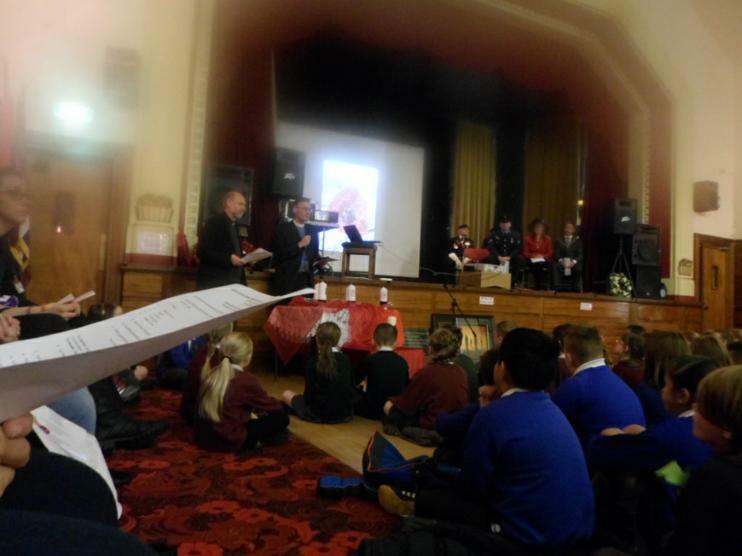 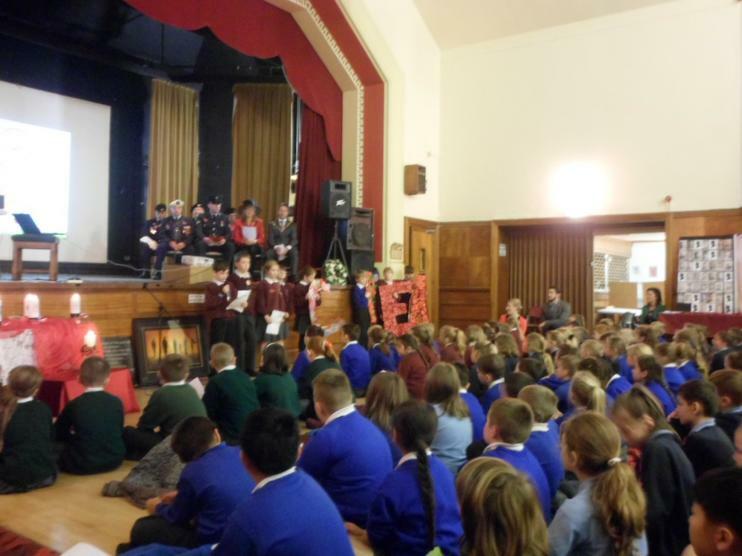 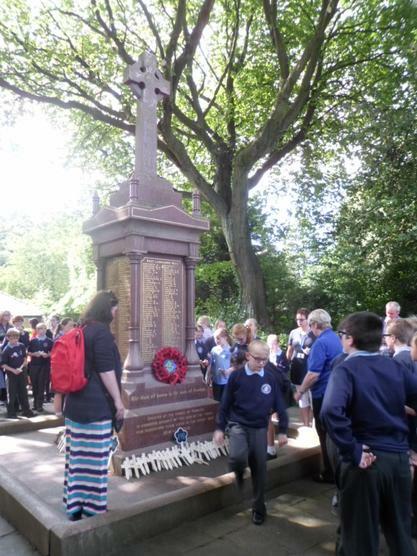 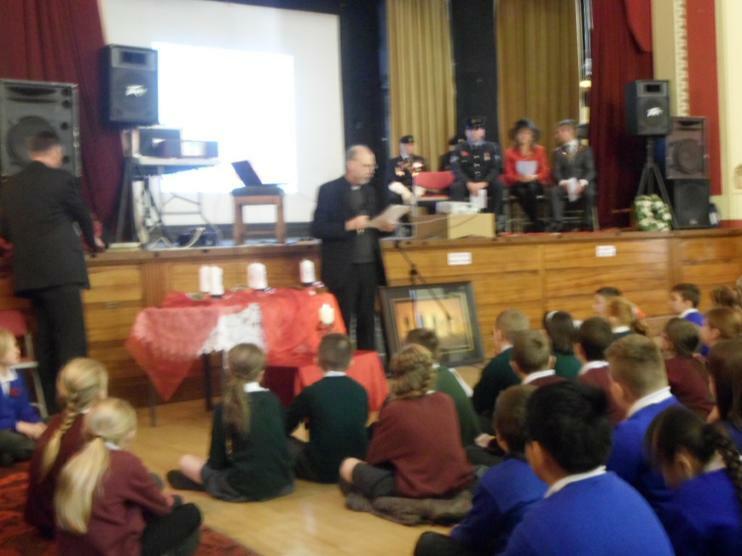 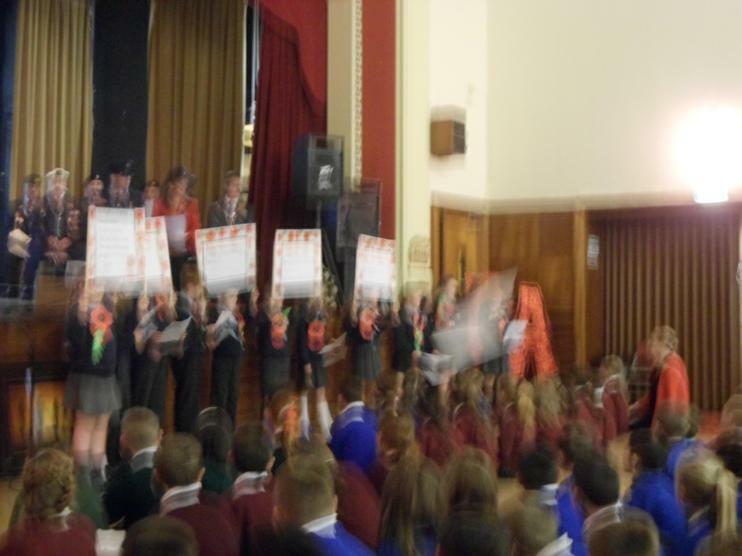 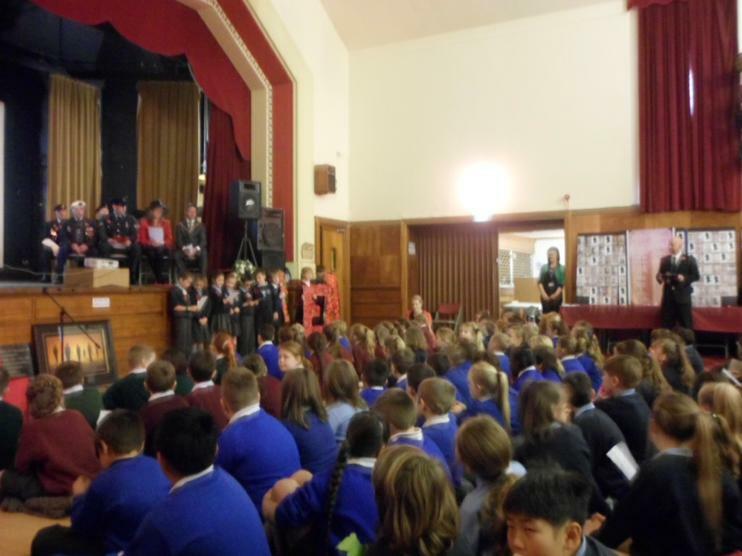 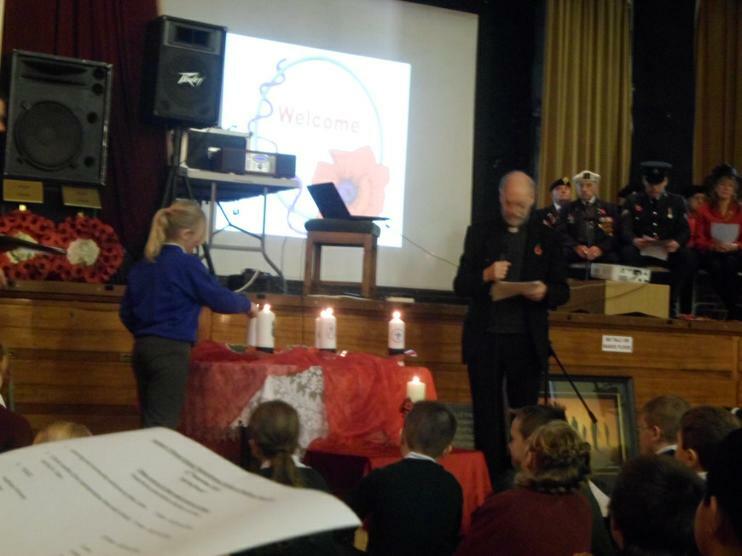 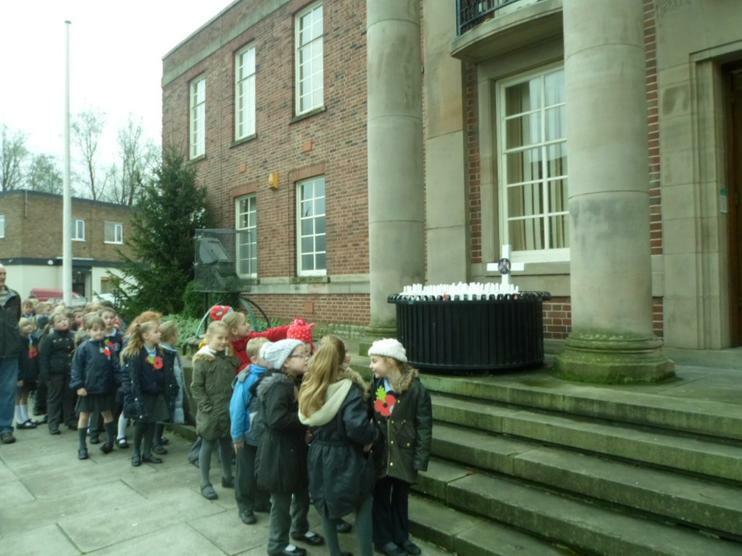 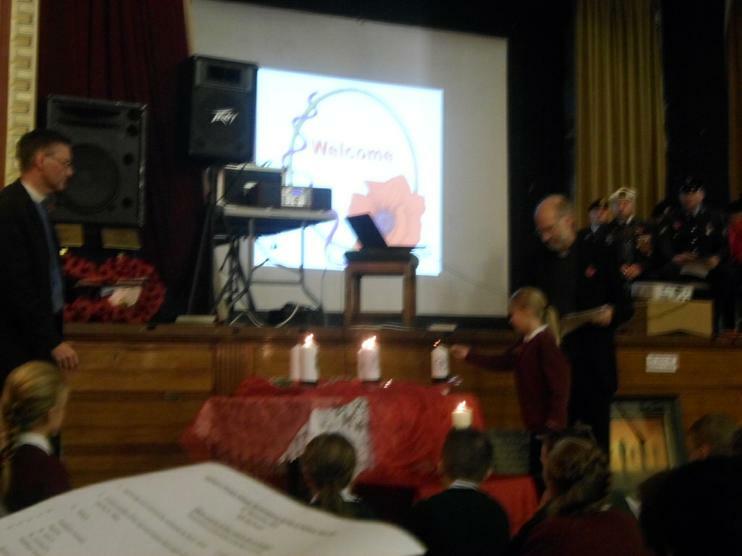 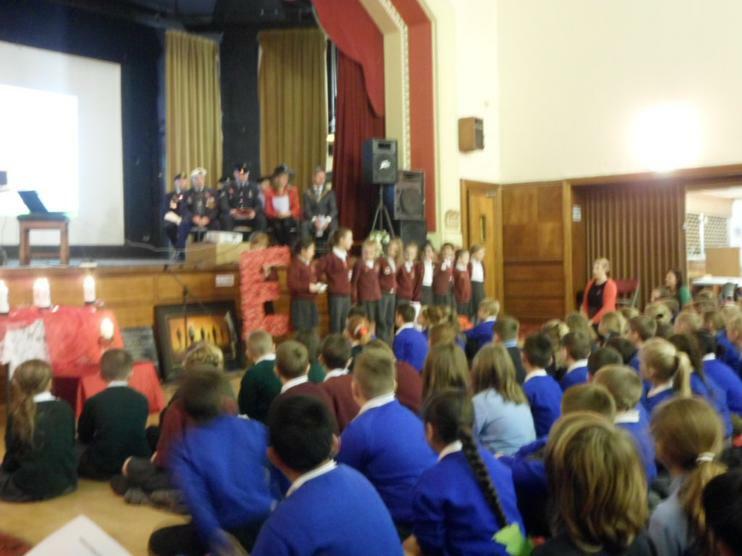 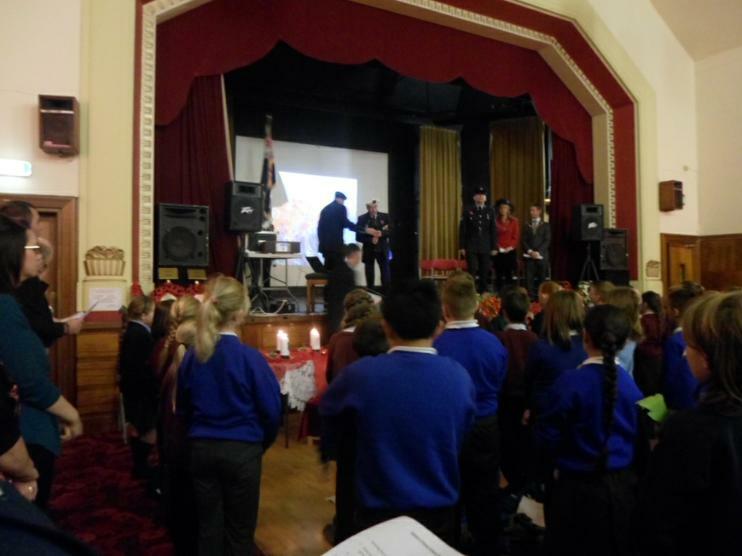 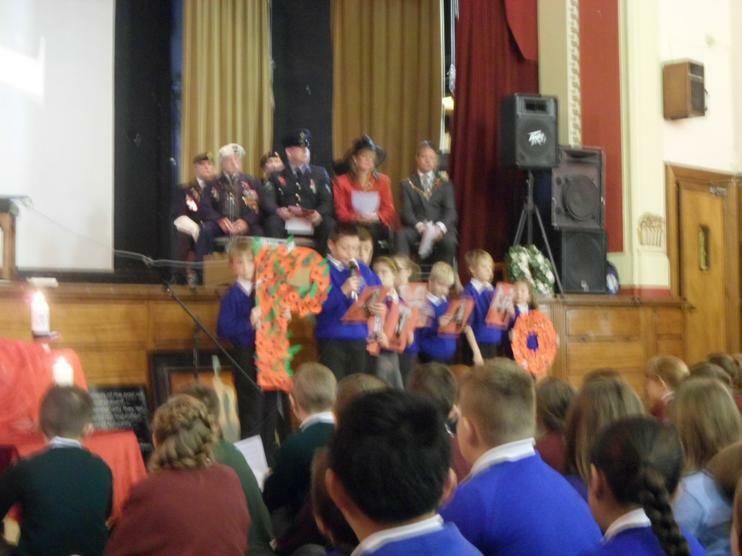 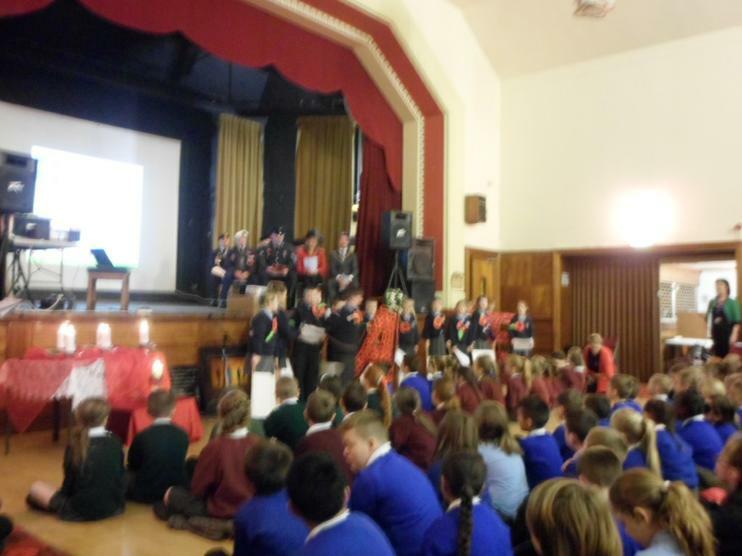 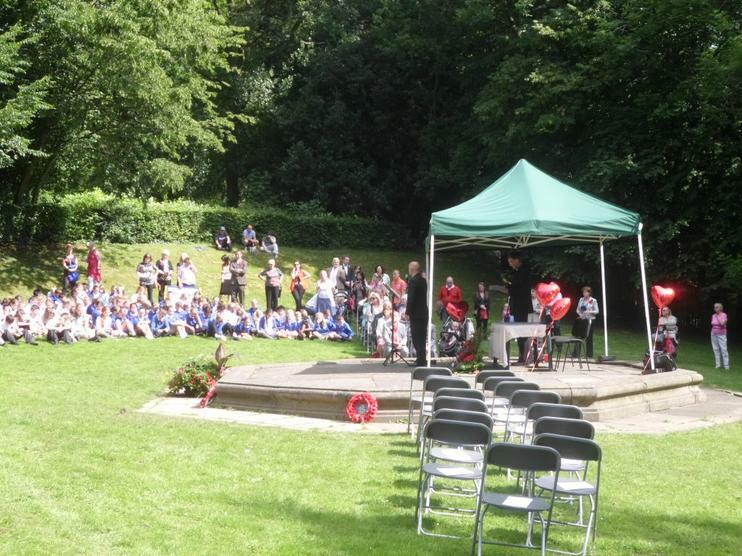 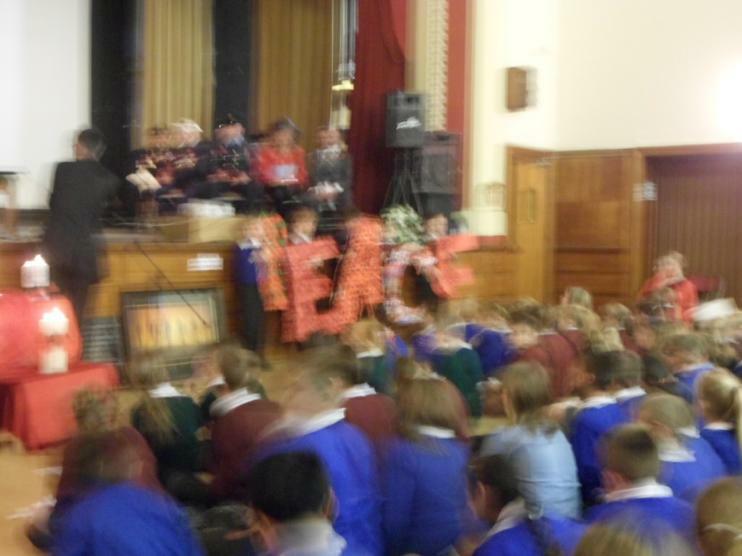 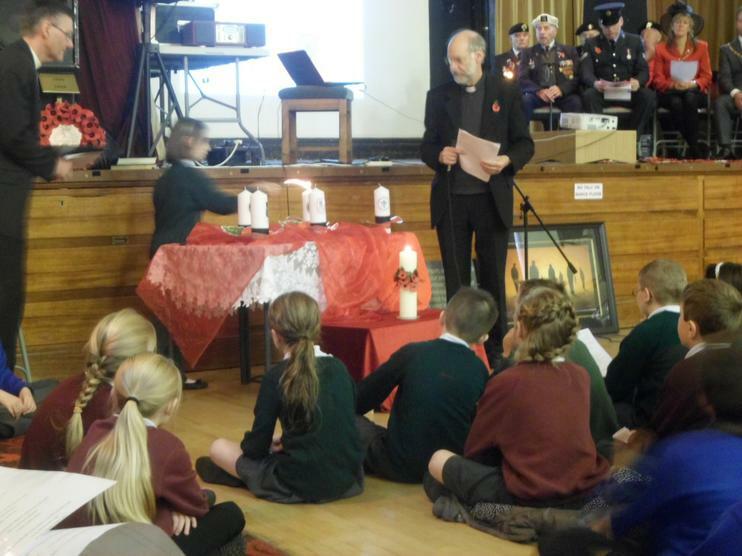 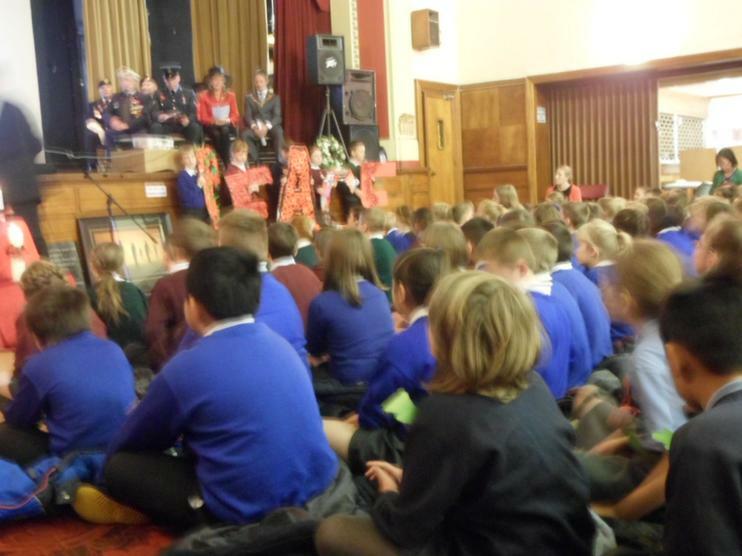 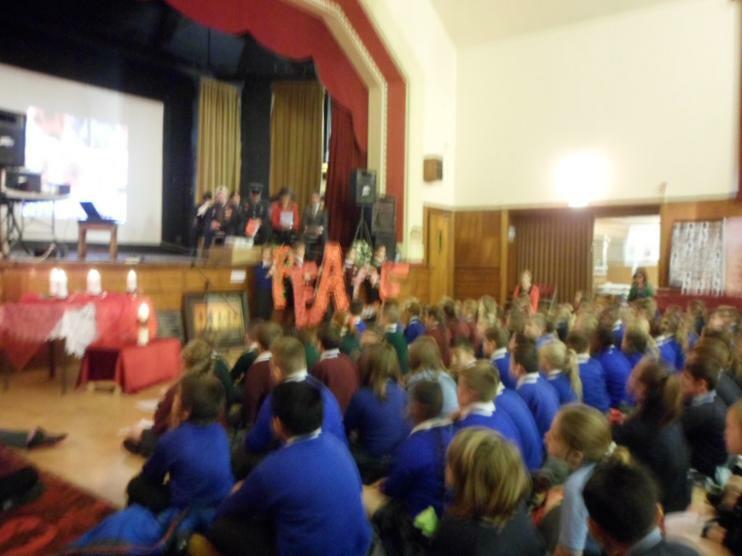 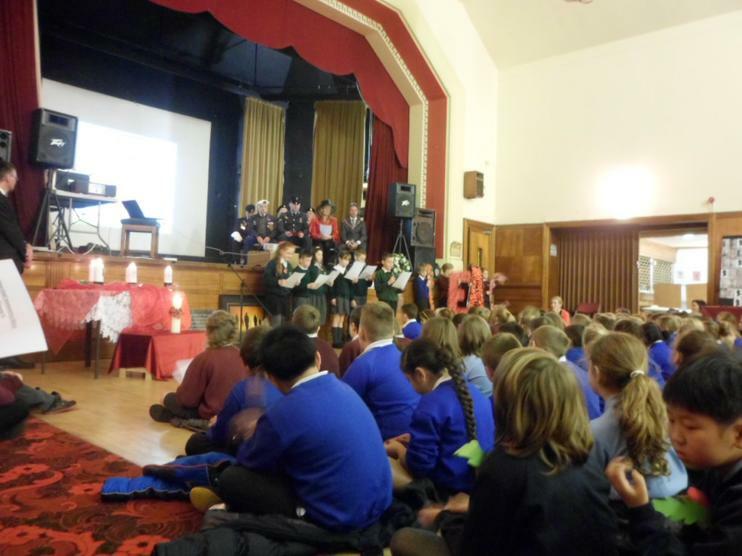 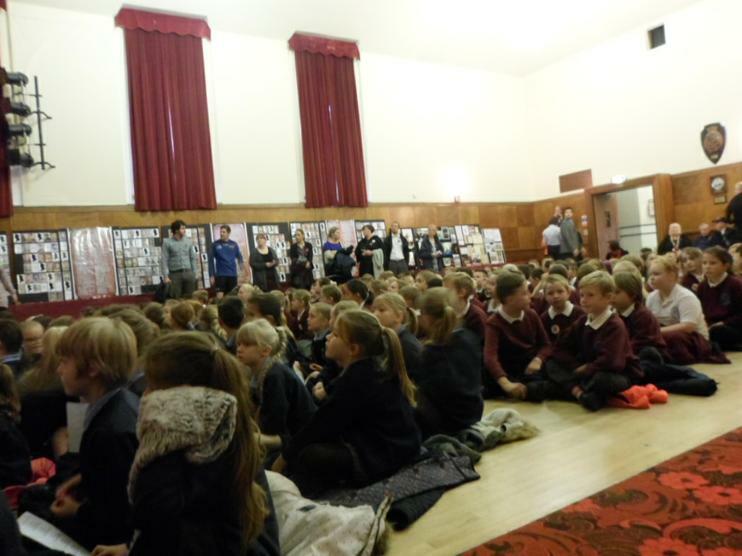 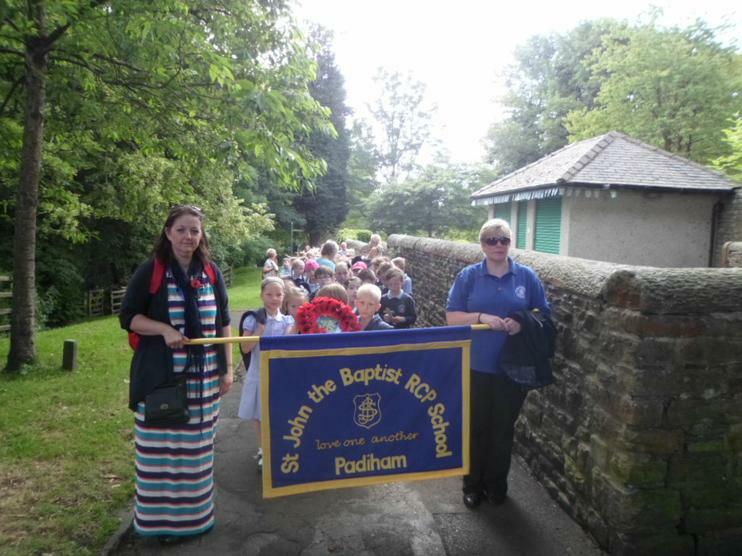 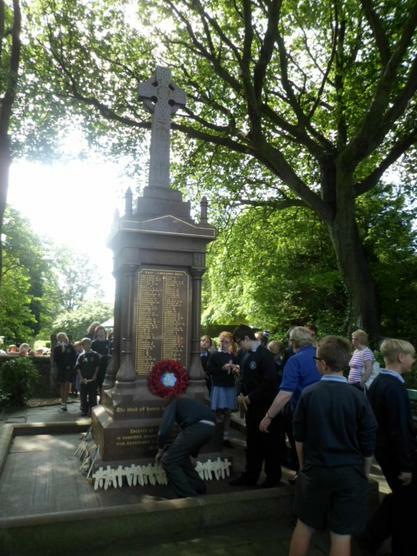 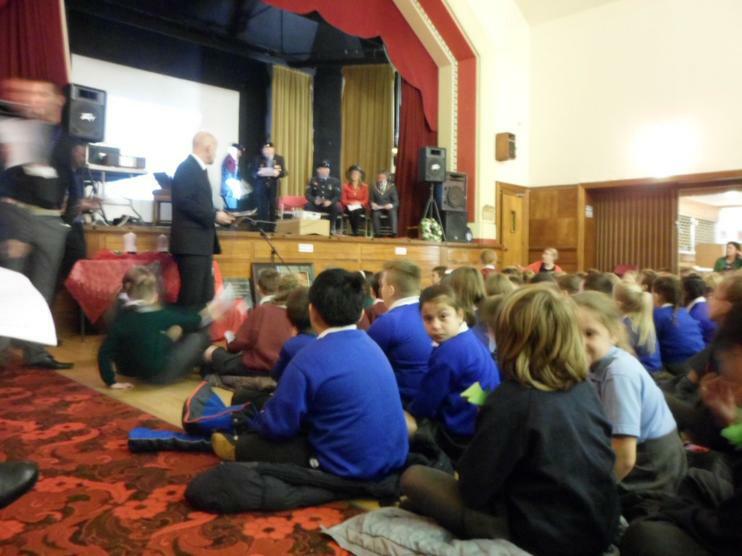 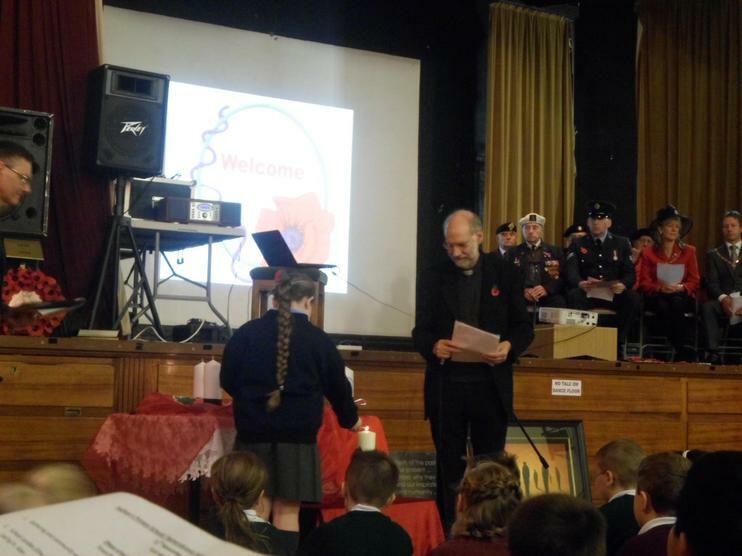 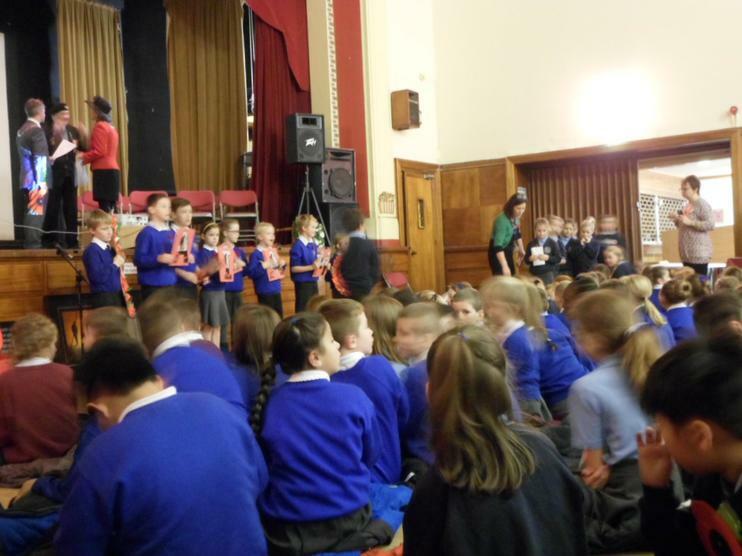 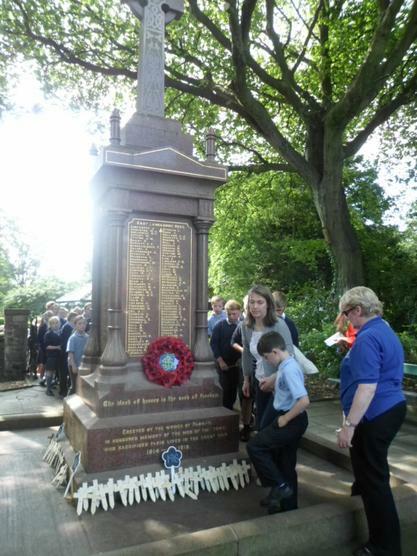 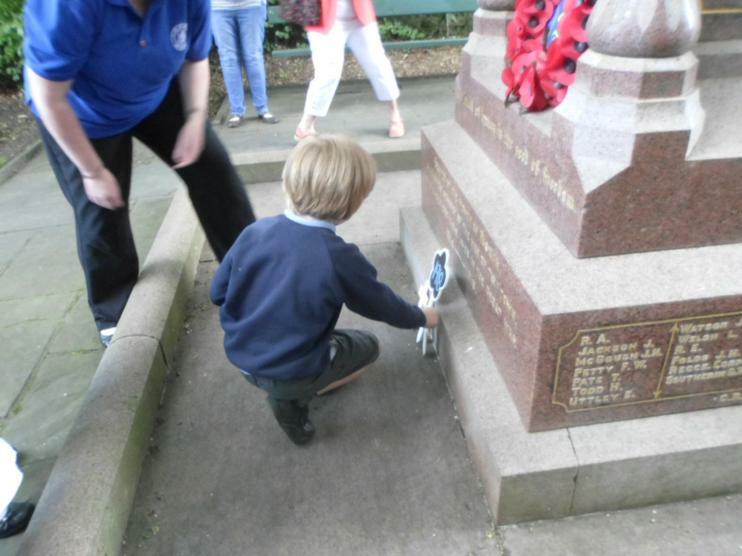 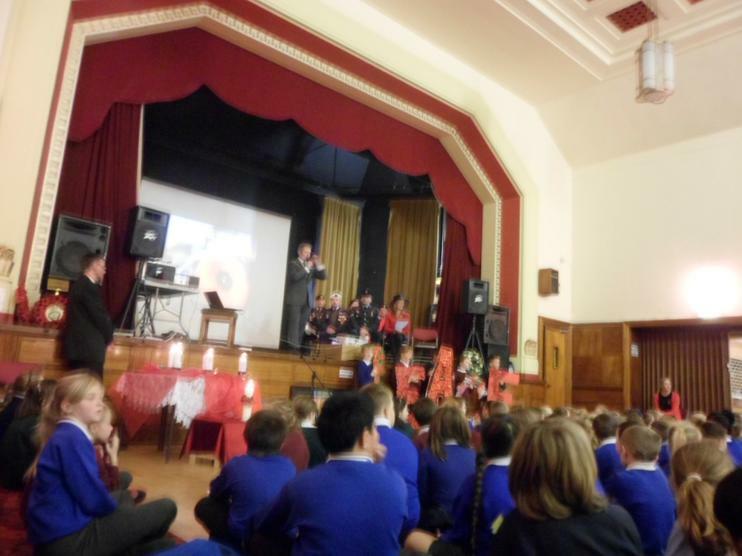 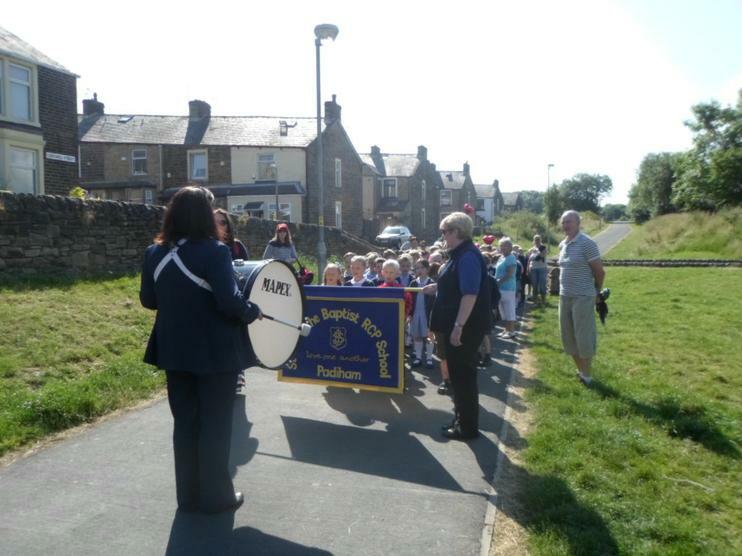 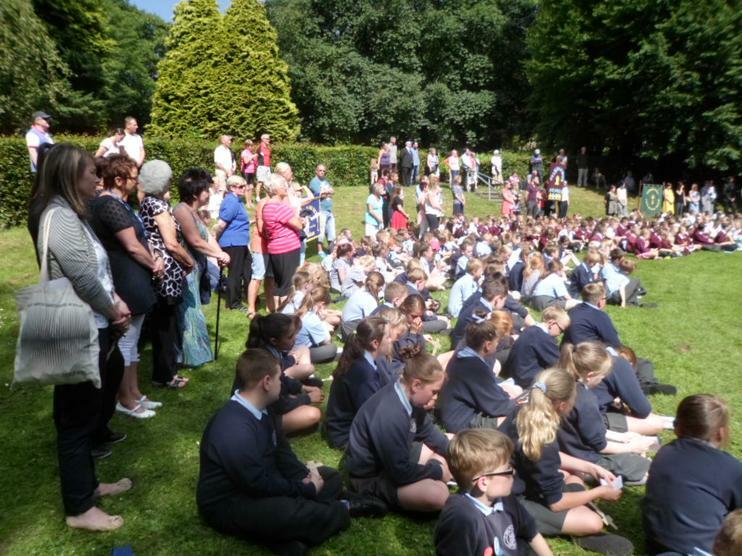 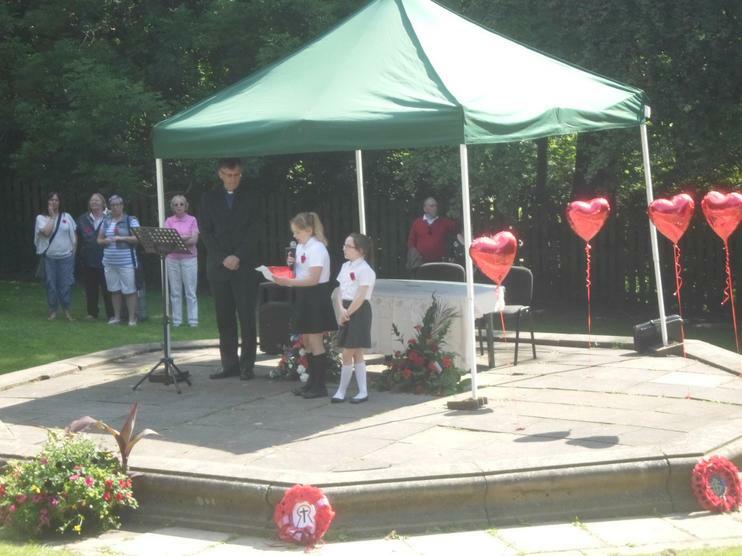 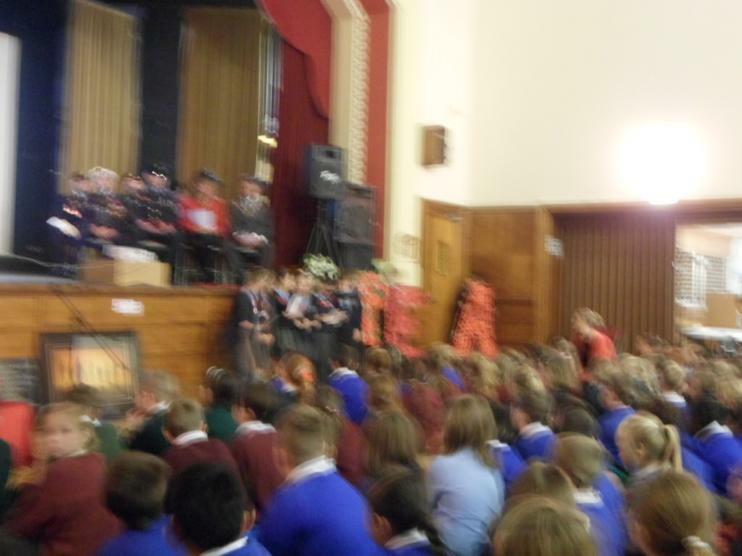 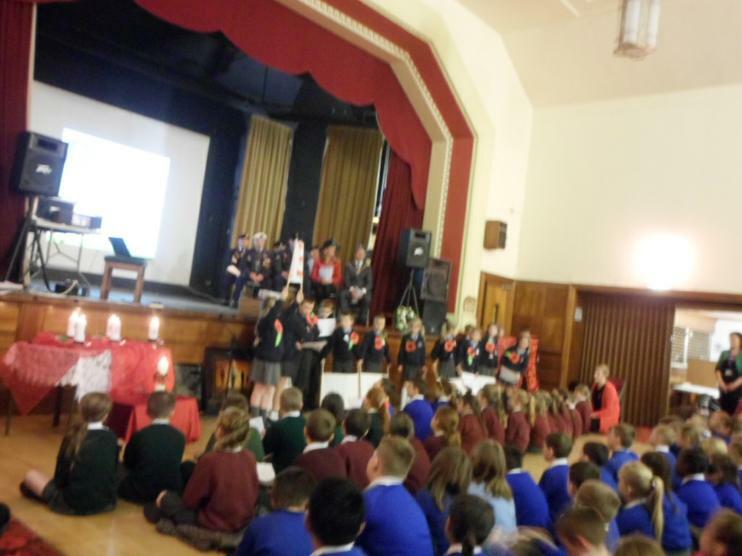 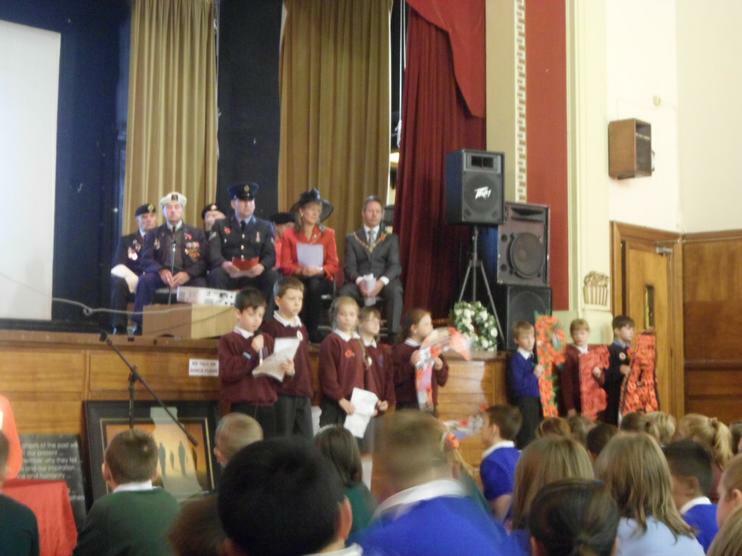 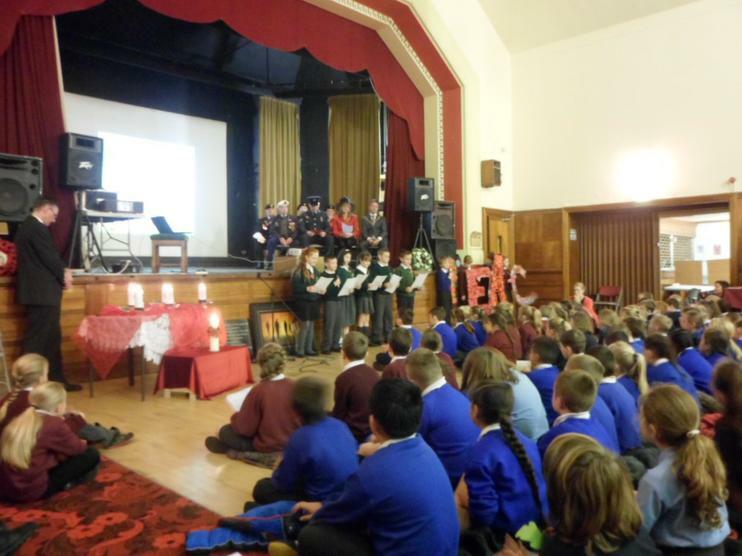 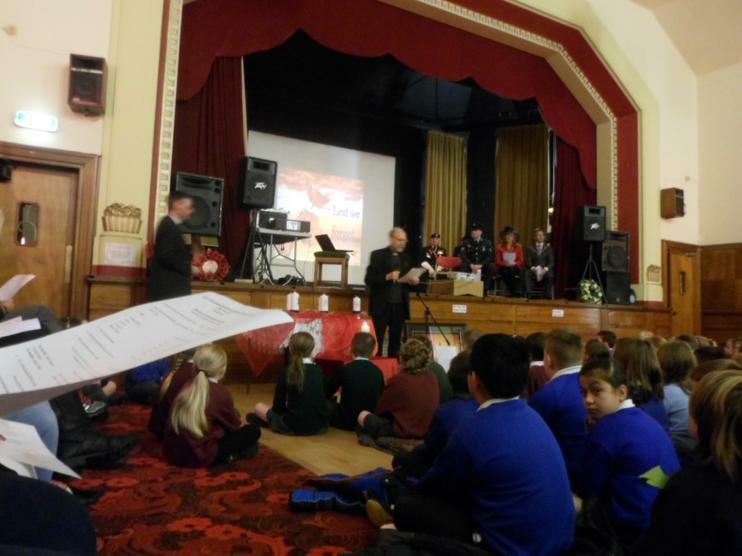 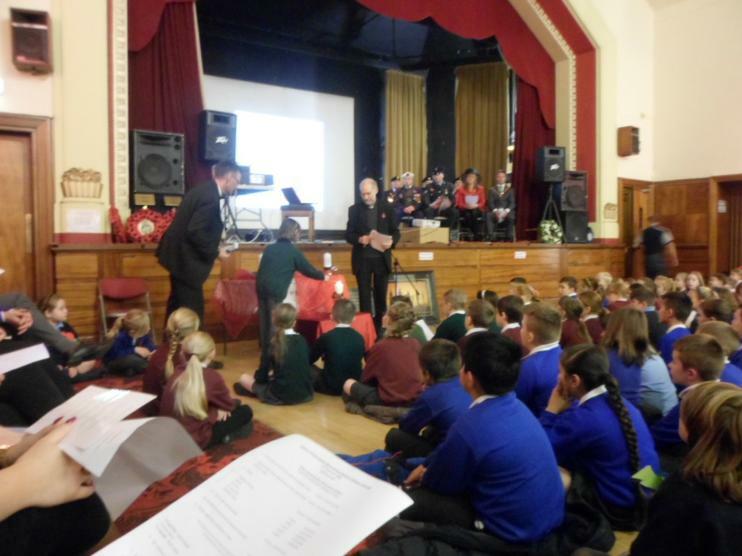 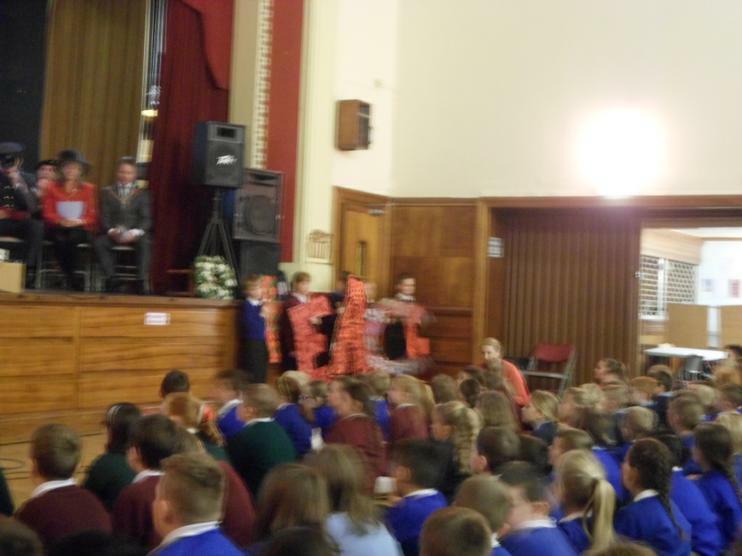 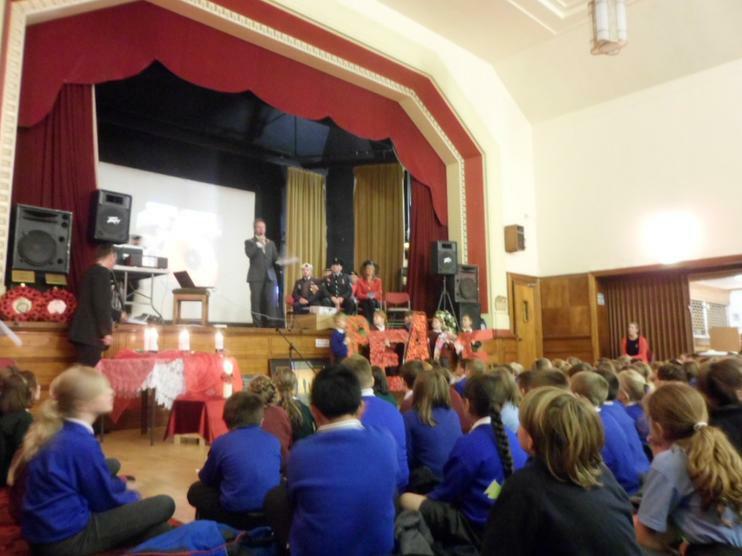 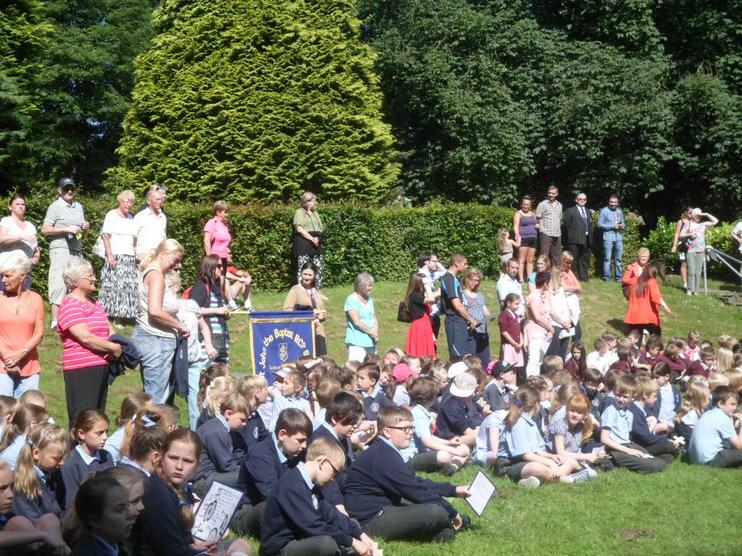 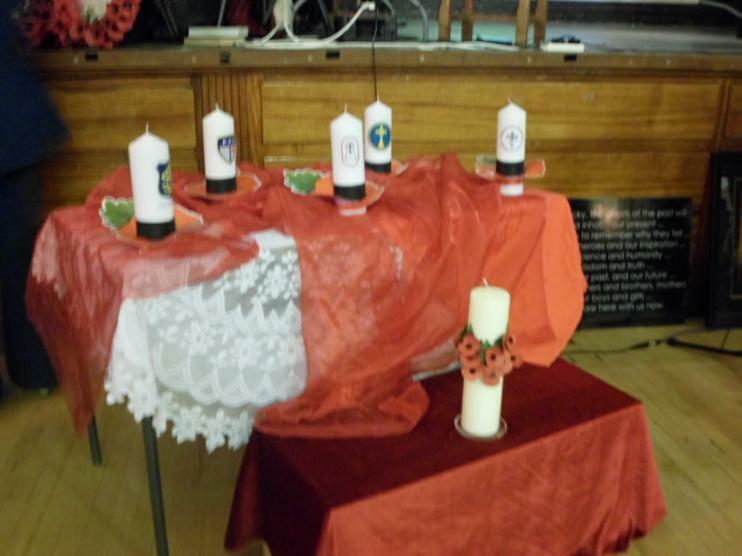 Children from all the other primary schools in Padiham joined together in Padiham Town Hall, to commemorate all the fallen soldiers at the 11th hour, on the 11th day of the 11th month. 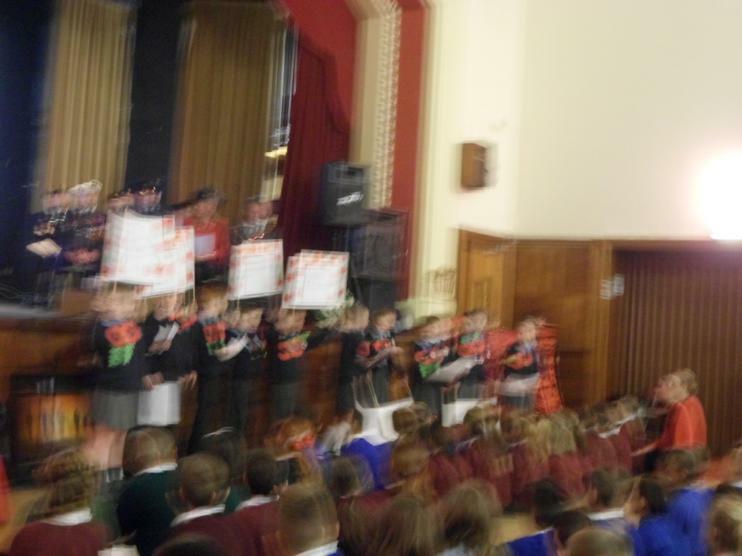 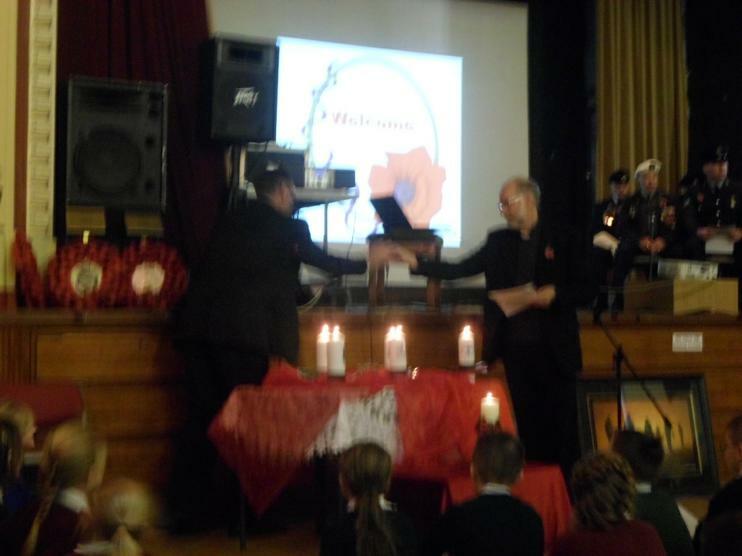 Each school brought with them an A1 size letter from the word PEACE. 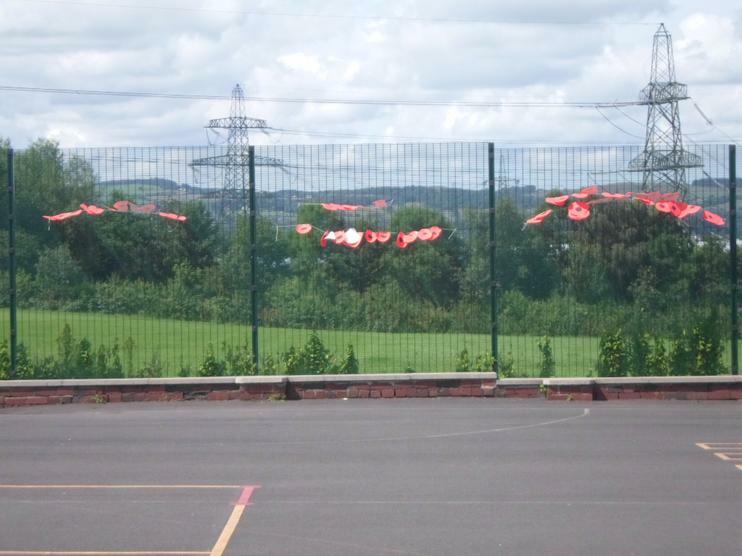 Our school had the letter A made by the children in Year 2. 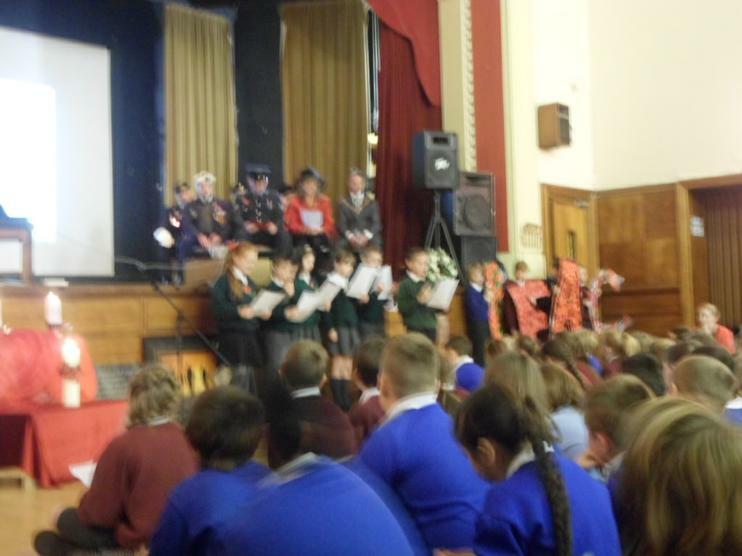 The children in Years 3 and 5 spoke and sang about the letter A. 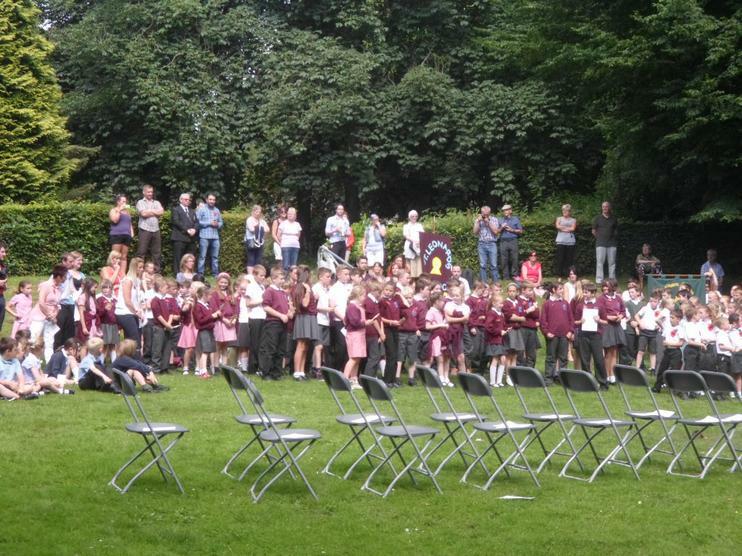 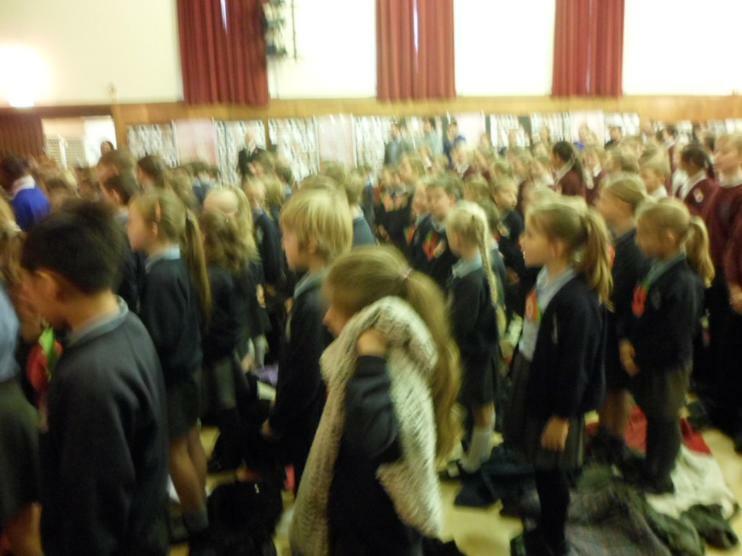 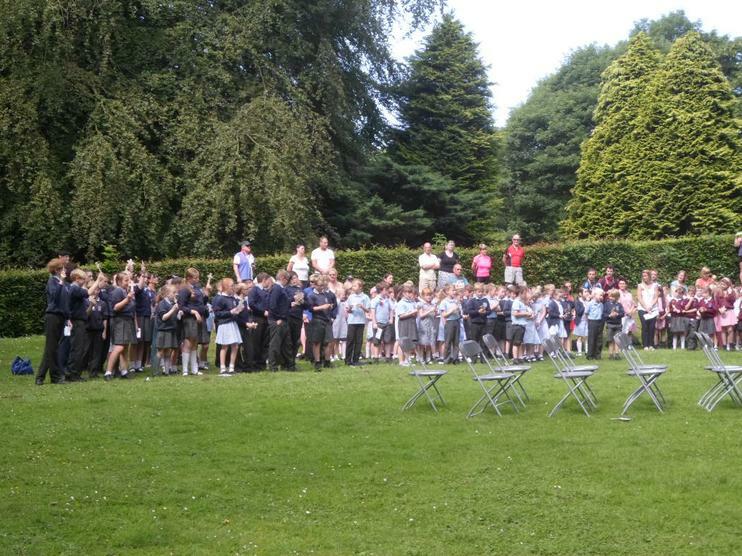 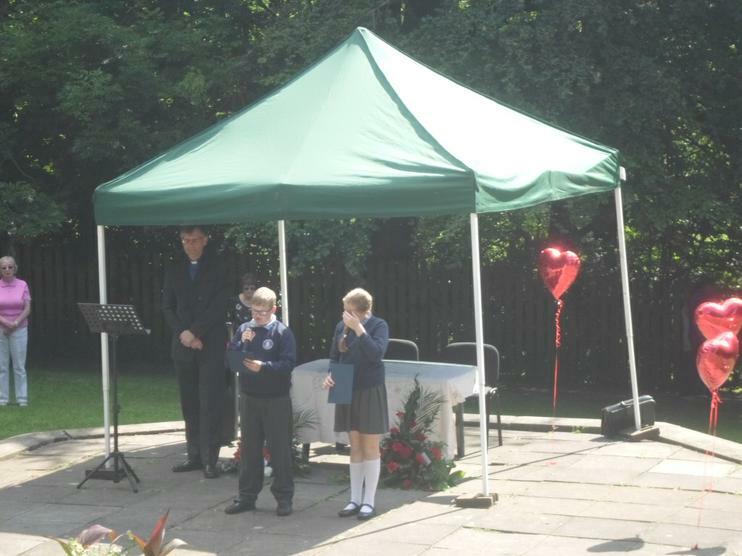 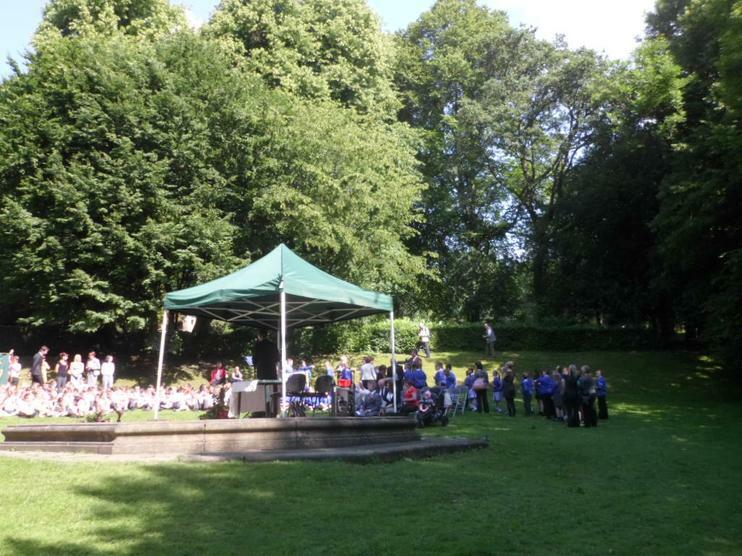 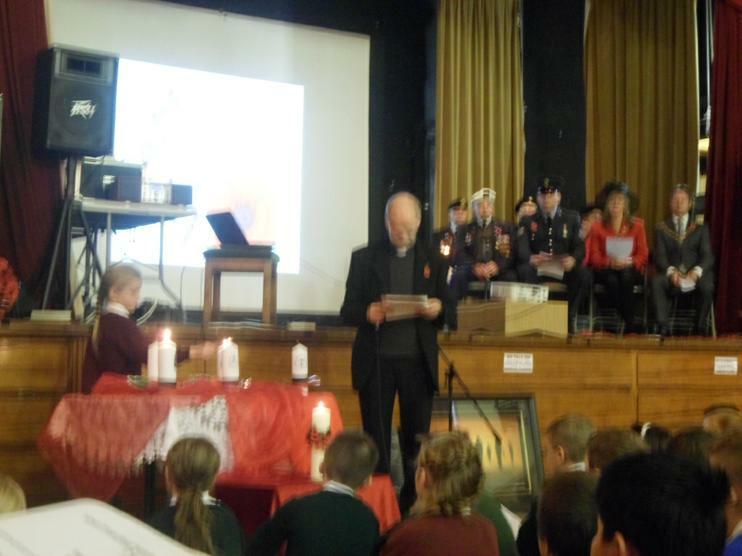 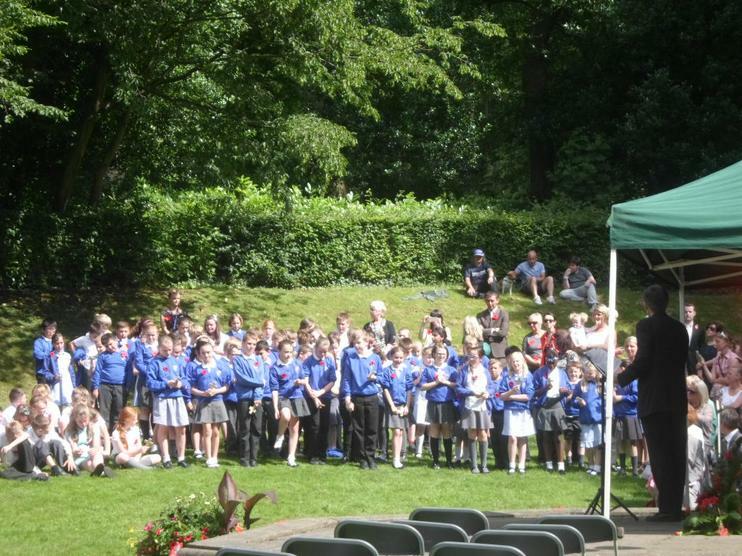 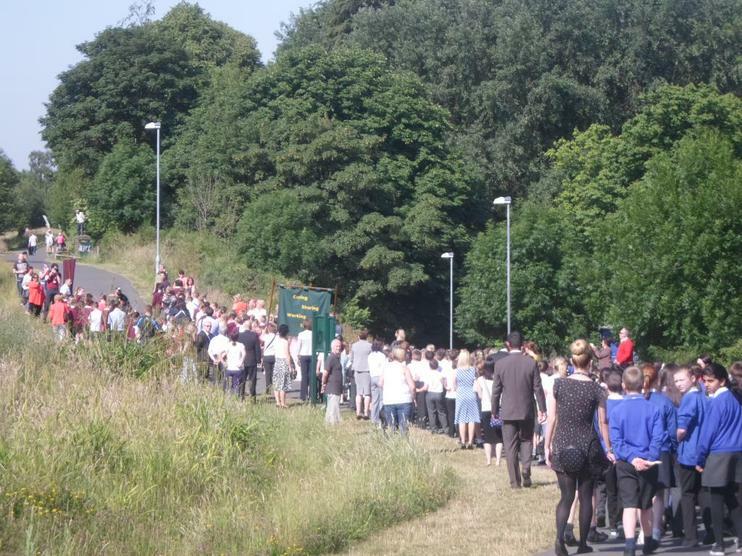 We all stood together to listen to the Last Post followed by a two minute silence. 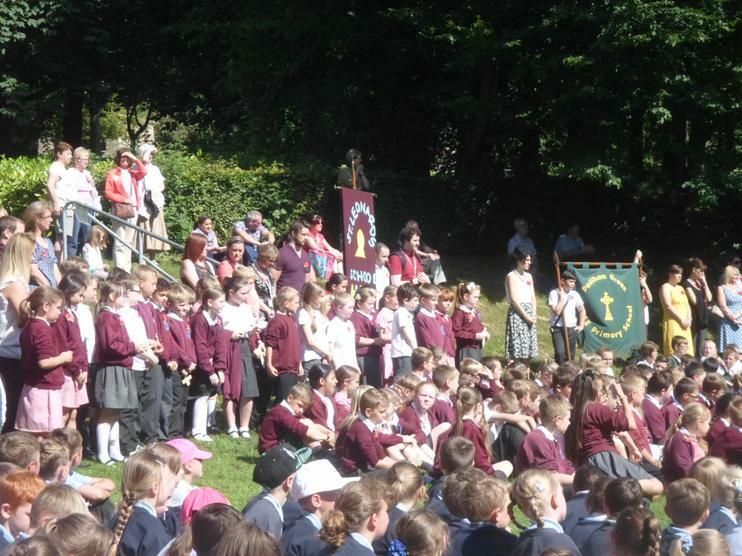 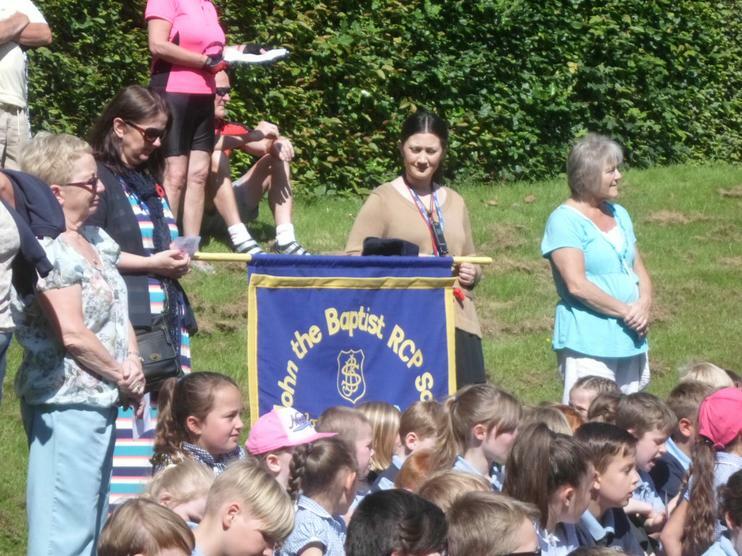 St John's would like to thank all the staff, children and volunteers who made today possible. 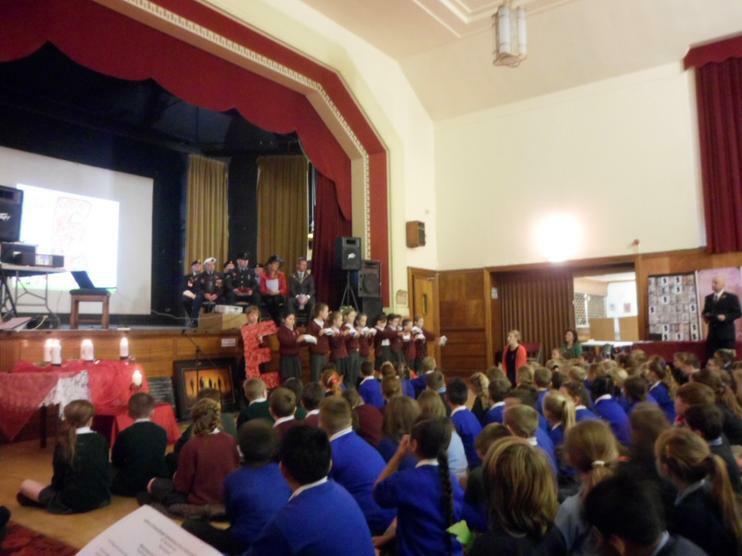 On Monday 10th November at 2.30pm, the children at St. John's all linked into a live broadcast of a primary assembly from the Tower of London. 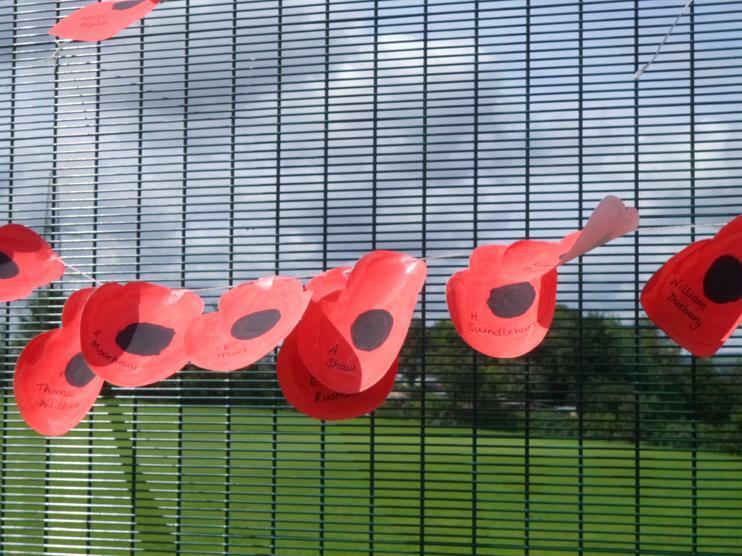 It was wonderful to see all of the 888,246 poppies on display and be a small part of a much greater event. 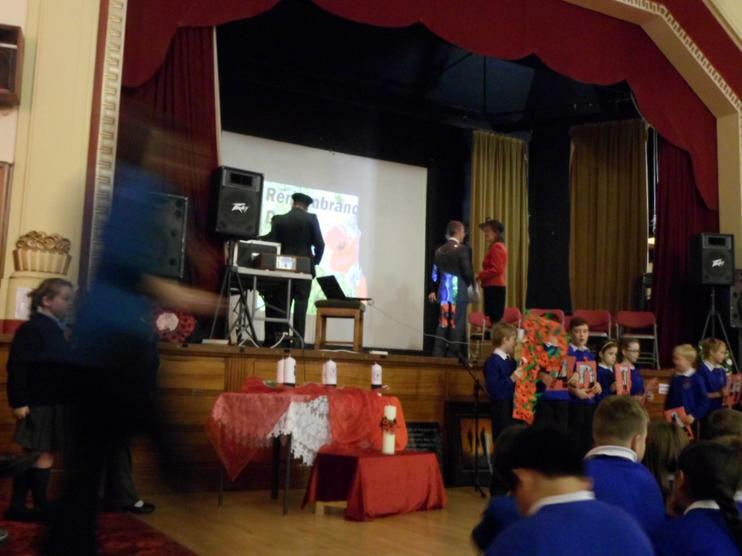 We were even tweeting live whilst we watched it! 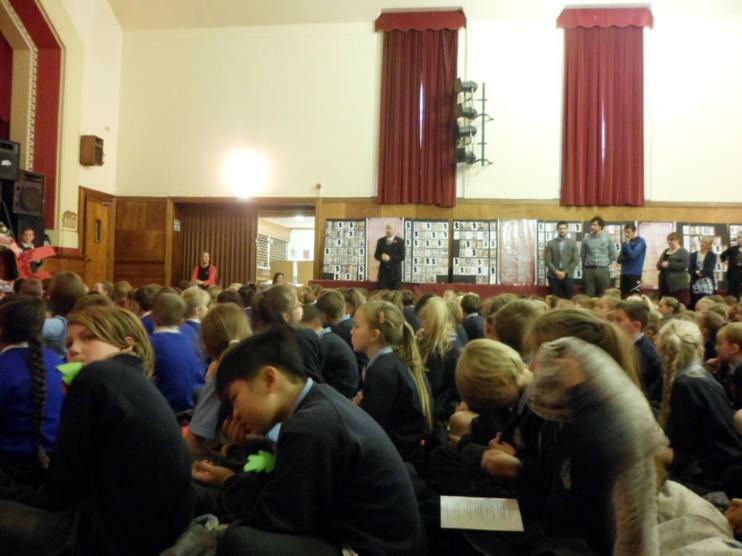 CLICK ON THE LINK BELOW TO WATCH IT AGAIN. 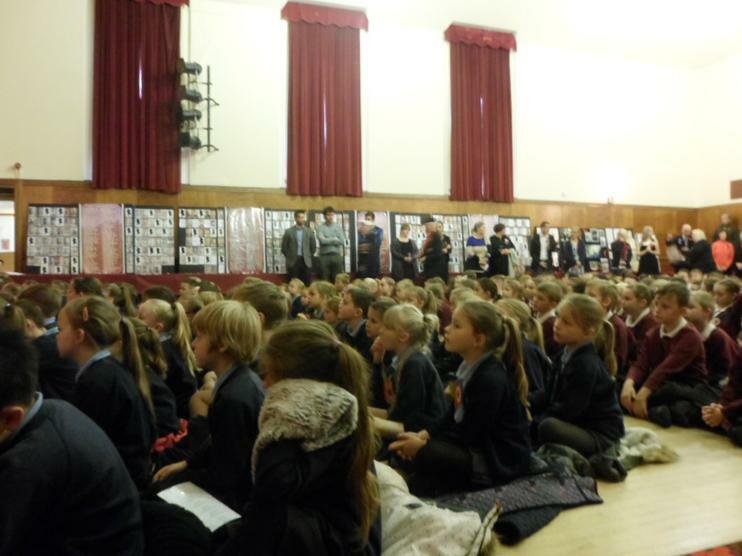 PRIMARY ASSEMBLY LIVE FROM THE TOWER OF LONDON Watch the assembly again from the Tower of London. 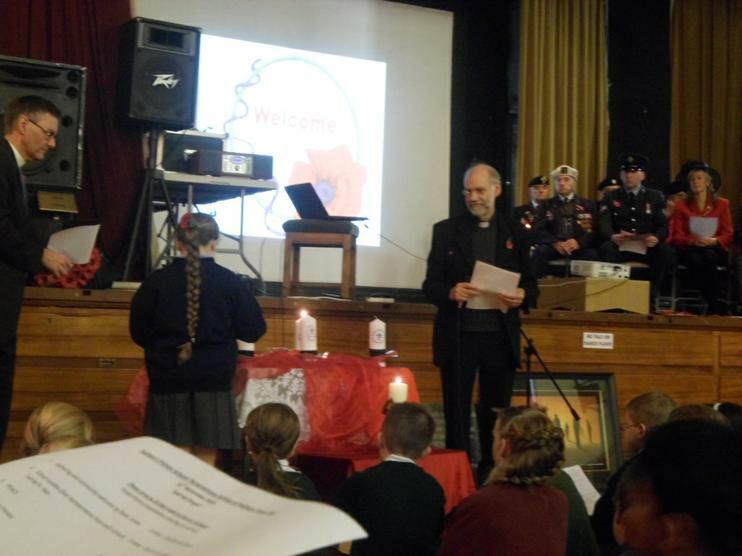 How St. John's will be commemorating the 100th Anniversary of the Great War. 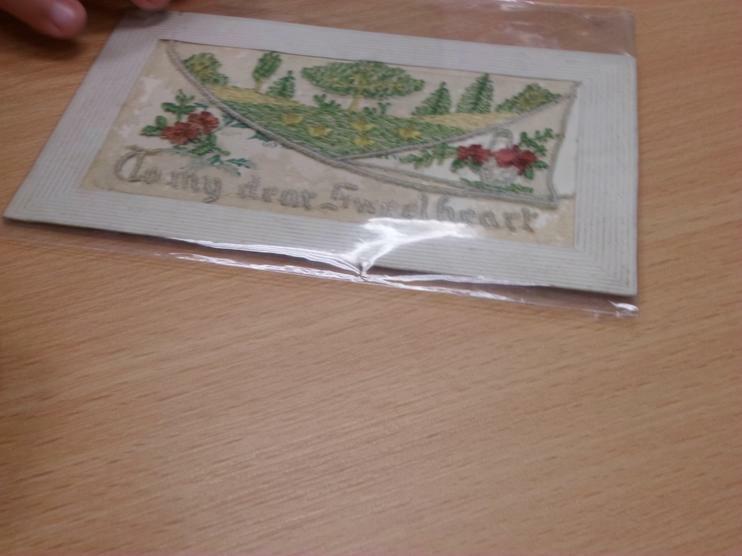 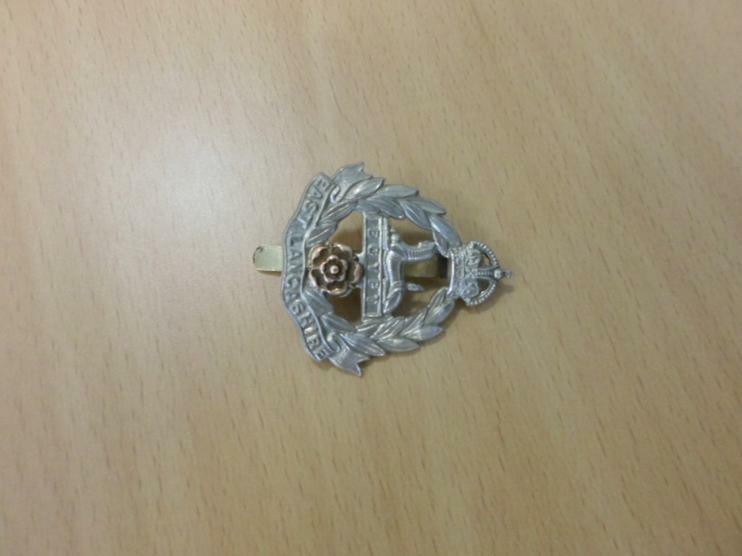 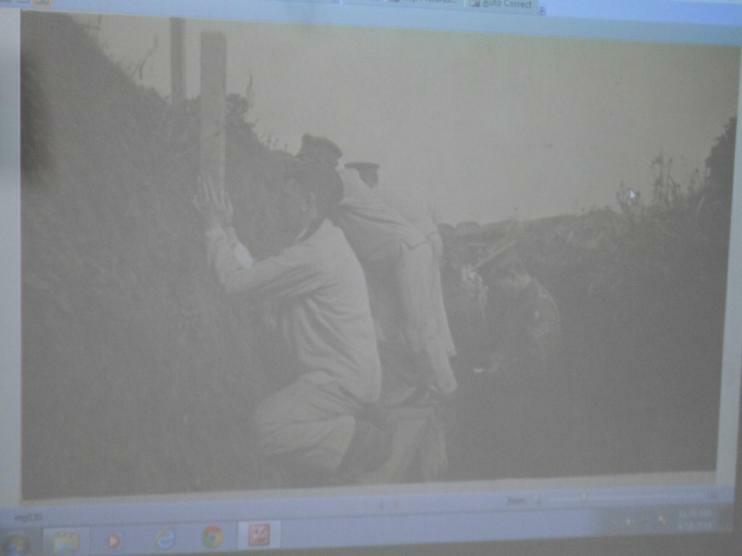 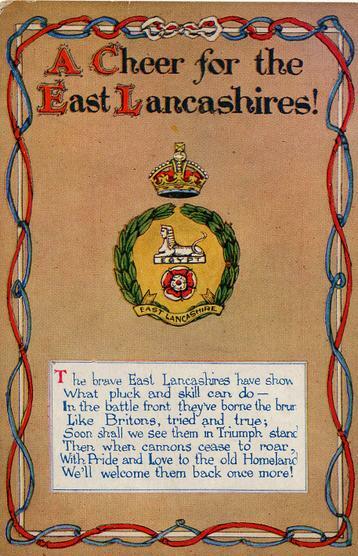 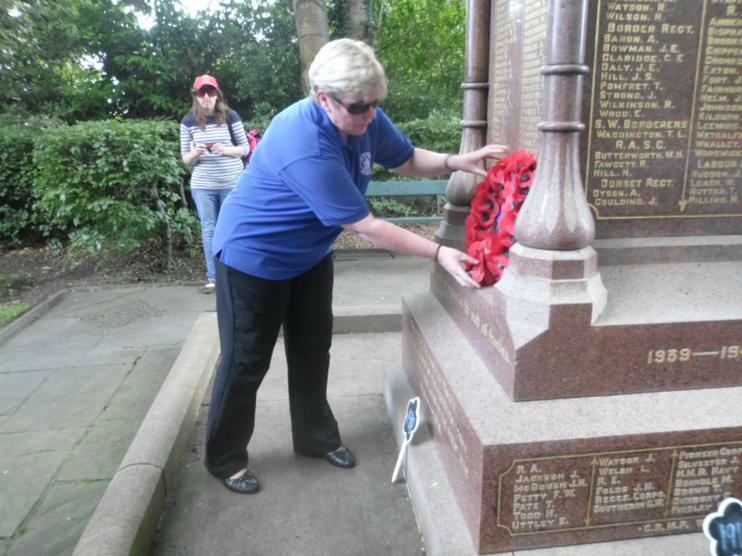 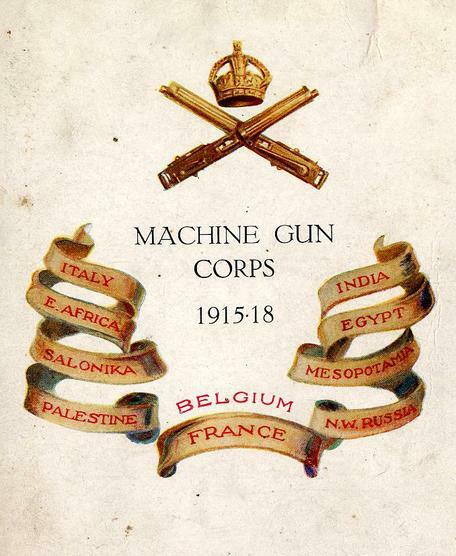 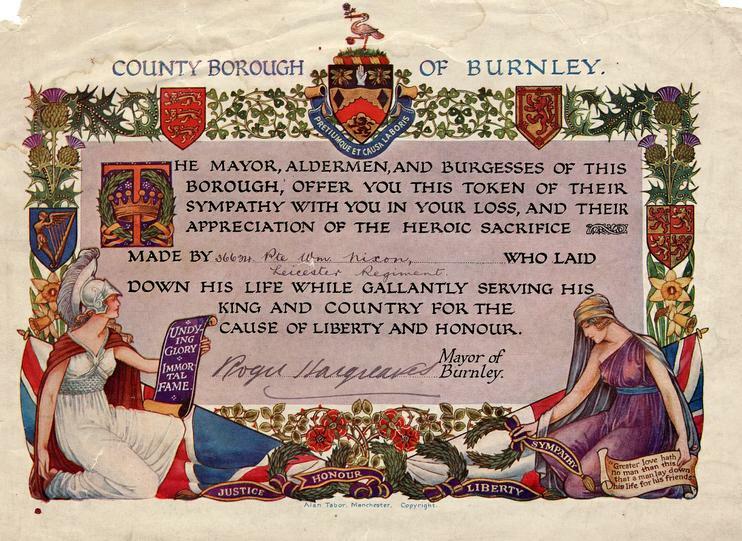 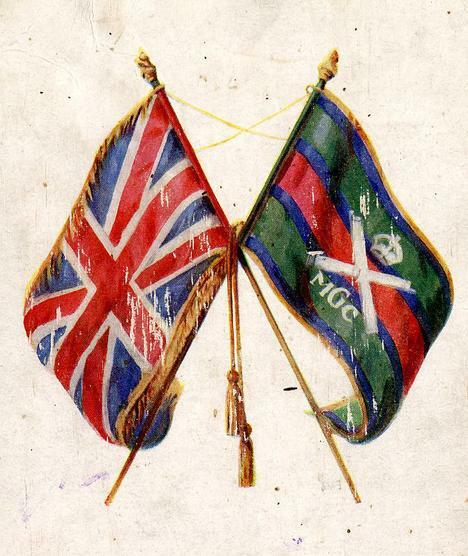 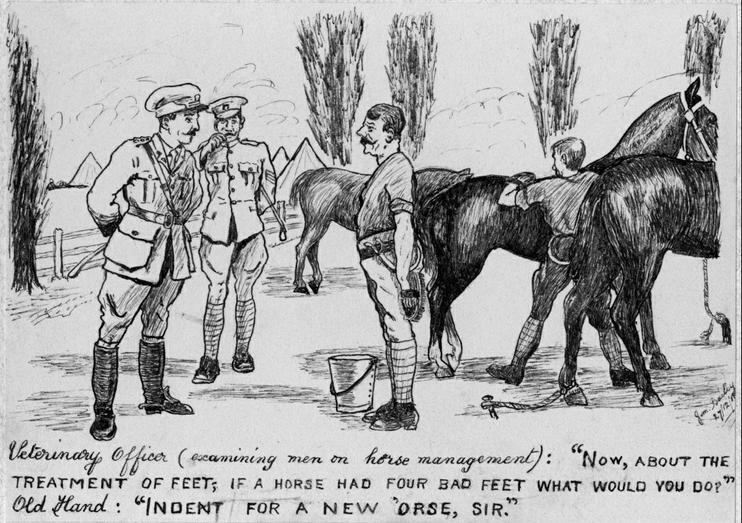 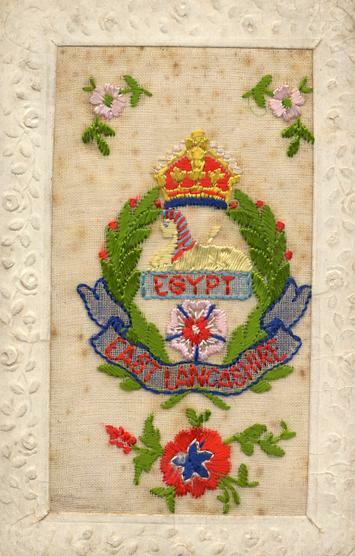 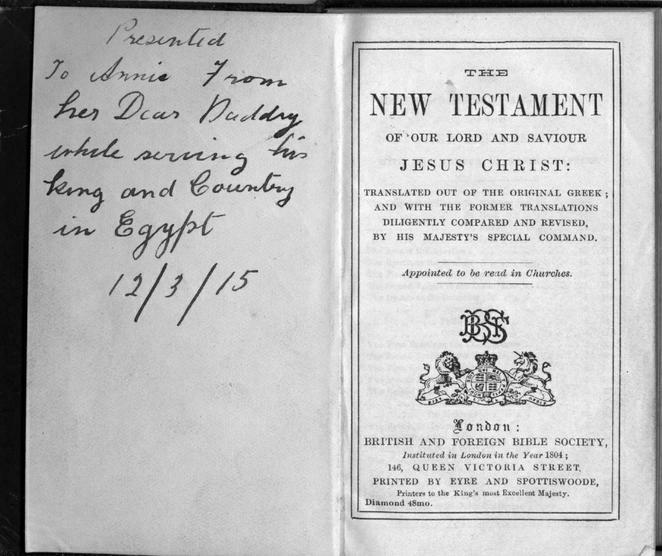 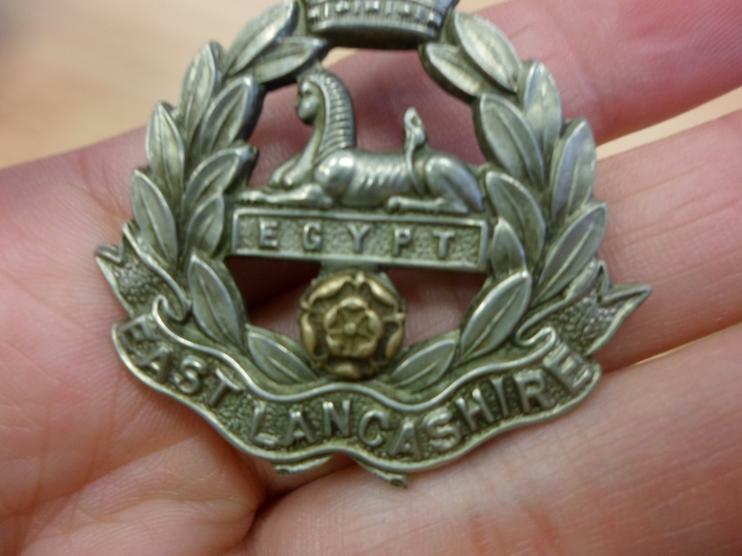 4200 soldiers from Burnley (320 soldiers from Padiham) were killed in the Great War. 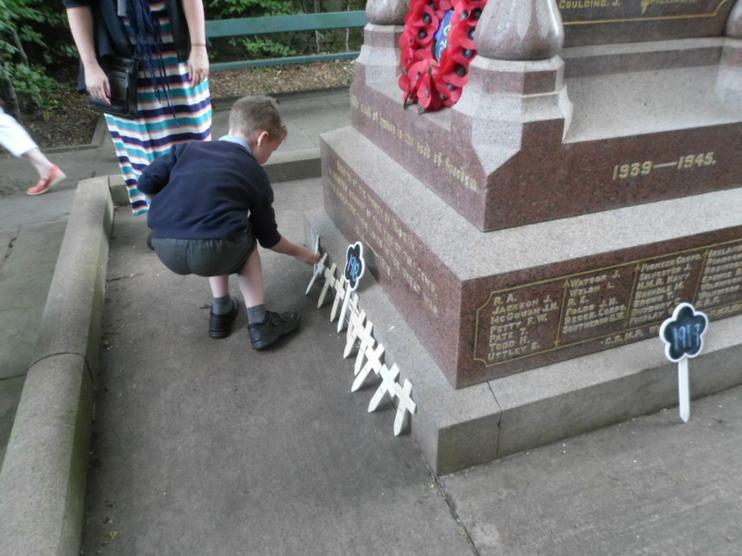 The children are adopting and carrying out a mini project about that soldier. 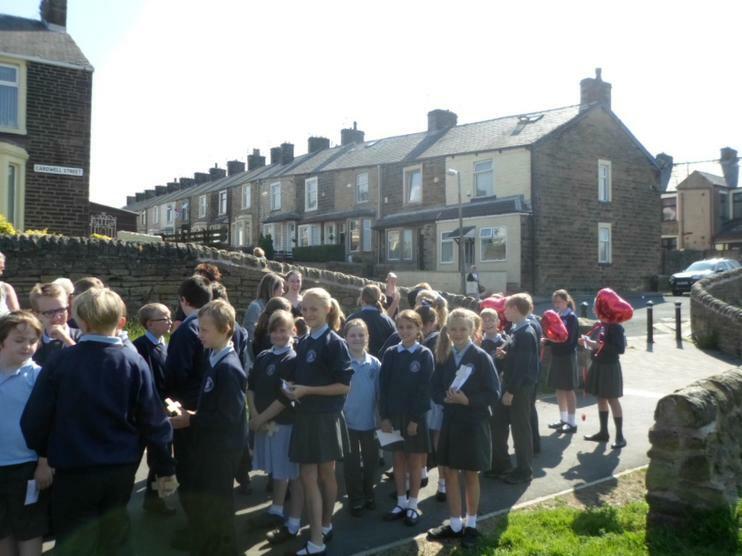 All the projects will go back to Townley Hall and be made into a book. 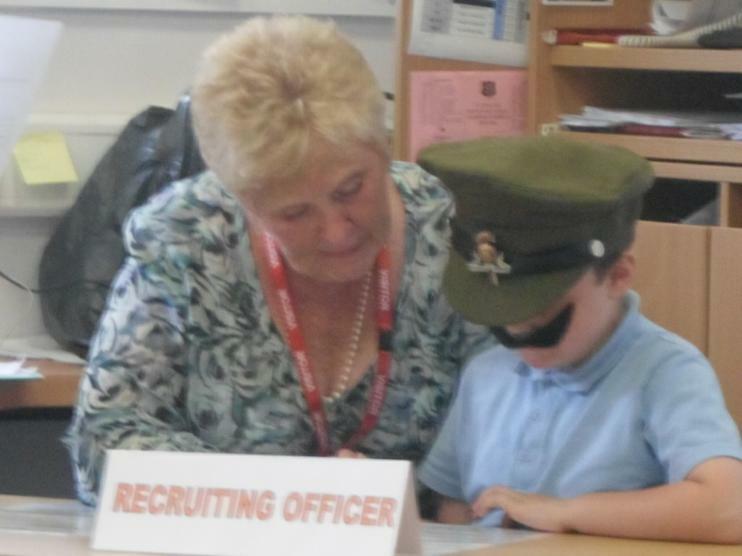 100 stories will be chosen and published and each child that adopts a soldier will receive a copy of the book. 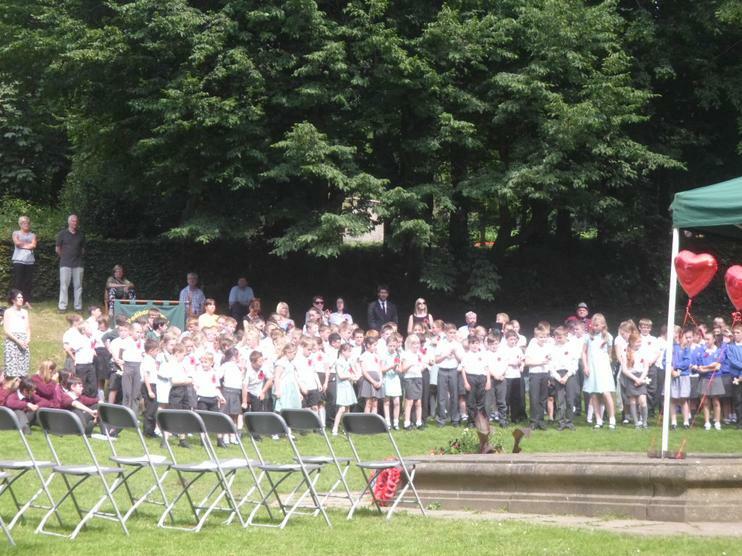 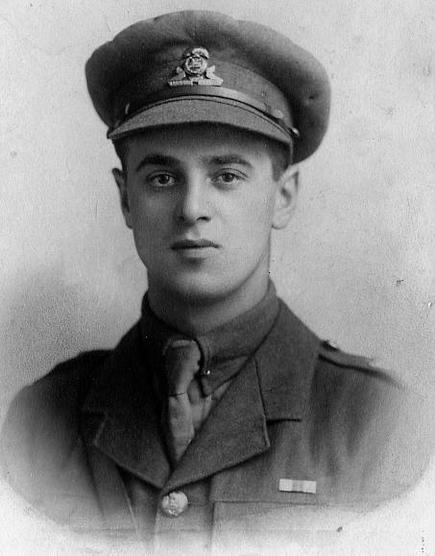 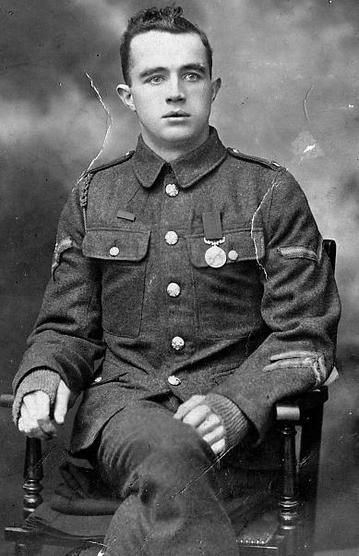 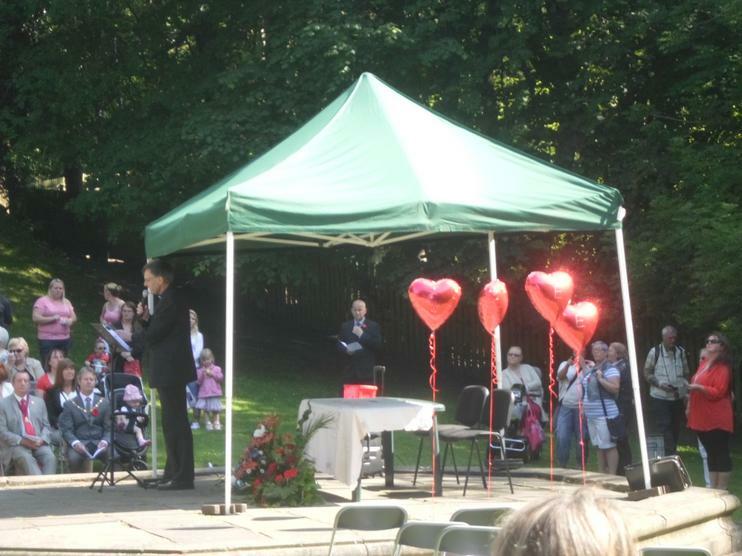 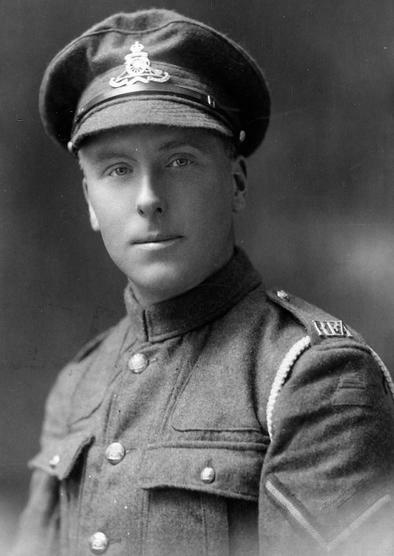 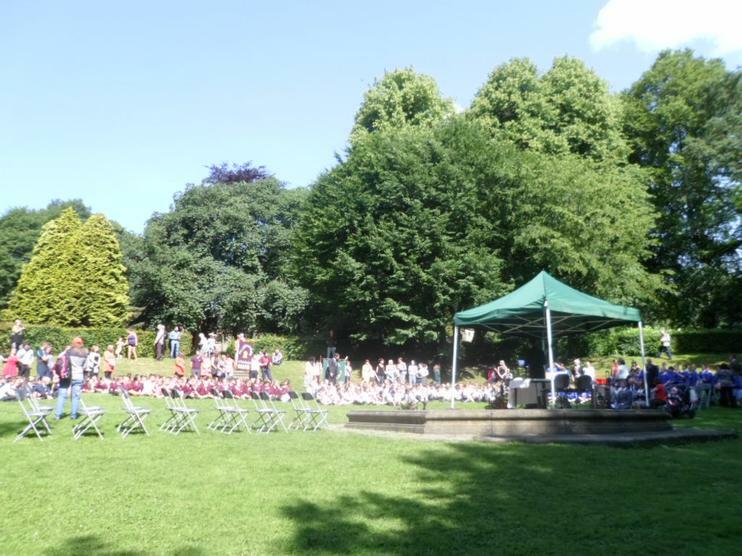 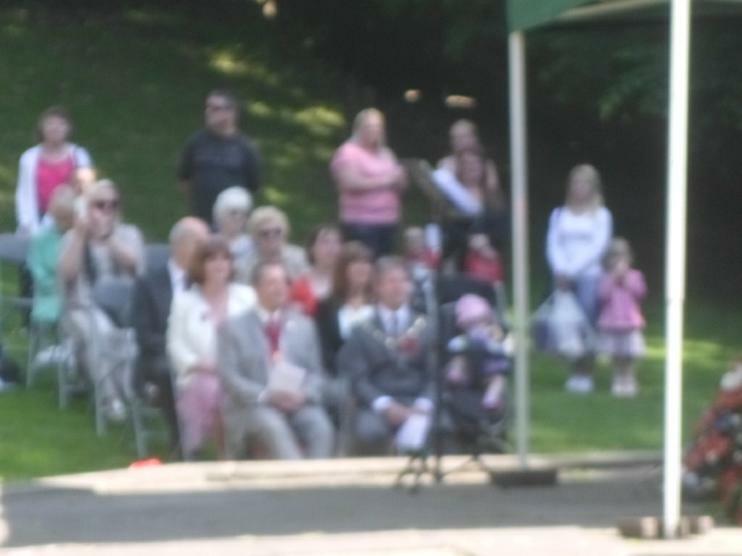 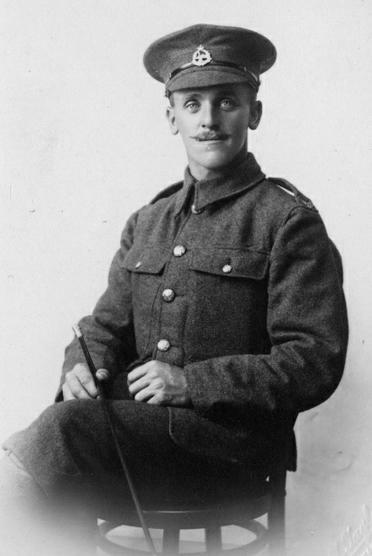 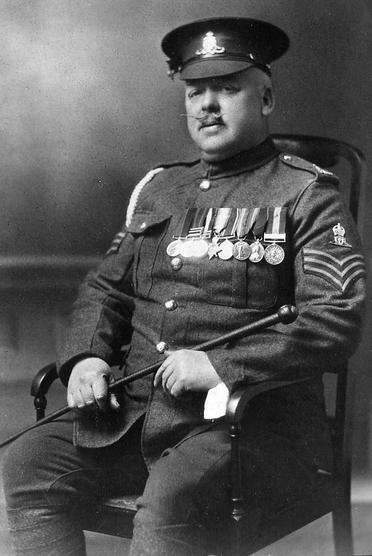 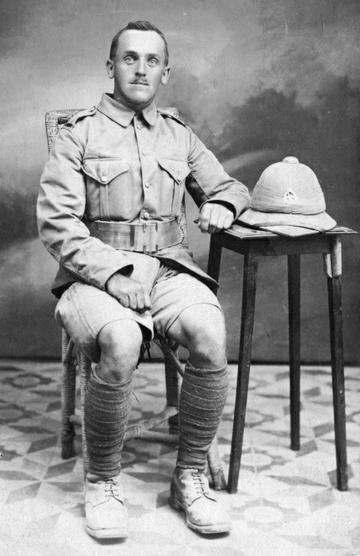 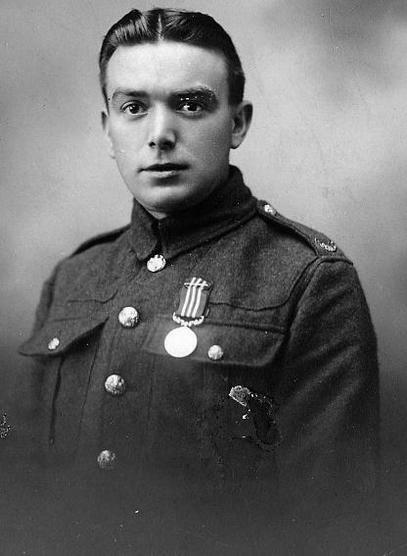 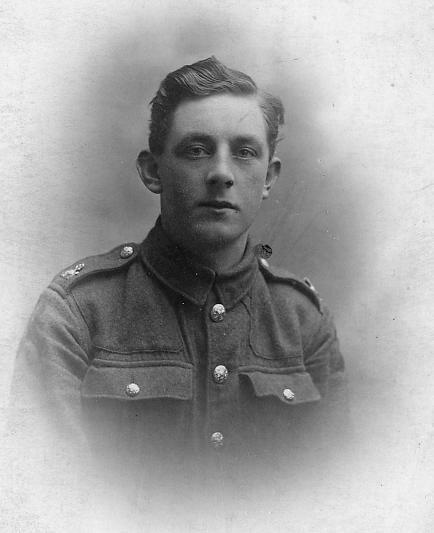 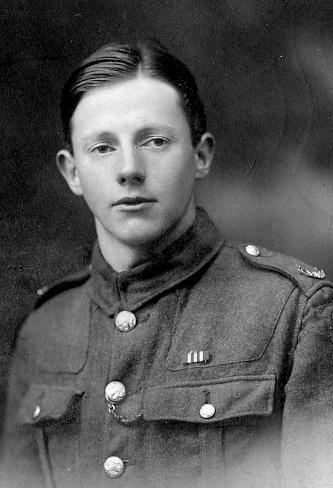 The soldier’s name will be written on a wooden cross and will be laid in Padiham Memorial Park in year order (1914-1918). 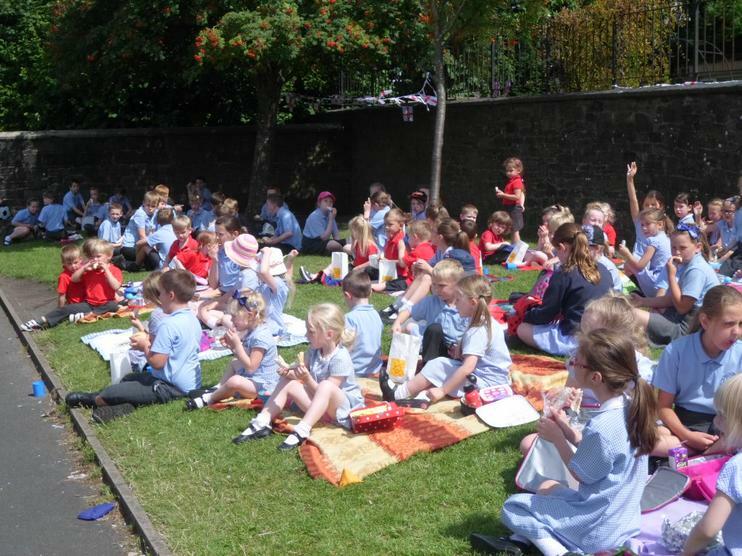 The date for this is Tuesday 1st July. 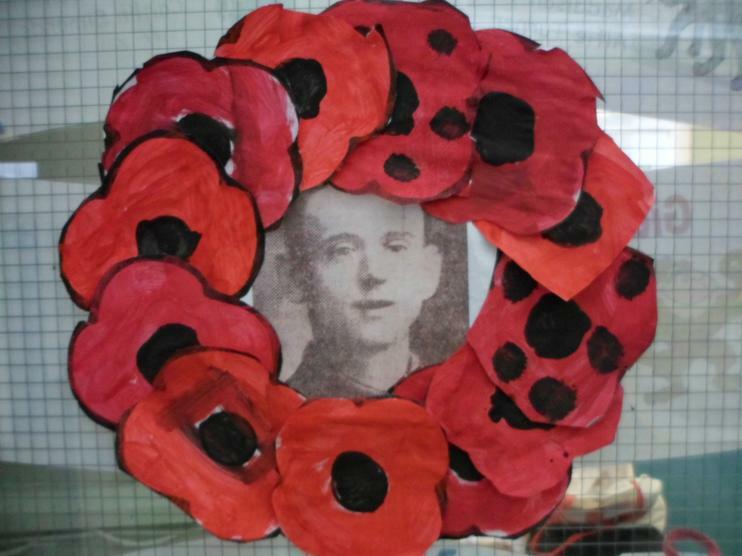 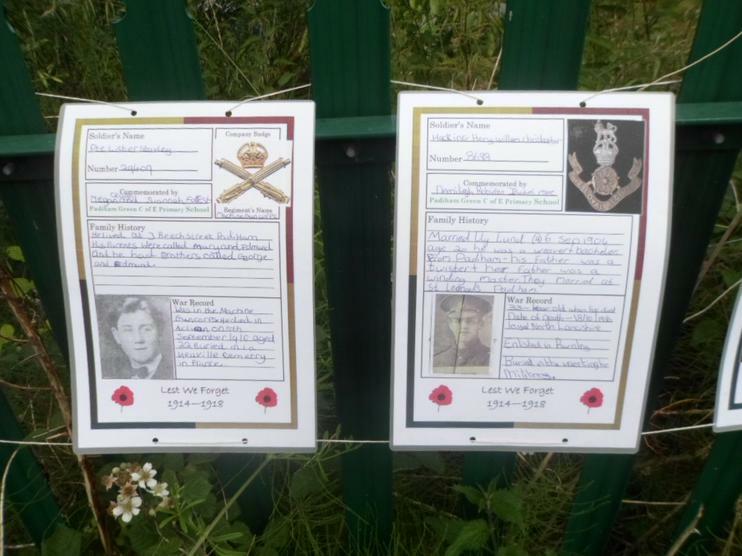 These are the names of the Padiham Soldiers that our school has been given to research and produce projects on. 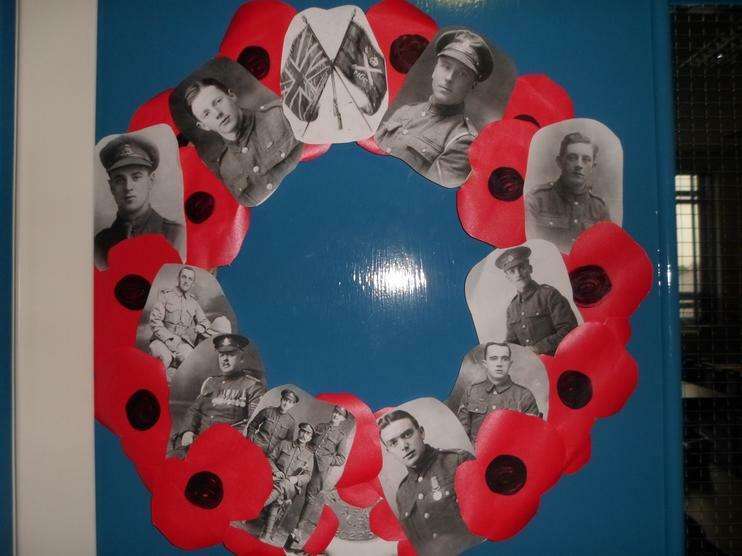 If you have any information, photographs or memorabilia about any of these soldiers who may be relatives or family friends, please let Mrs Collins know as soon as possible. 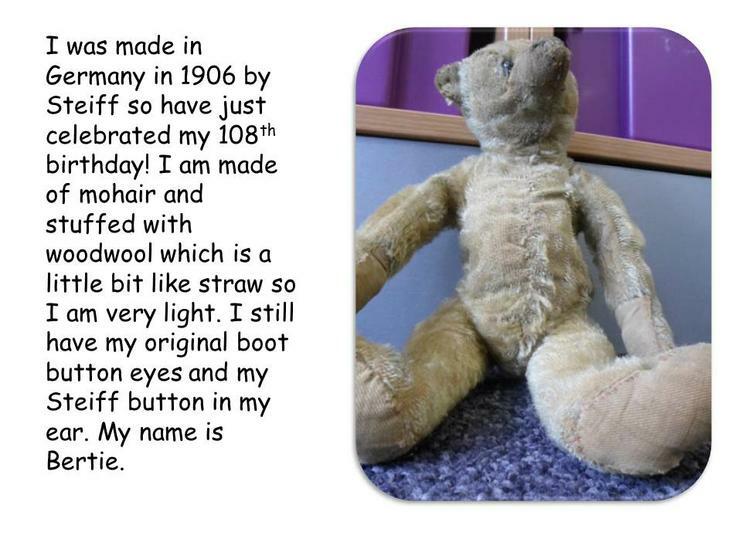 We will take copies and photographs of any information that you send and these can be included in the projects the children will be producing. 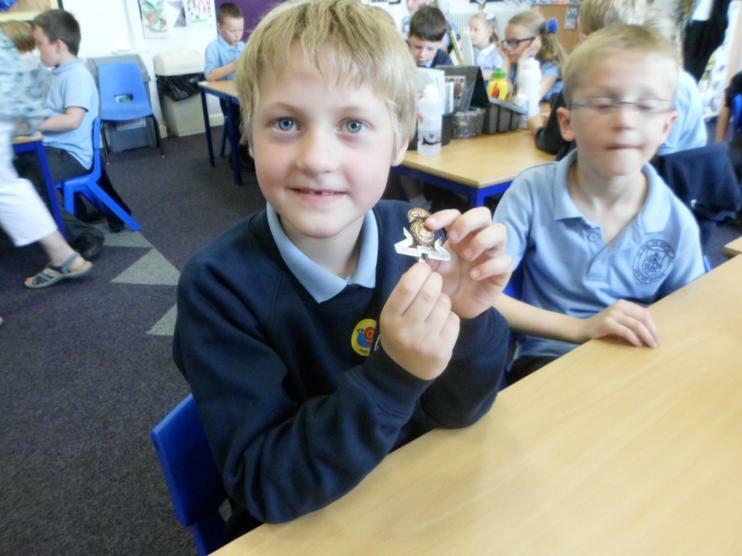 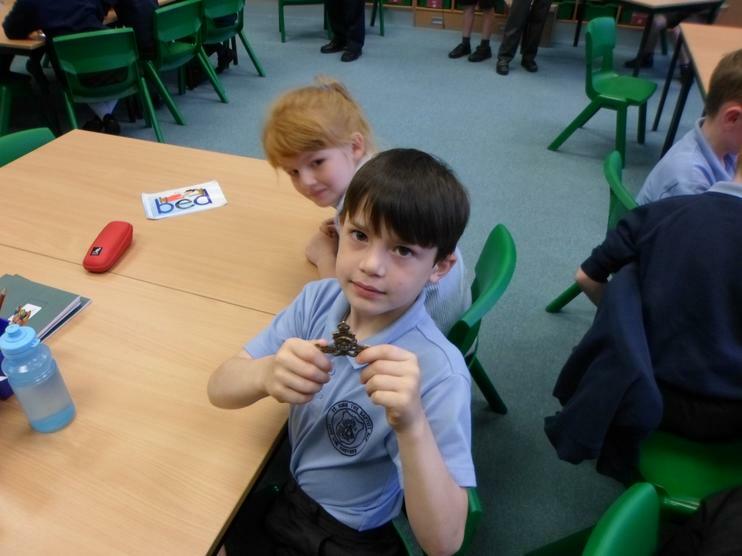 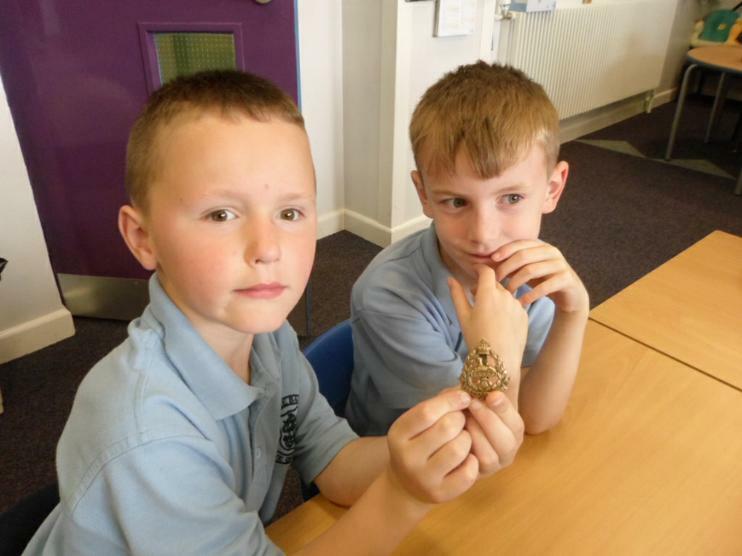 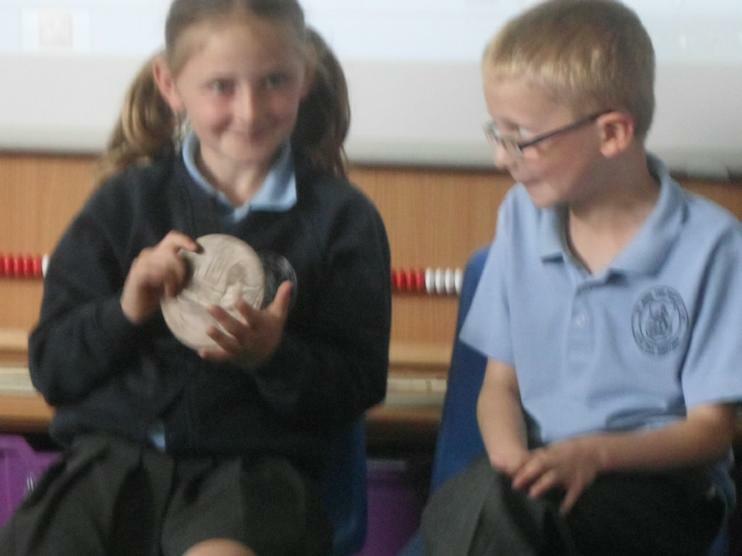 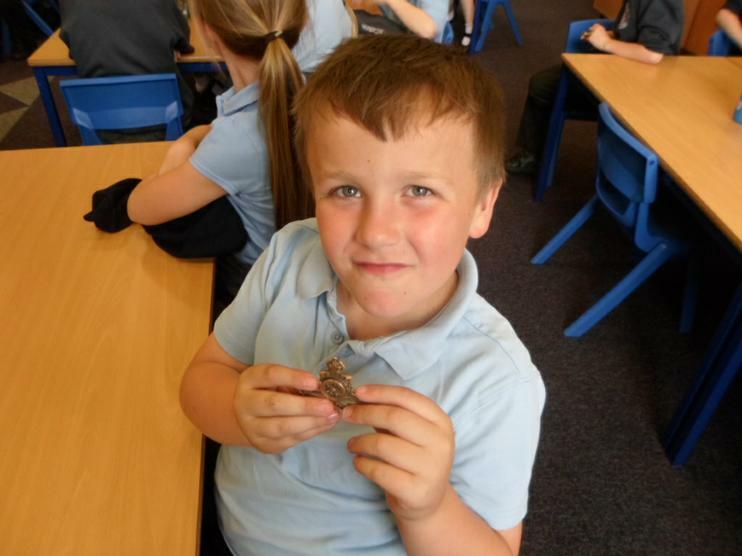 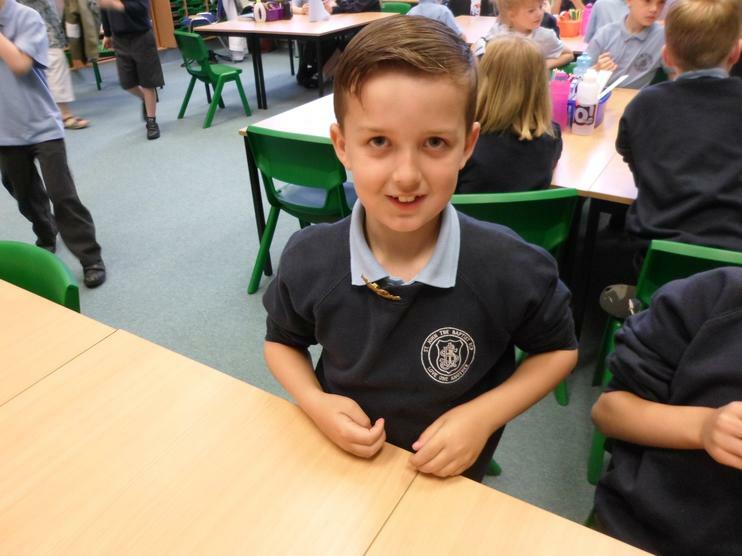 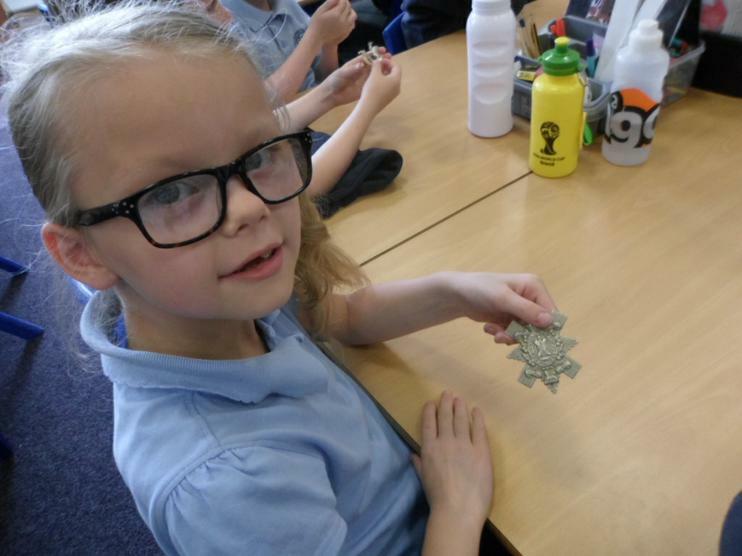 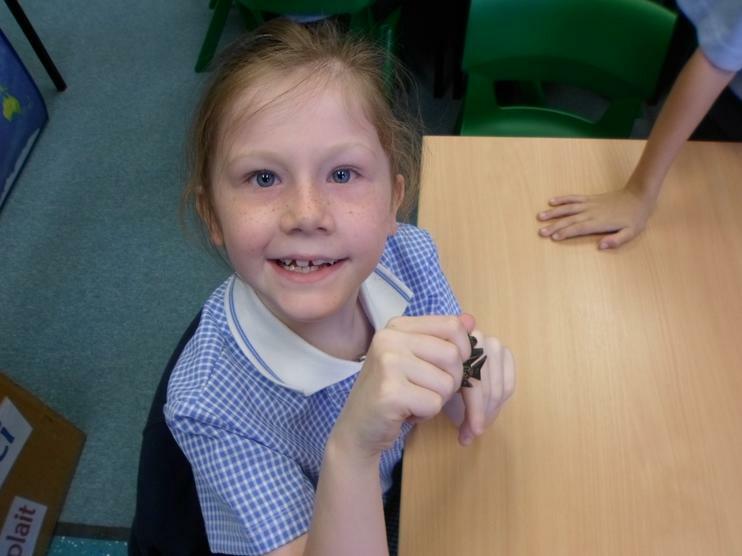 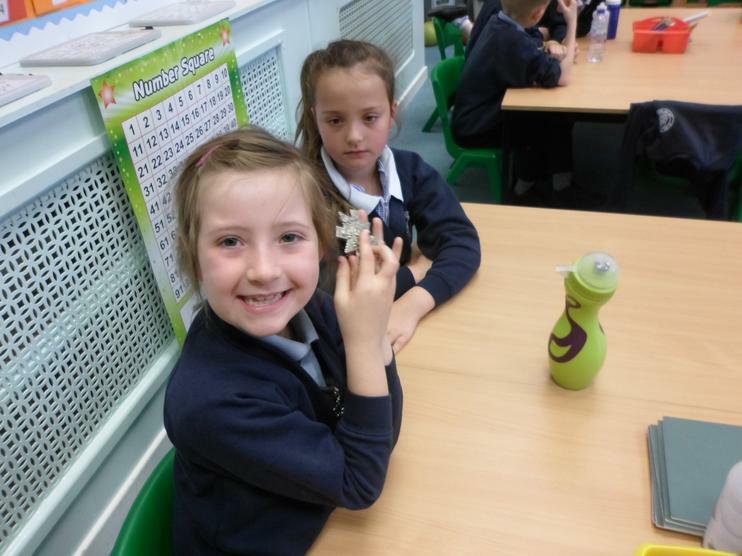 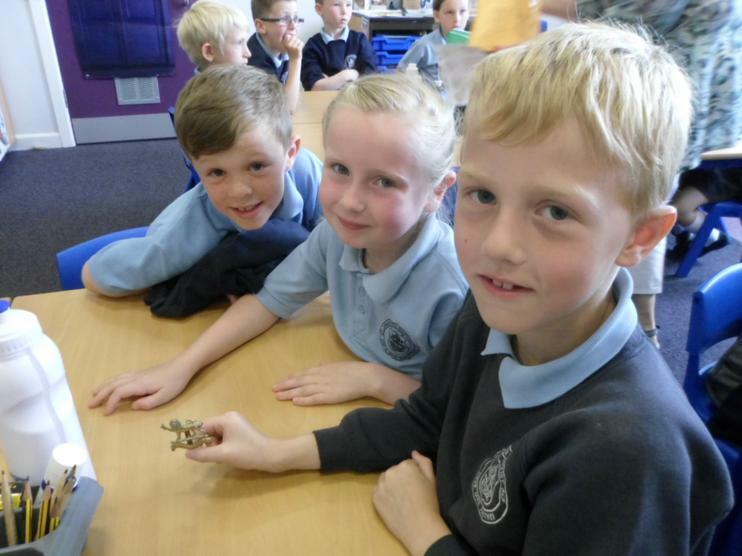 Click on the link below (year 2) to look at all the memorabilia that the children in Year 2 have been bringing in. 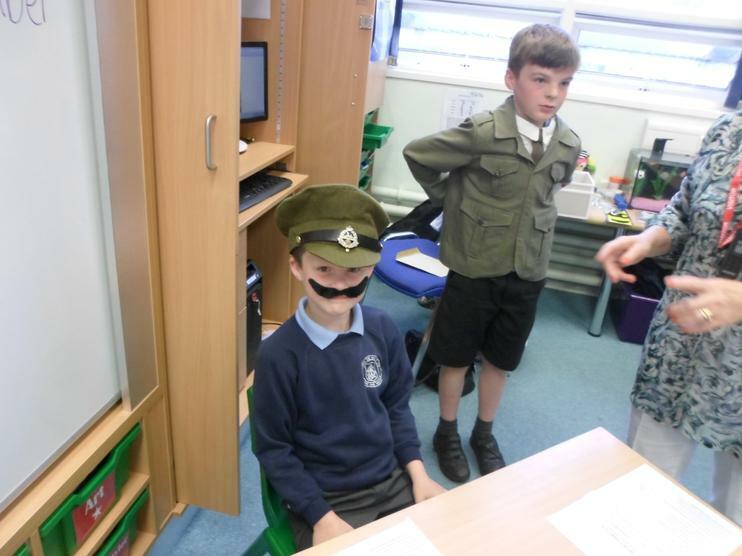 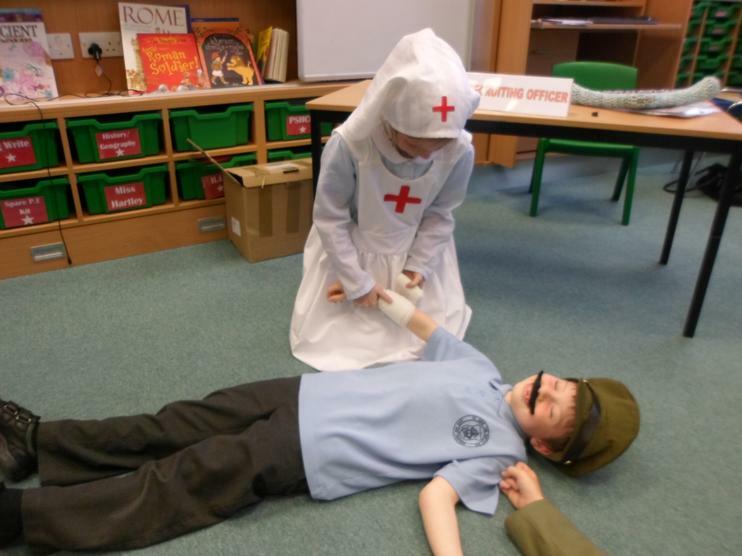 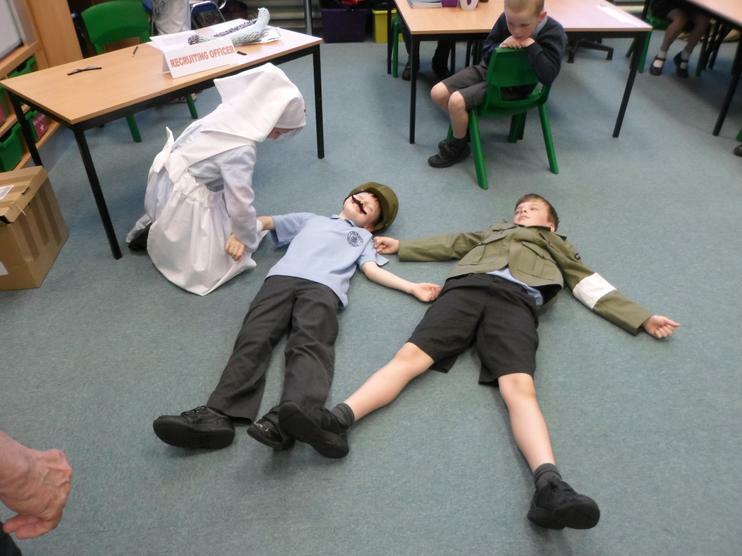 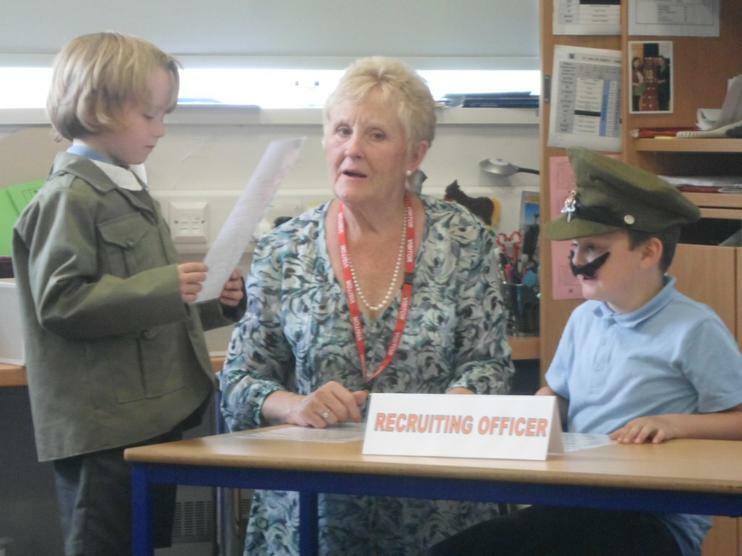 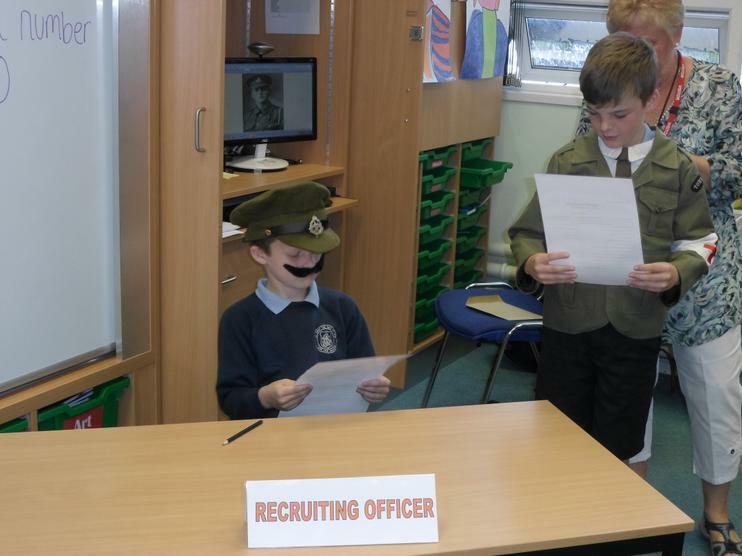 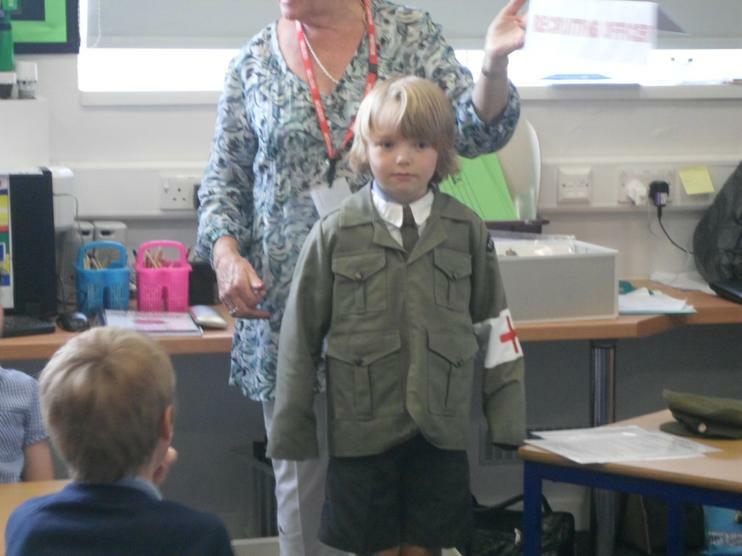 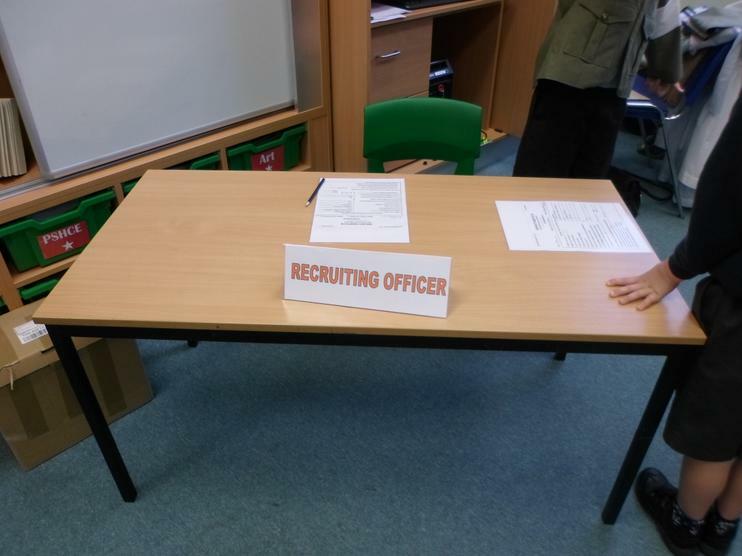 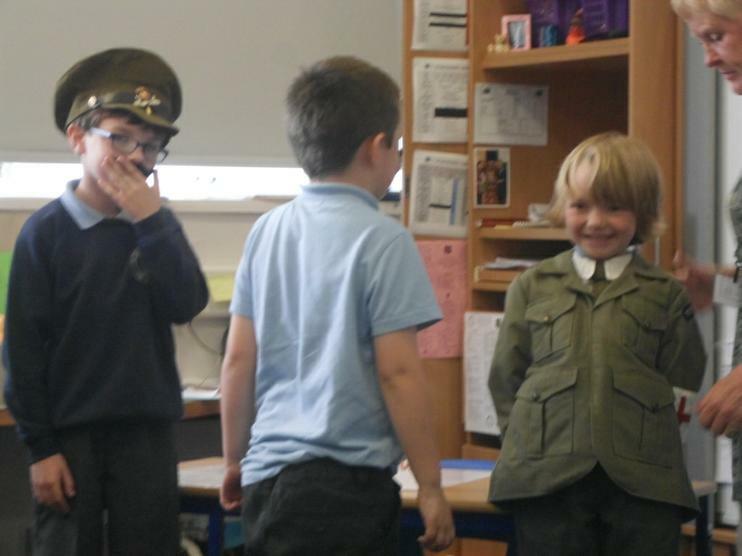 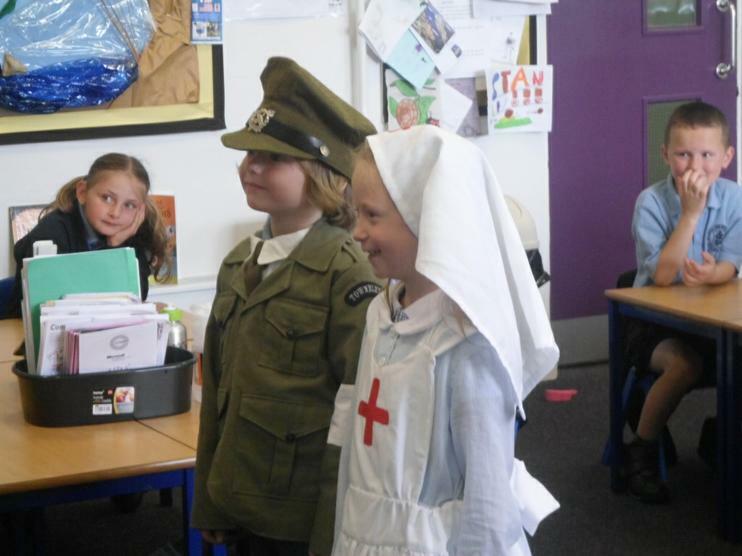 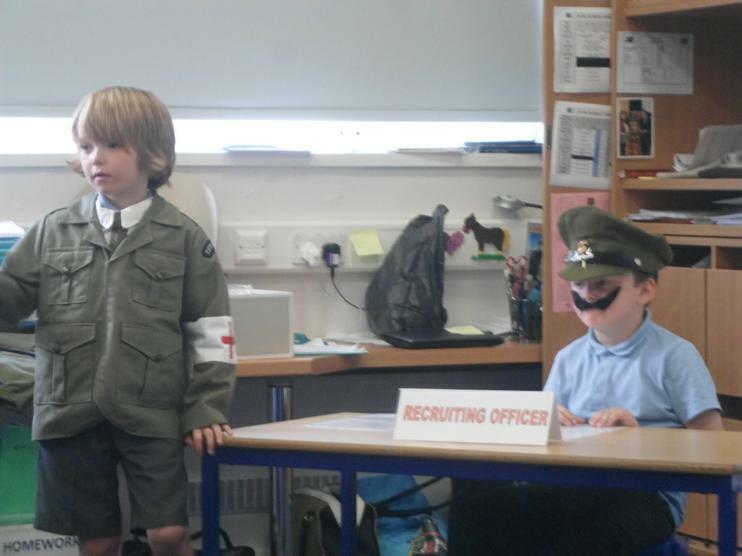 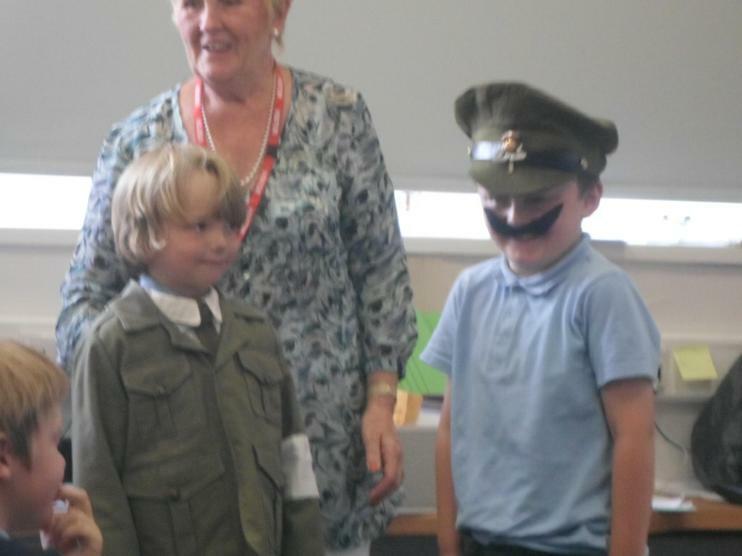 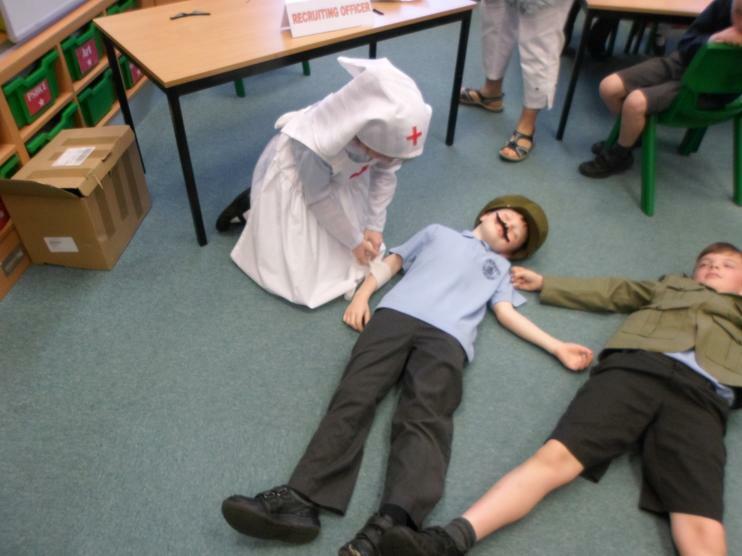 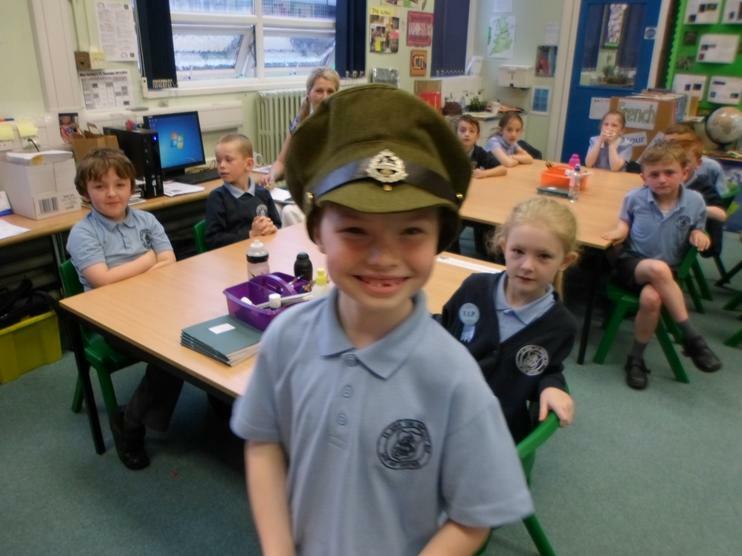 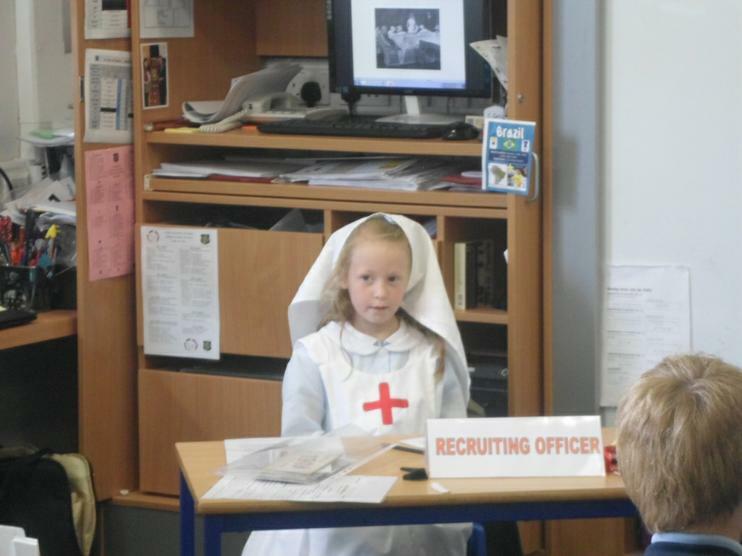 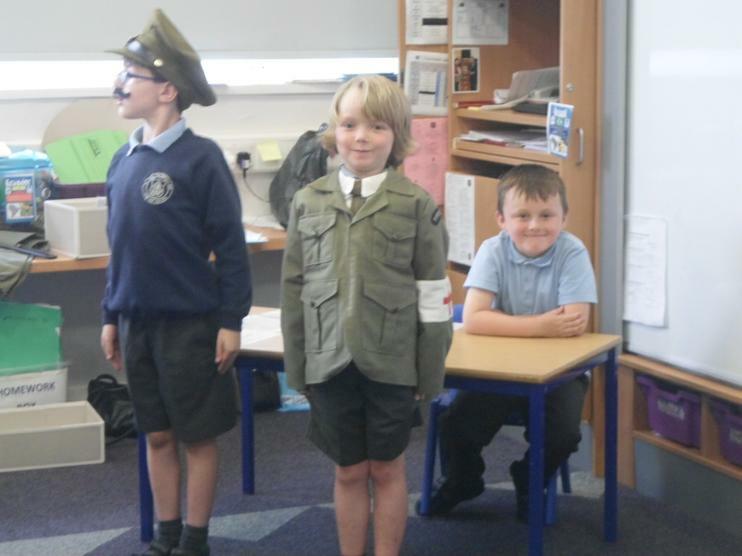 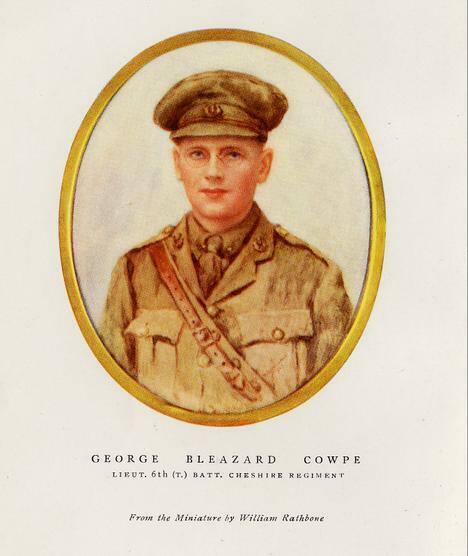 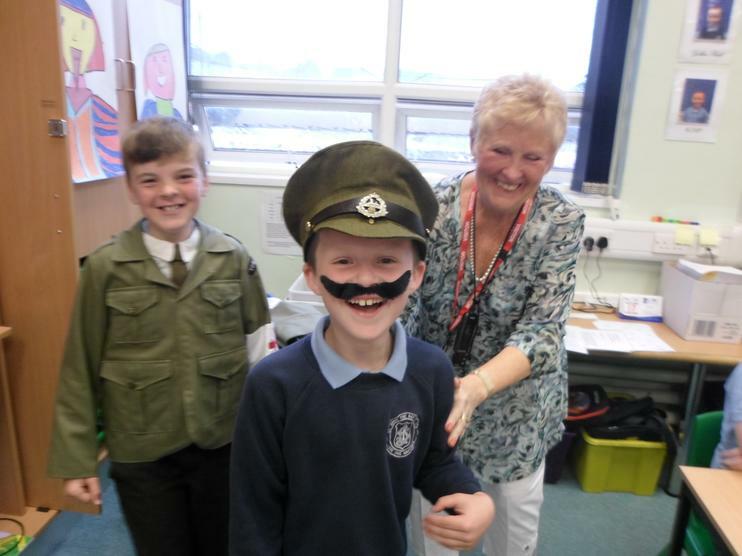 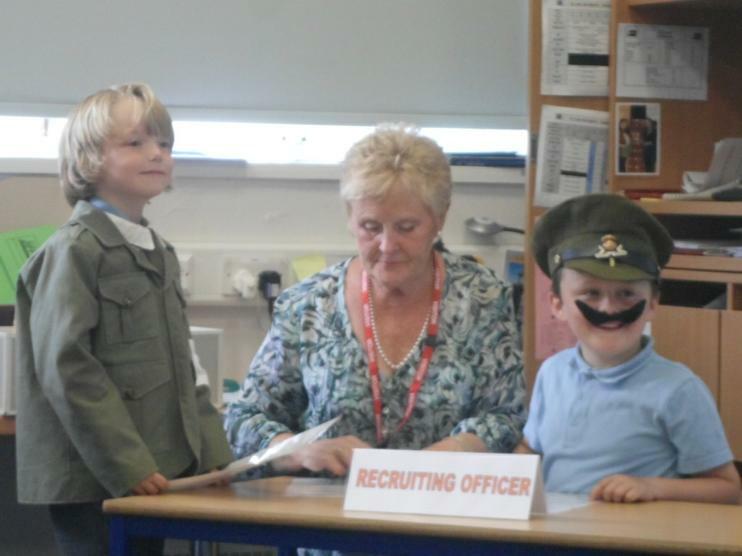 This links to their Literacy topic they have been studying about World War I. 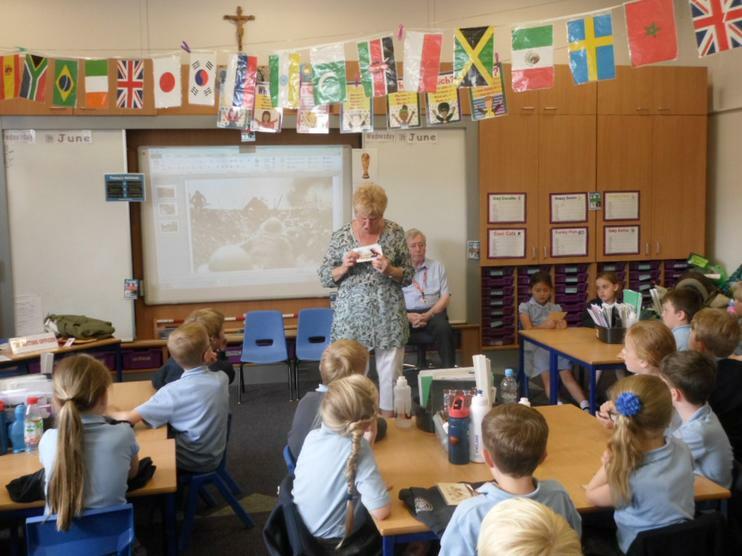 All the photos are of memorabilia from the relatives of the children in Year 2. 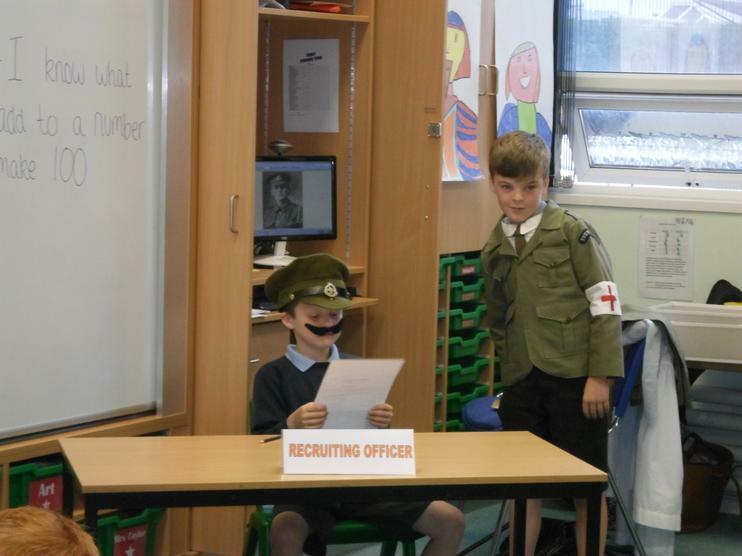 Even though this is about World War 2, we thought that this deserved to go on this page. 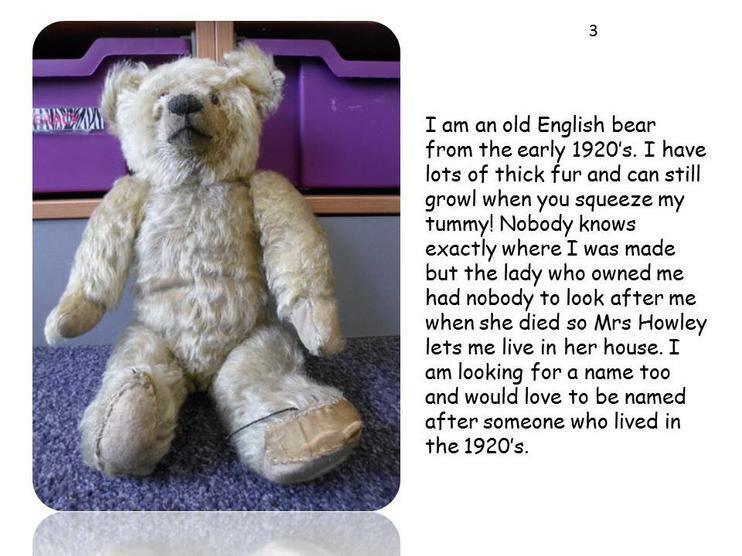 As you may have heard on the news last week, a 89 year old veteran called Bernard Jordan went missing from a care home in East Sussex. 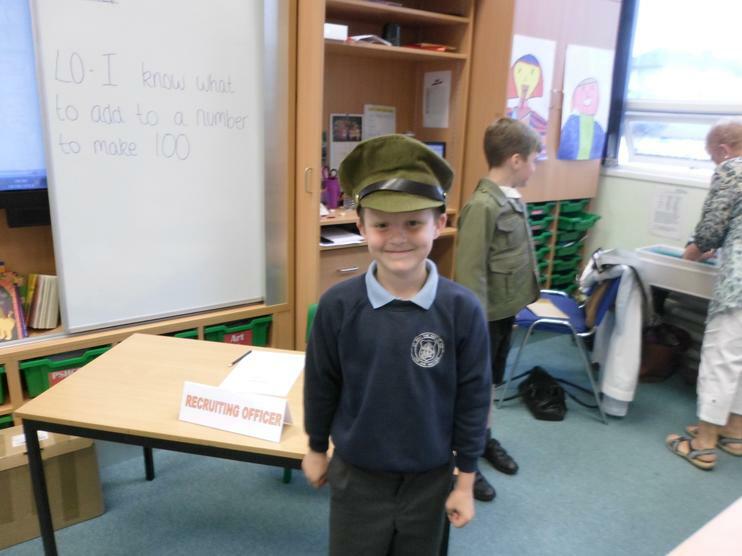 Thankfully, he was found safe and well in Normandy, France where he had gone to commemorate the 70th anniversary of the D-Day Landings. 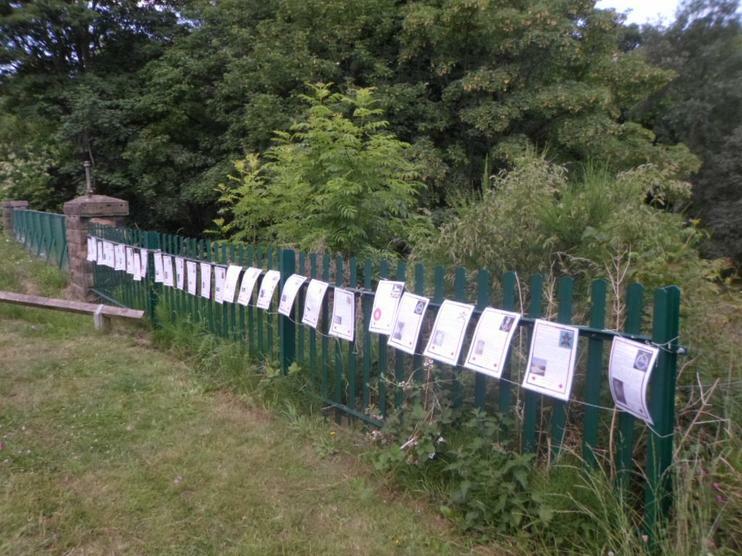 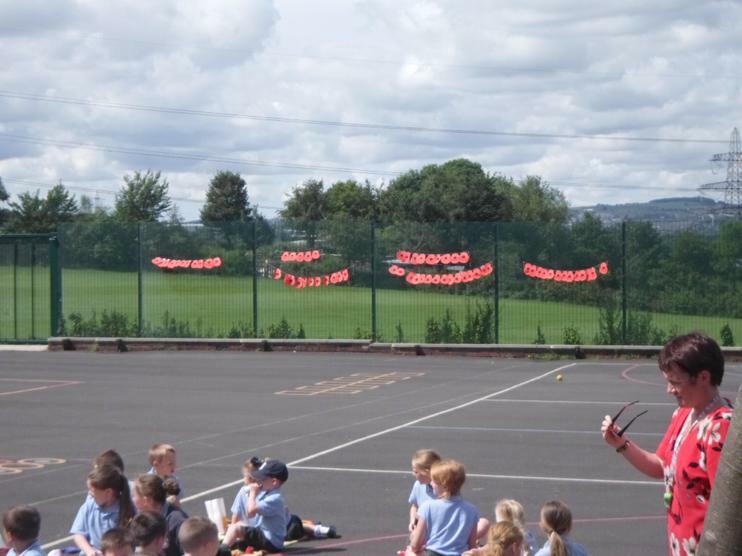 The children in Year 2 and Year 3 were so inspired by his determination that they wanted to let him know. 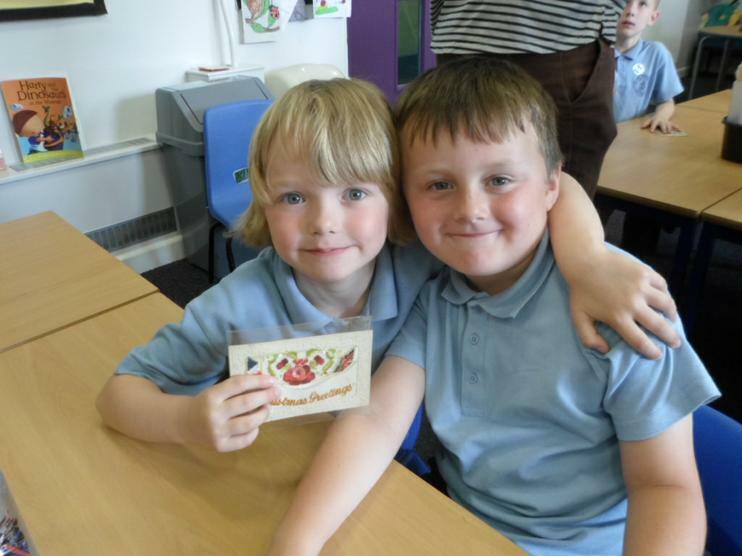 We discovered that he will celebrate his 90th birthday on Monday 16th June so both classes have made him a birthday card. 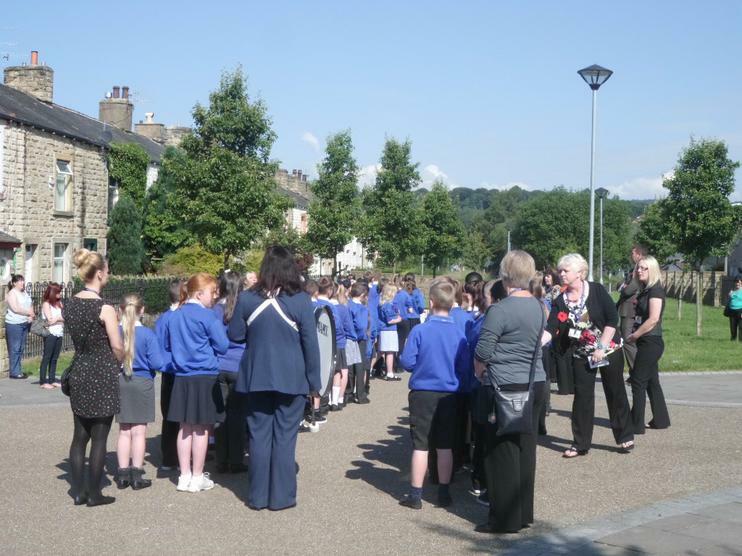 Happy 90th Birthday Mr Bernard Jordan, from all the children, staff, friends and families of St. John's School, Padiham. 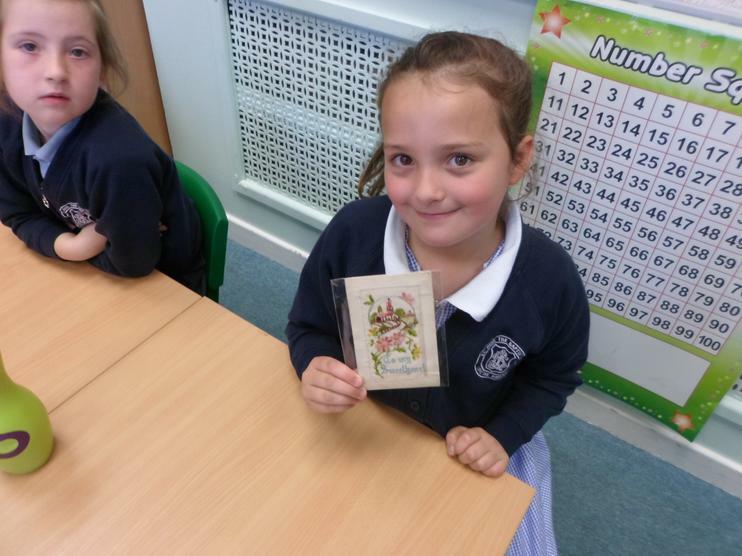 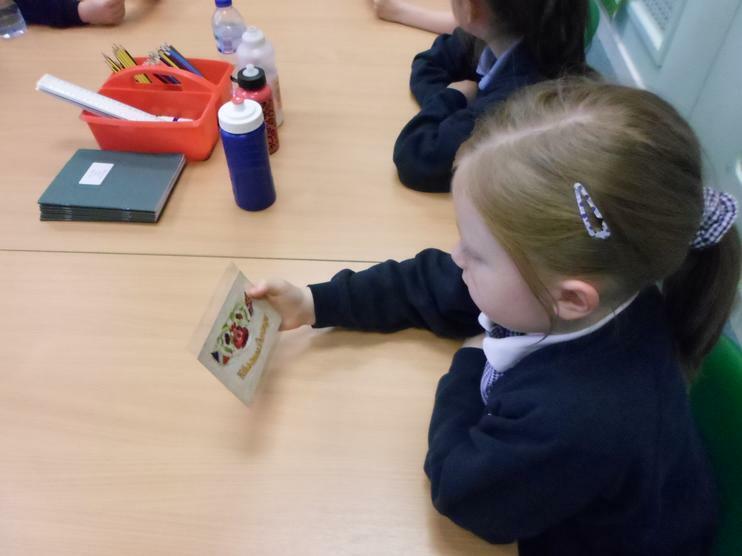 The children in Year 2 and Year 3 were delighted today to receive a reply from Mr Jordan, thanking them for their birthday card. 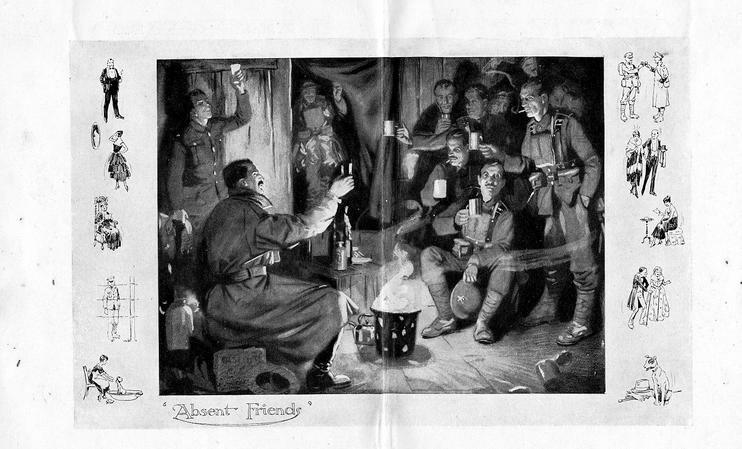 They couldn't believe he had taken the time to reply to all of the people he must have received cards from. 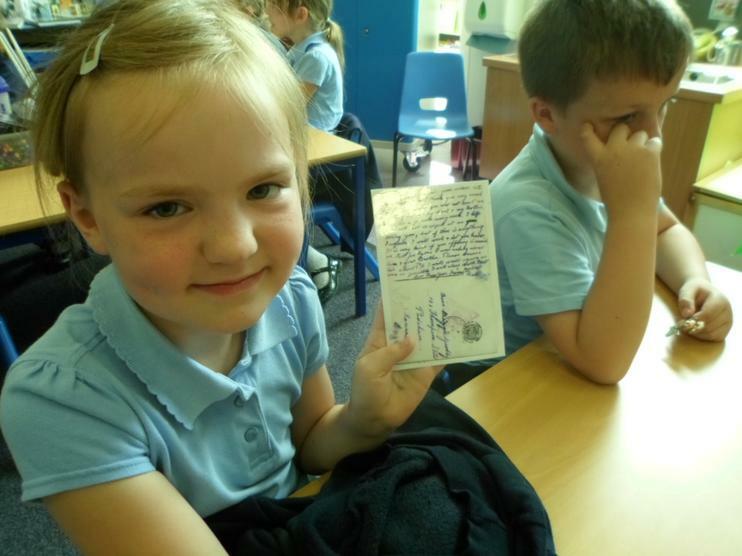 The children in Year 2 have written the most amazing letters. 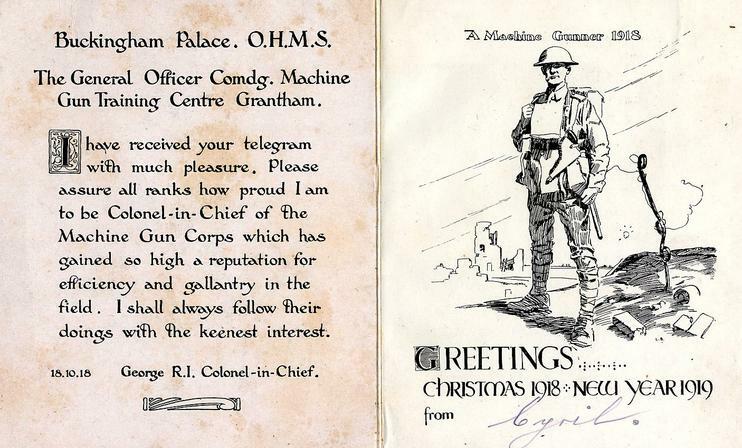 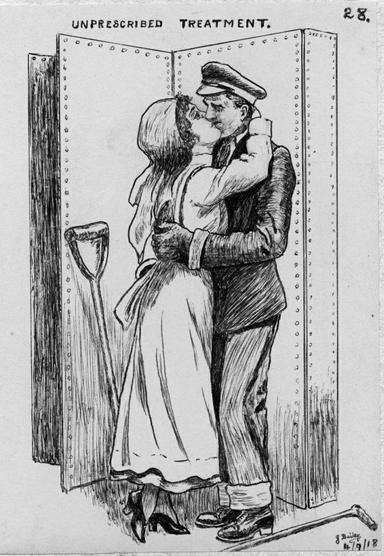 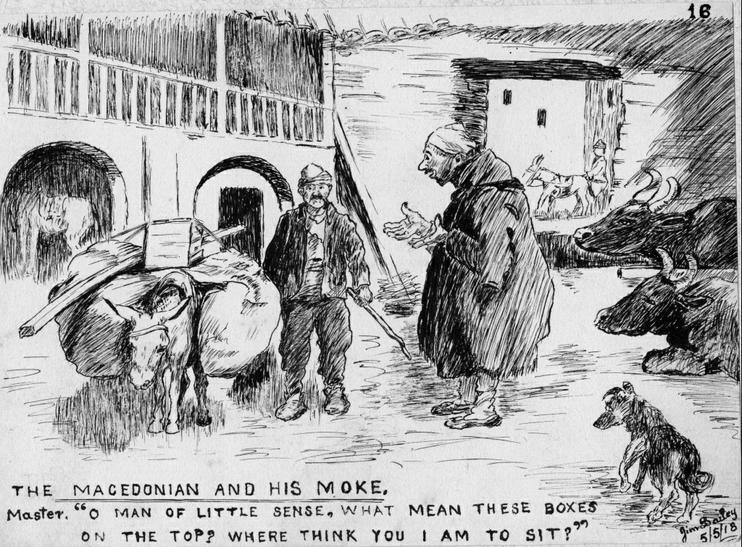 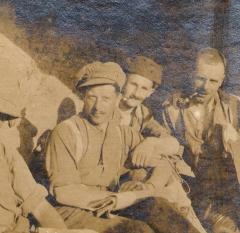 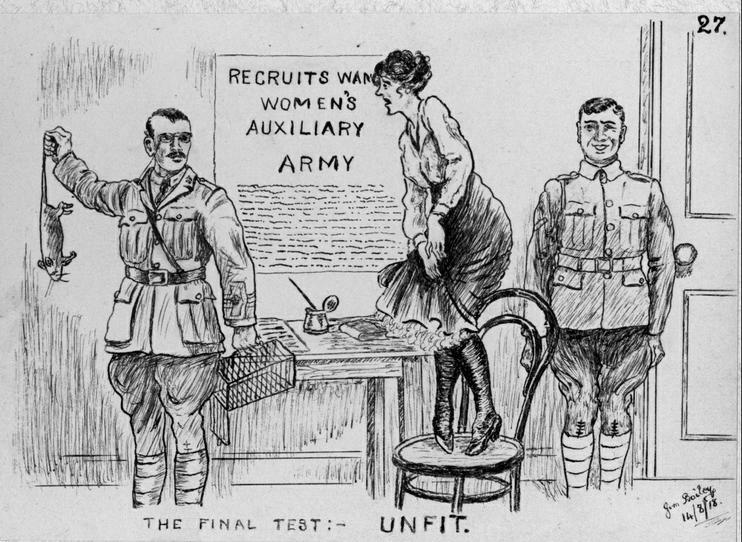 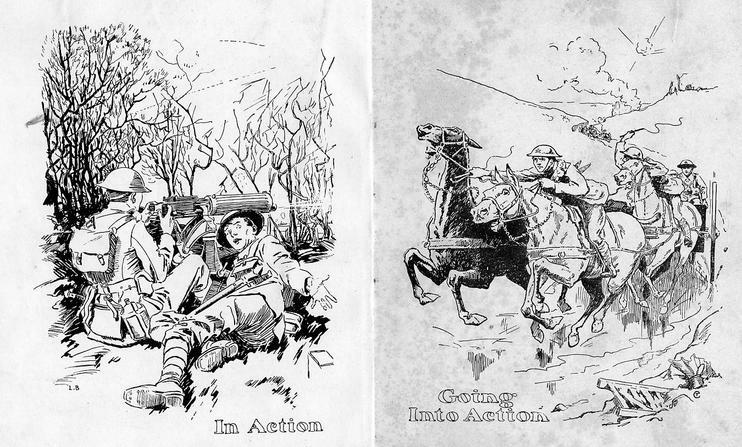 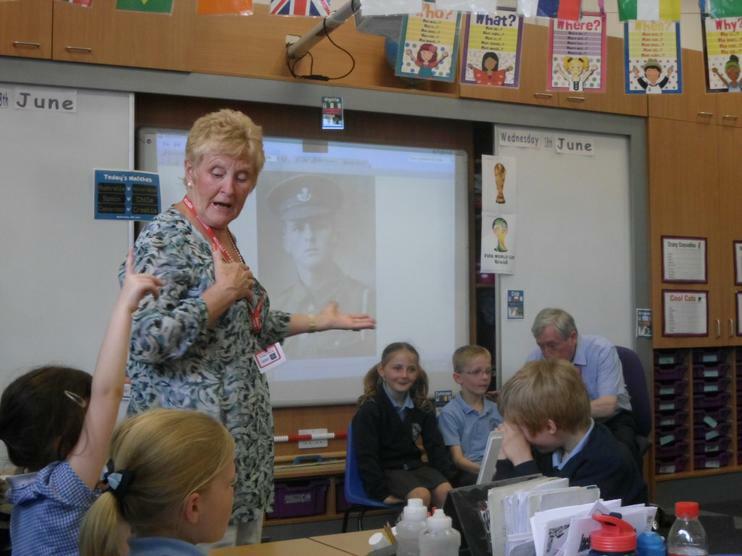 They imagined they were fighting in the trenches in World War I and were having to write home to their loved ones. 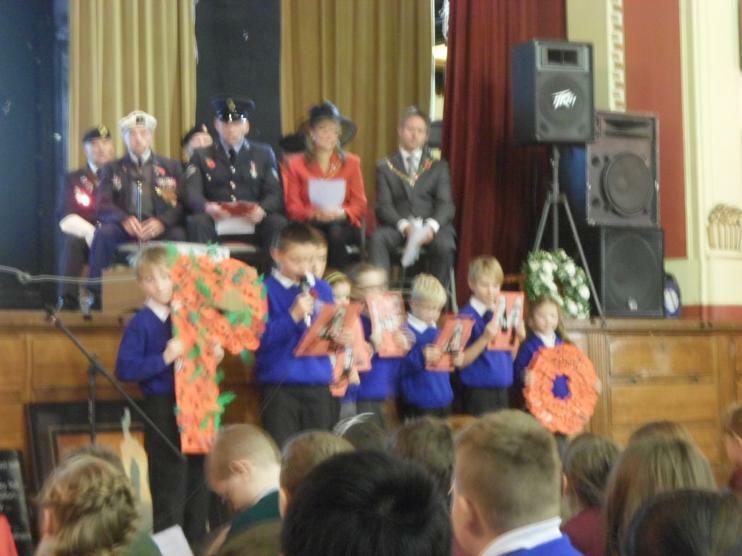 All the staff at school are immensely proud of these 6 and 7 year old children. 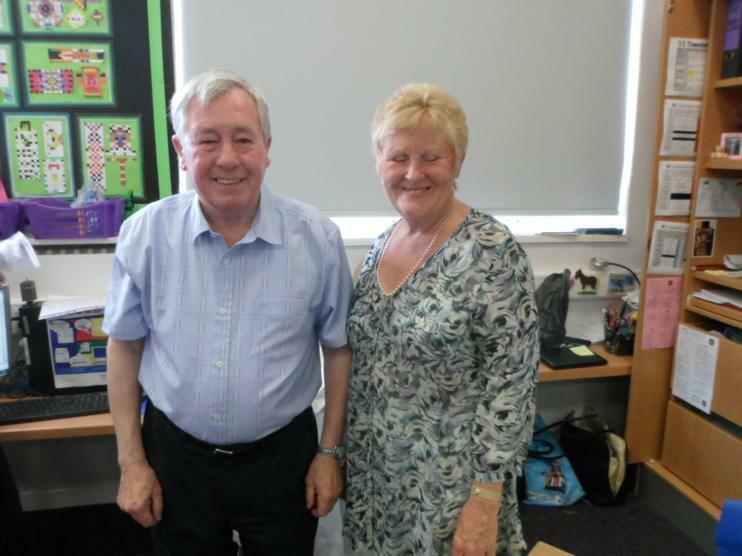 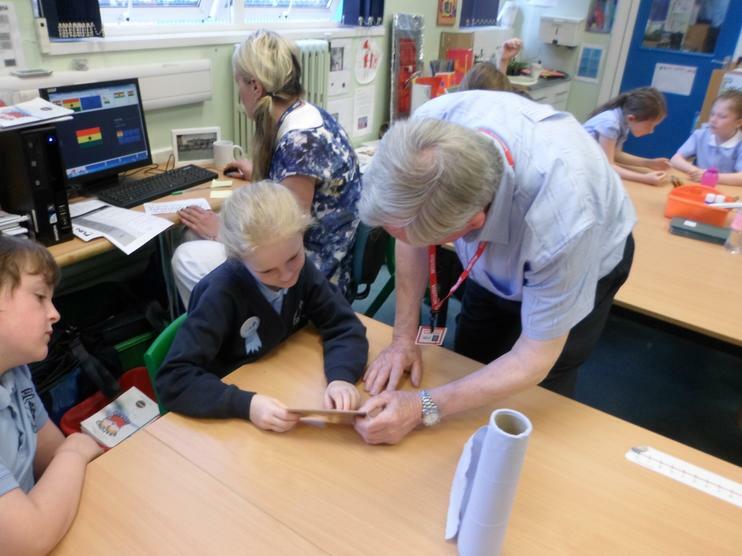 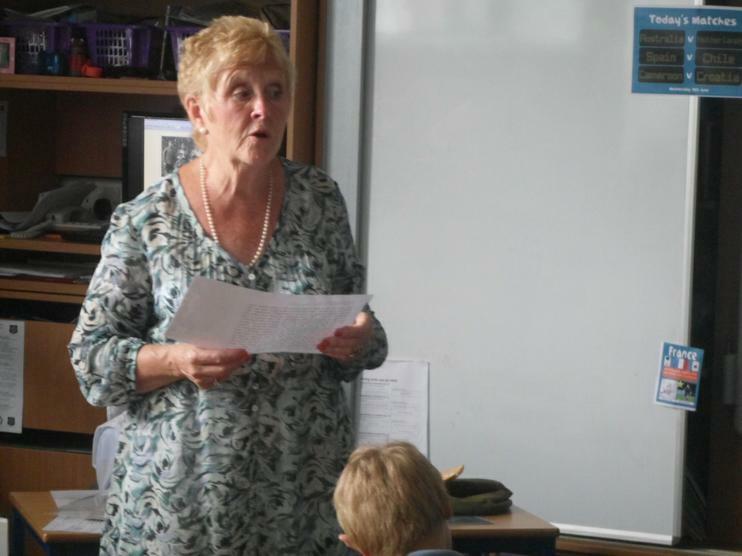 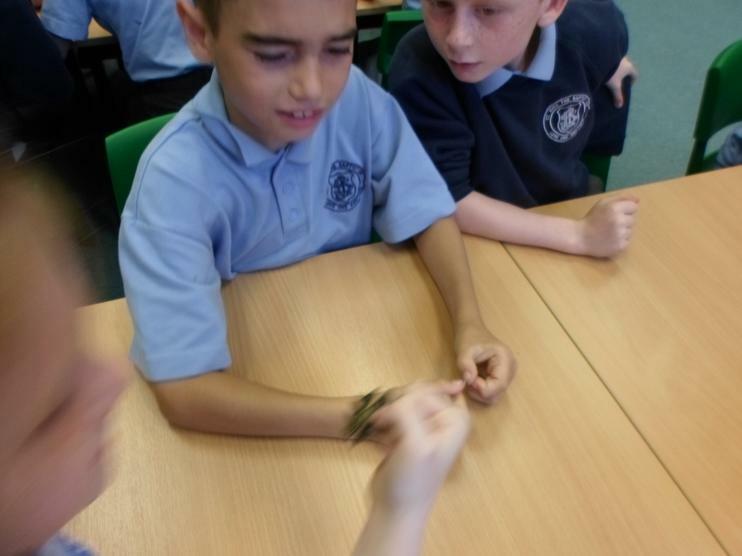 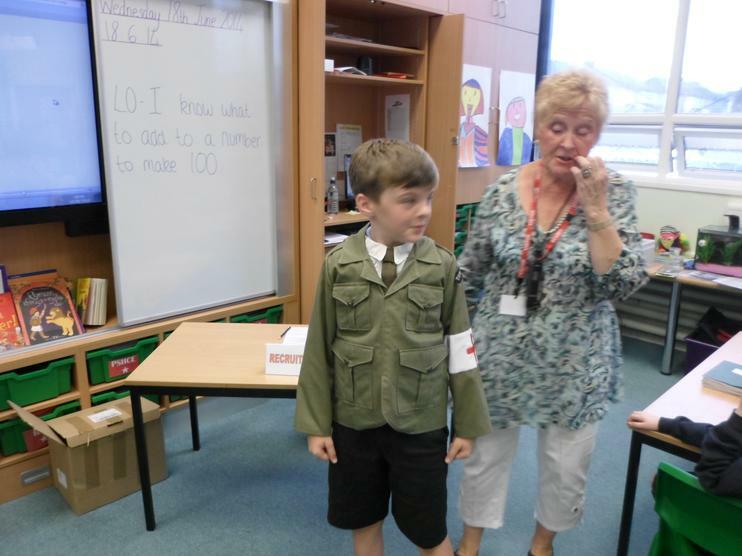 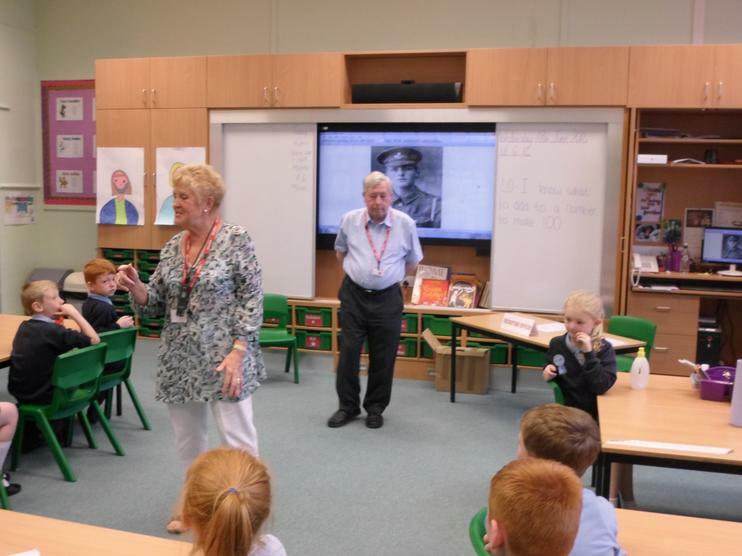 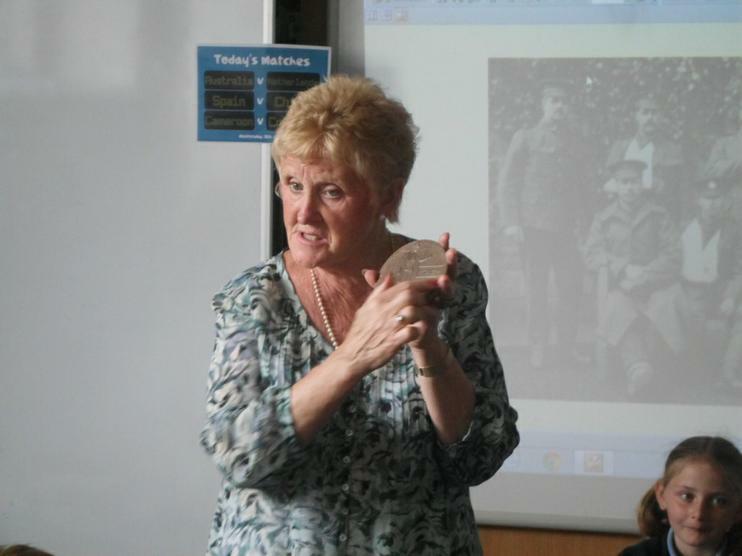 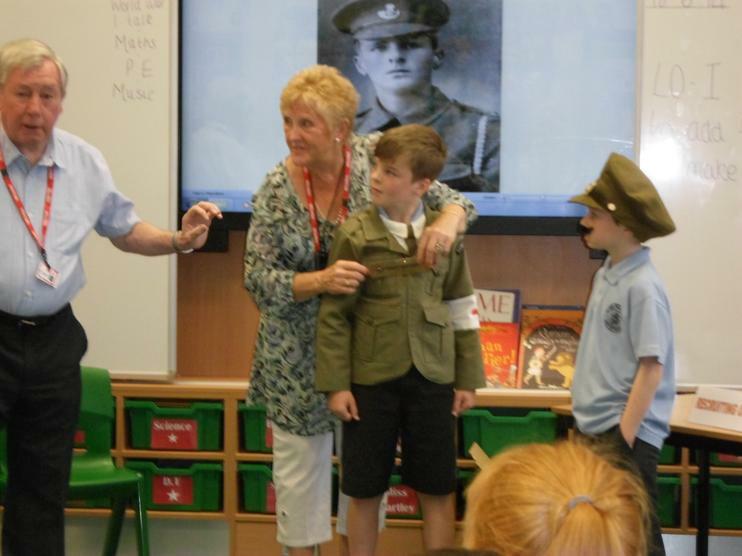 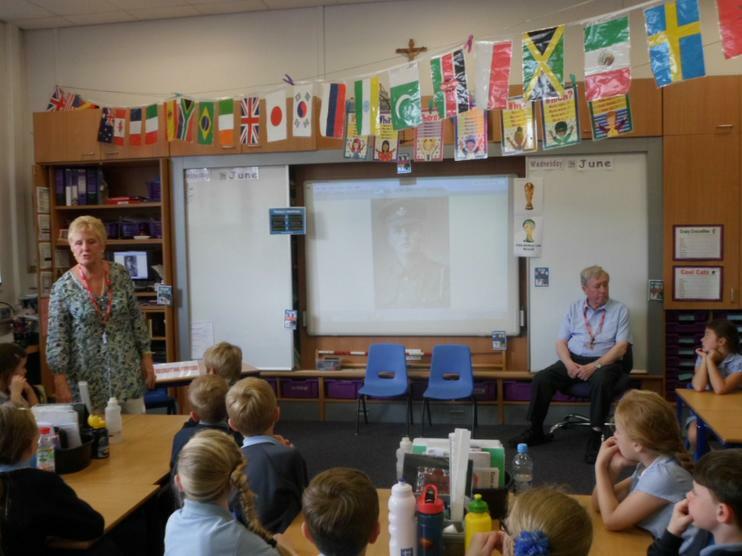 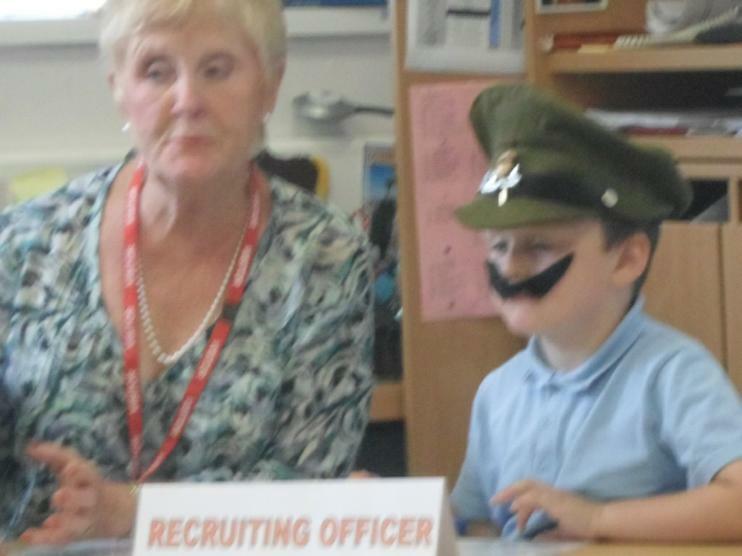 Bob and Anne have been in to visit the children in lots of classes over the last week. 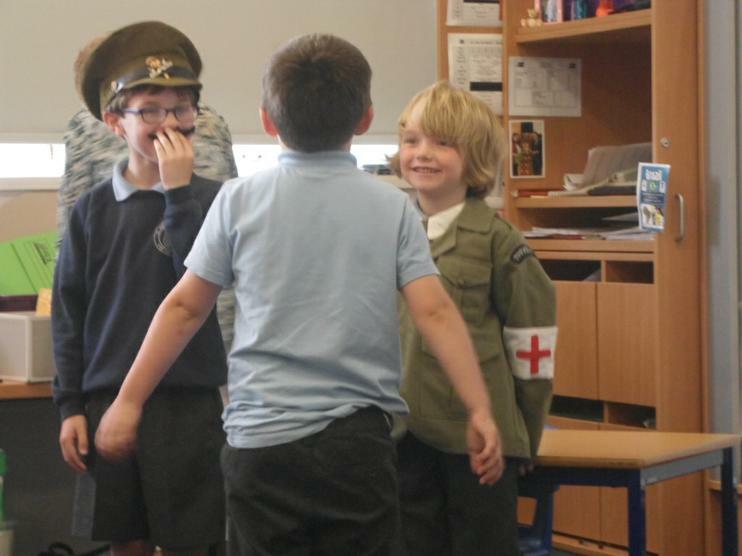 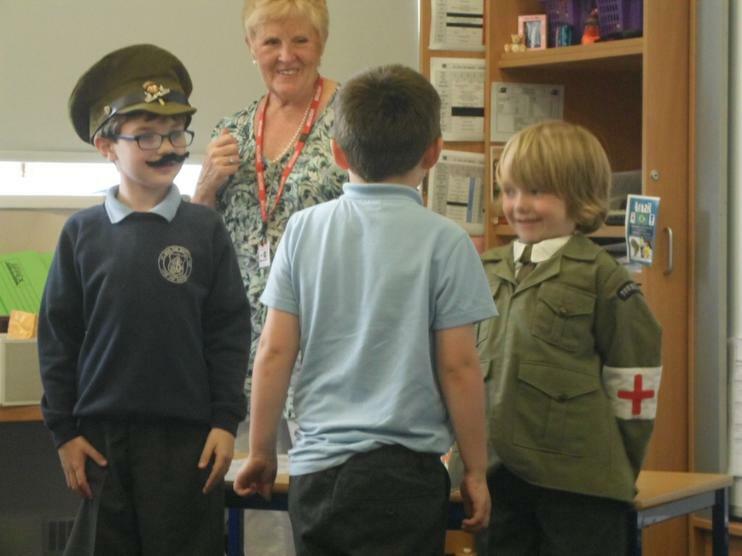 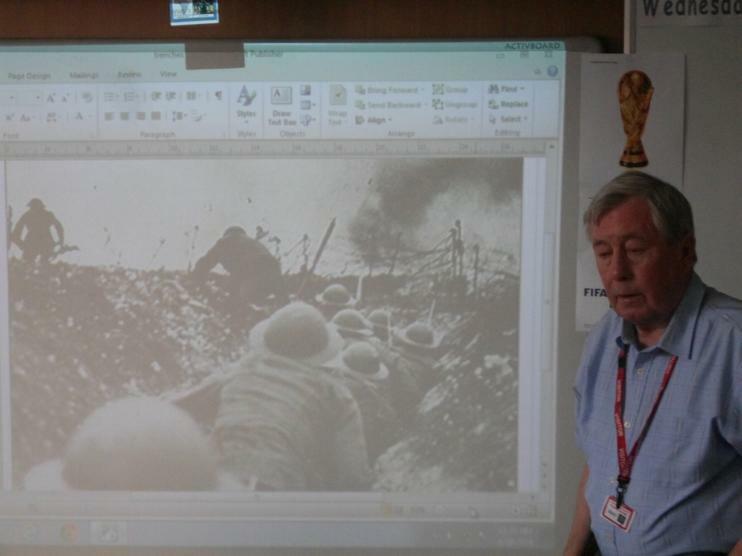 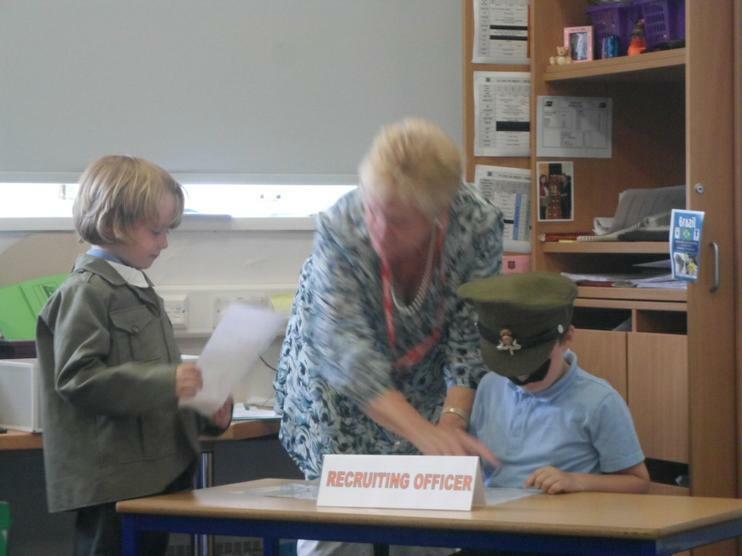 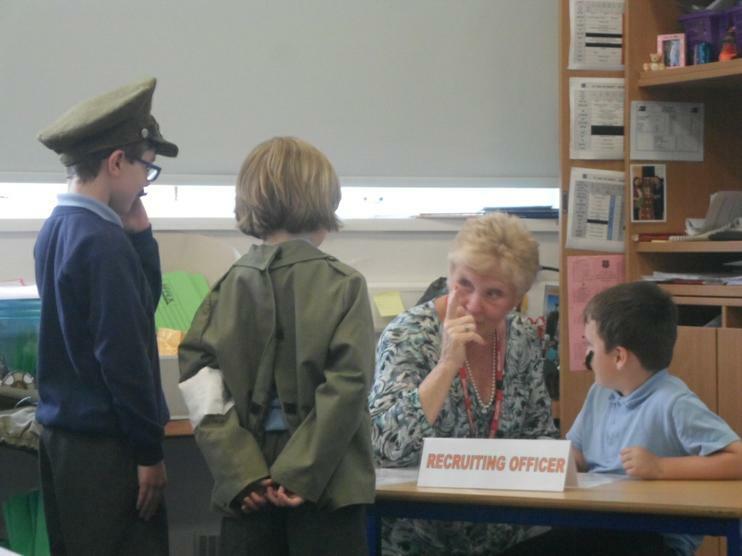 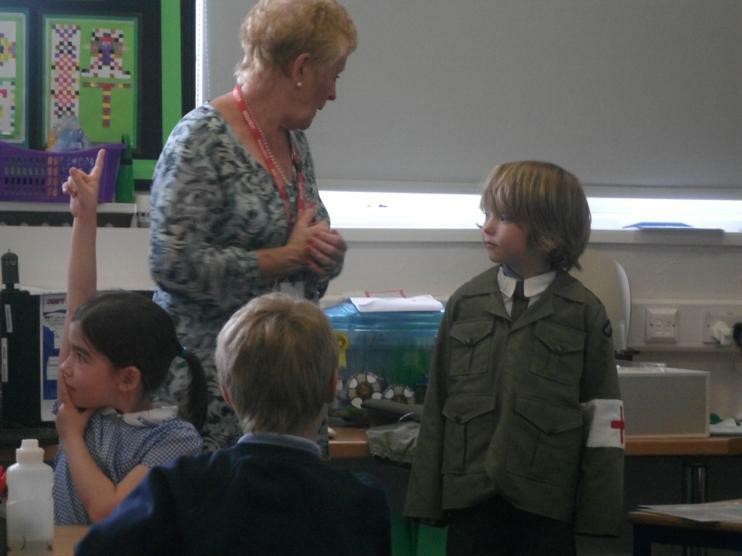 They have been talking about World War I and about how life was in the war for the soldiers and their families. 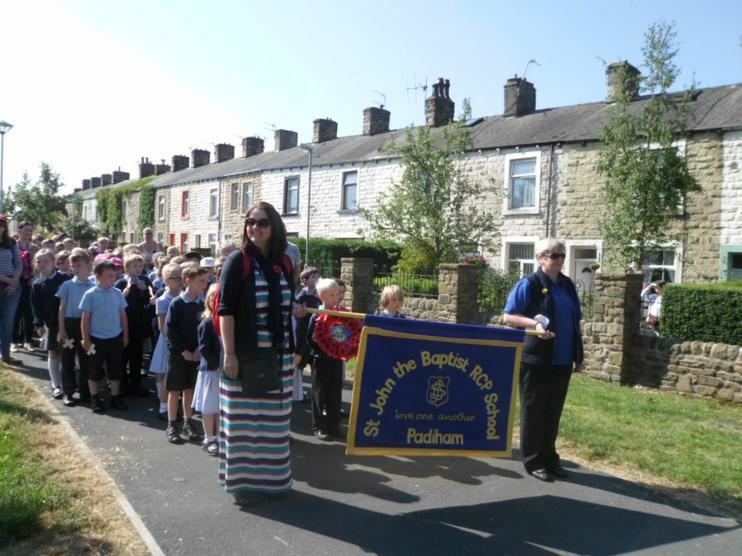 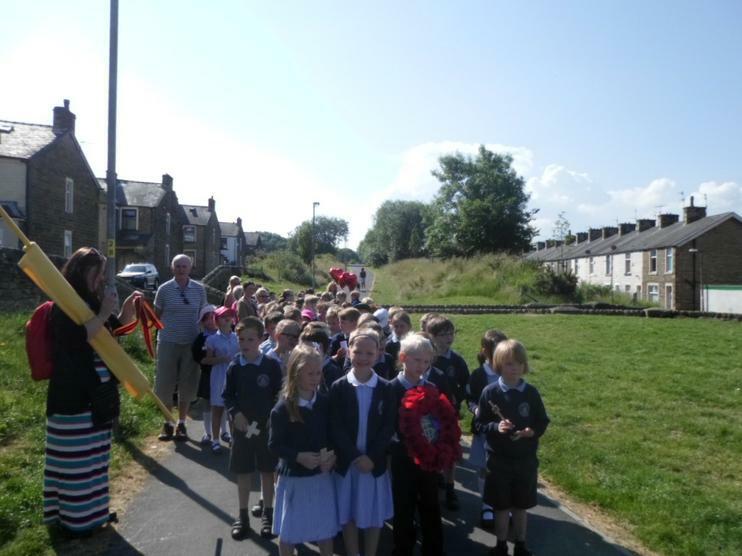 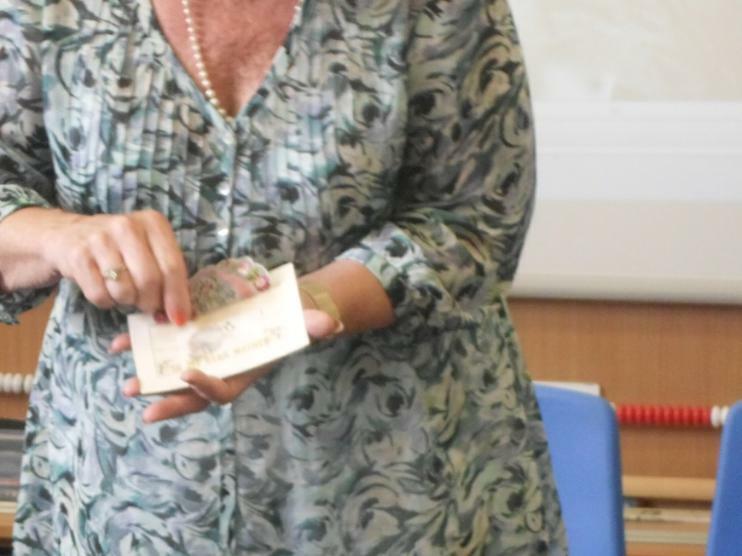 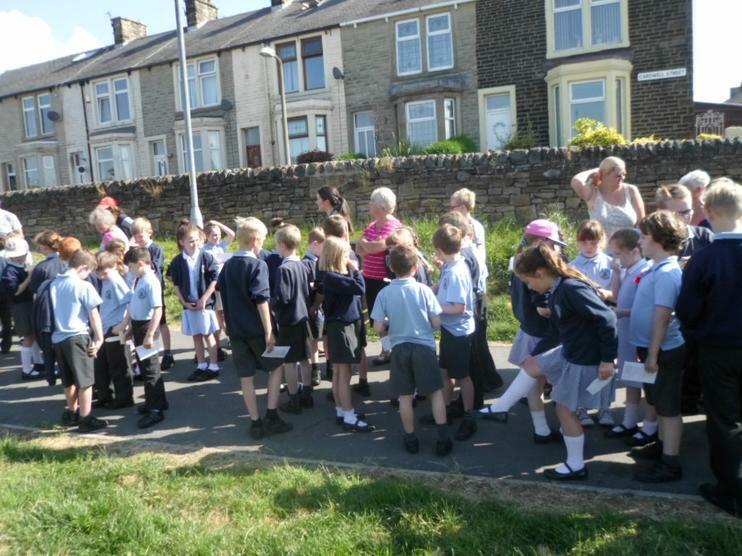 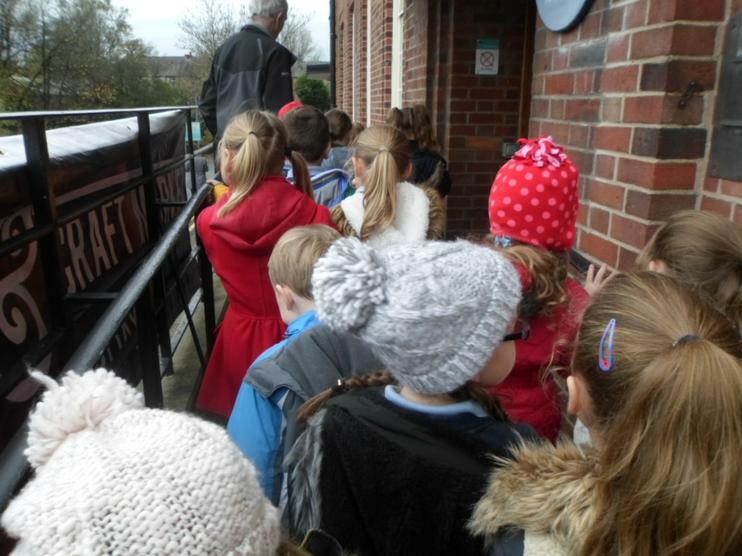 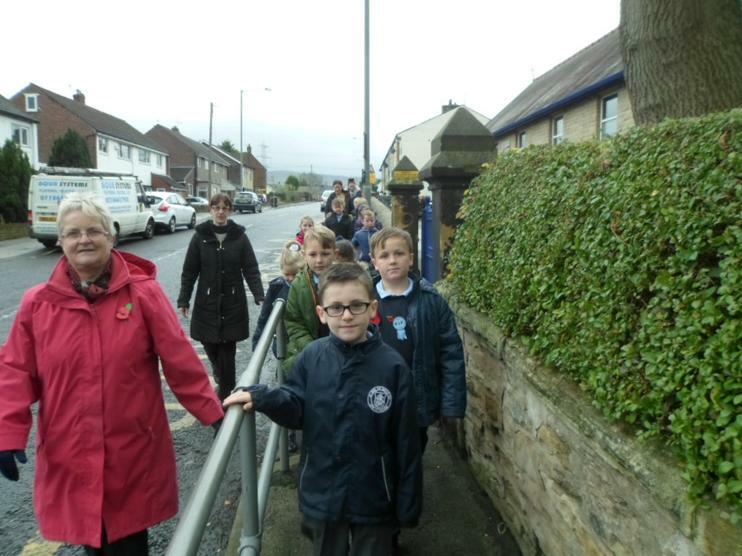 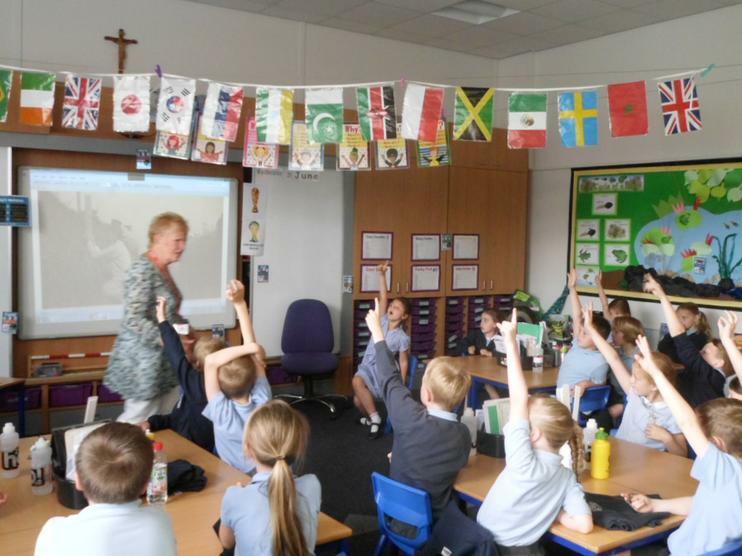 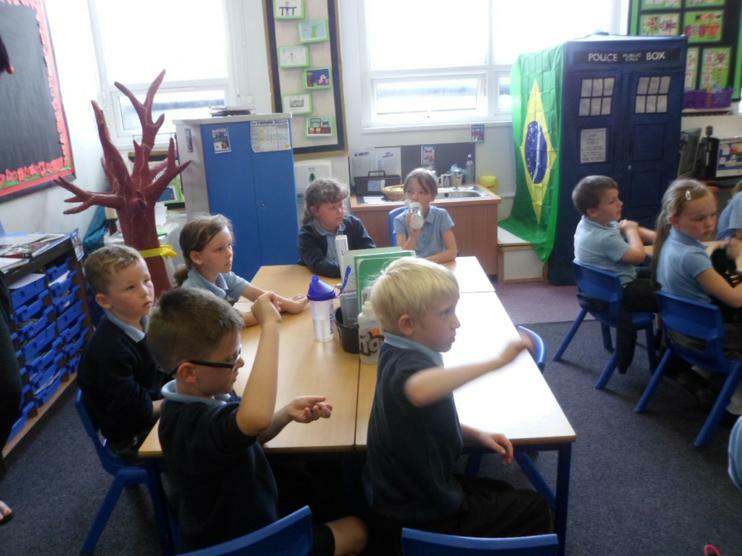 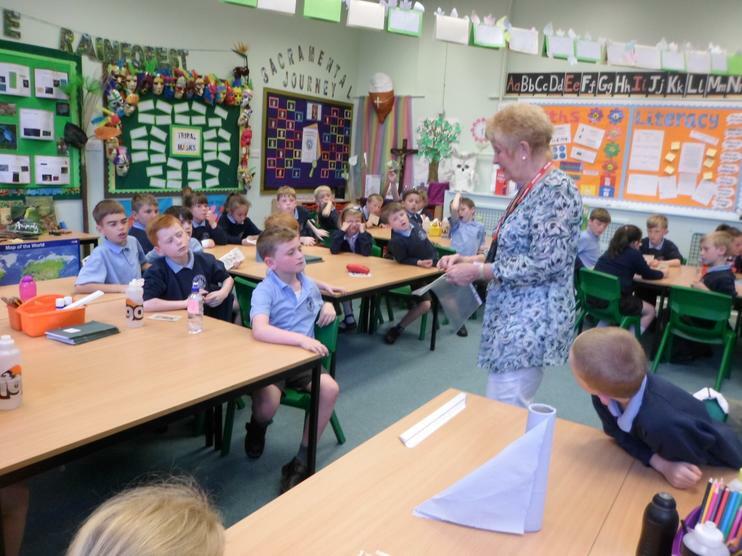 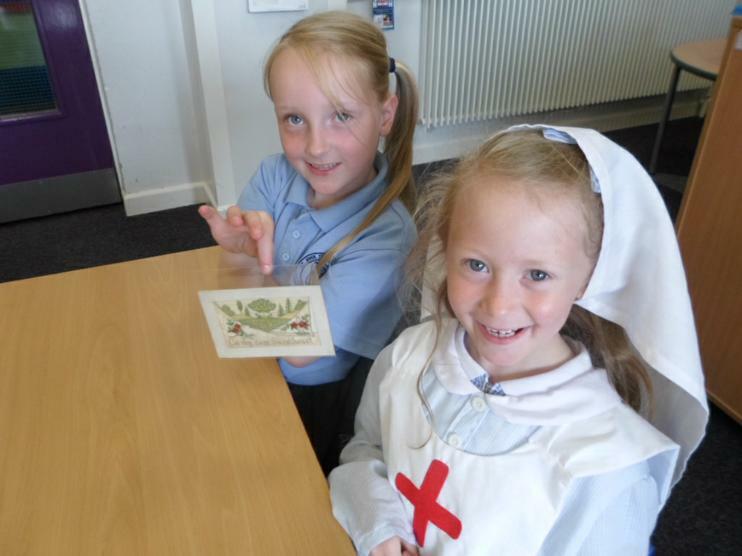 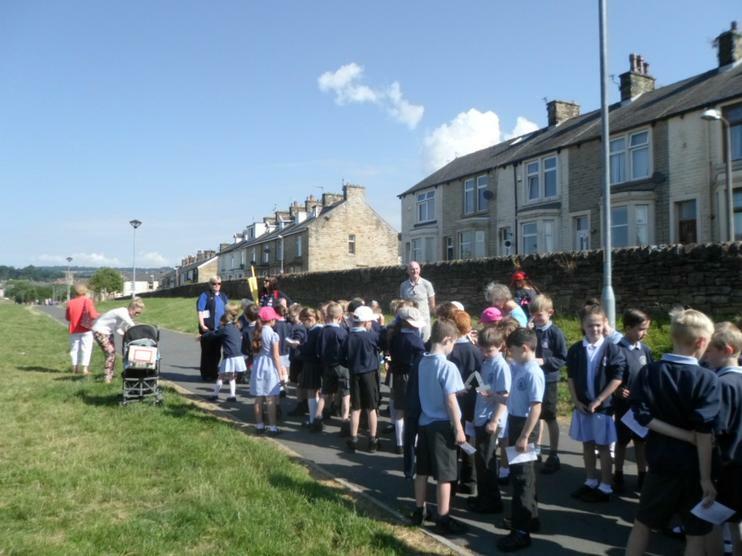 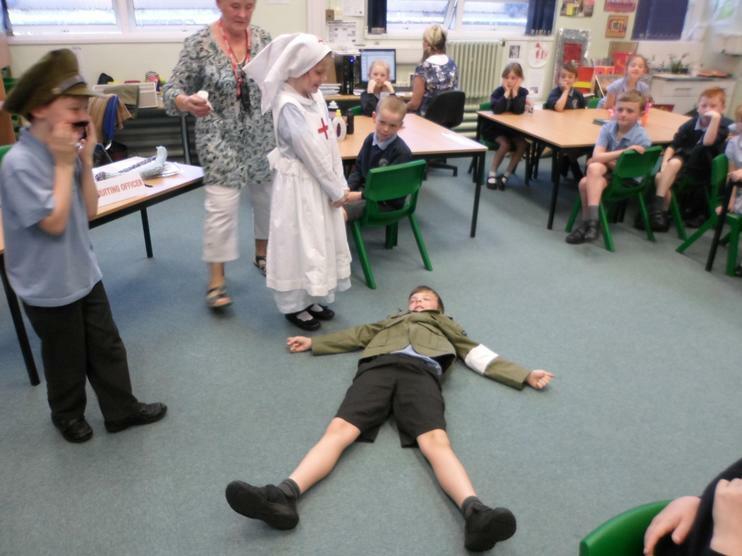 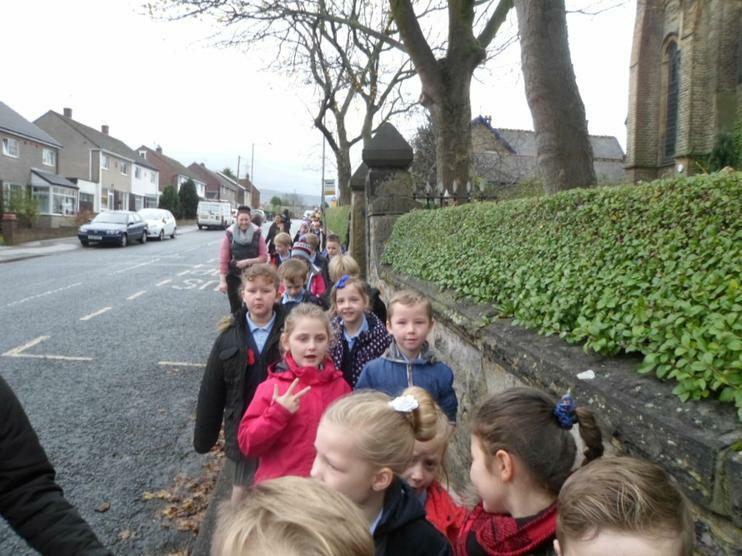 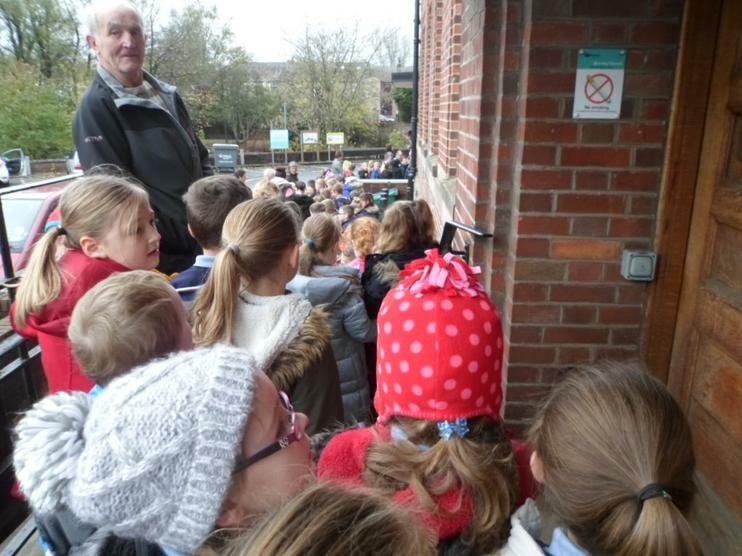 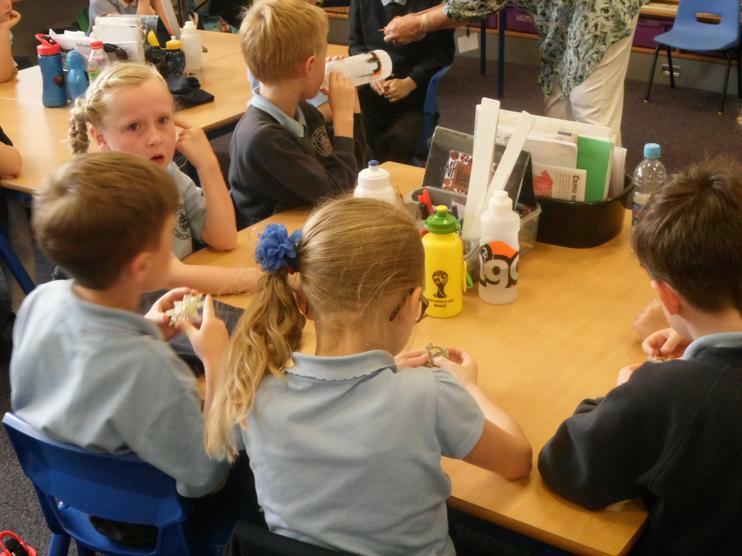 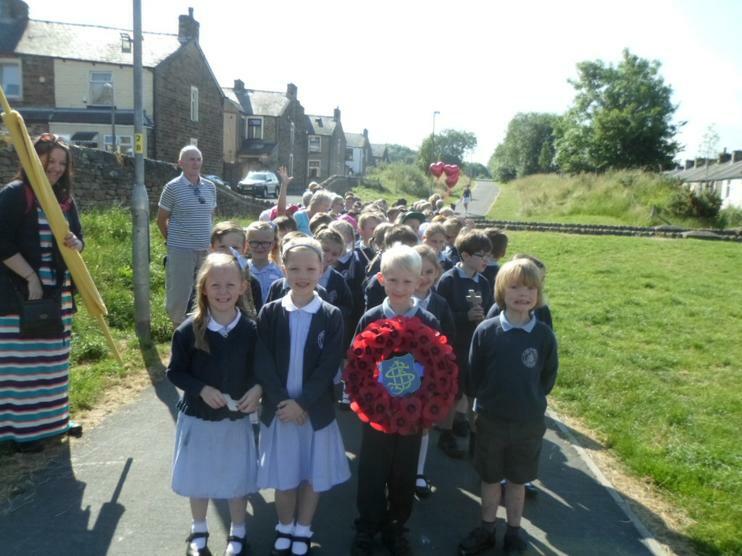 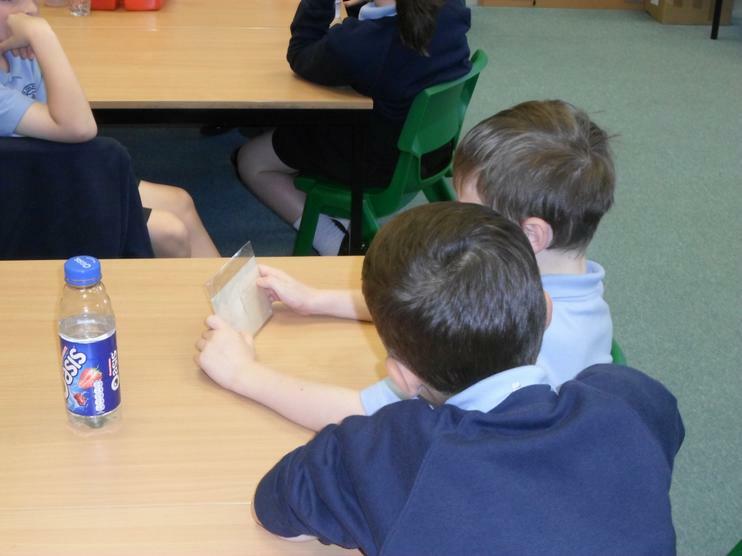 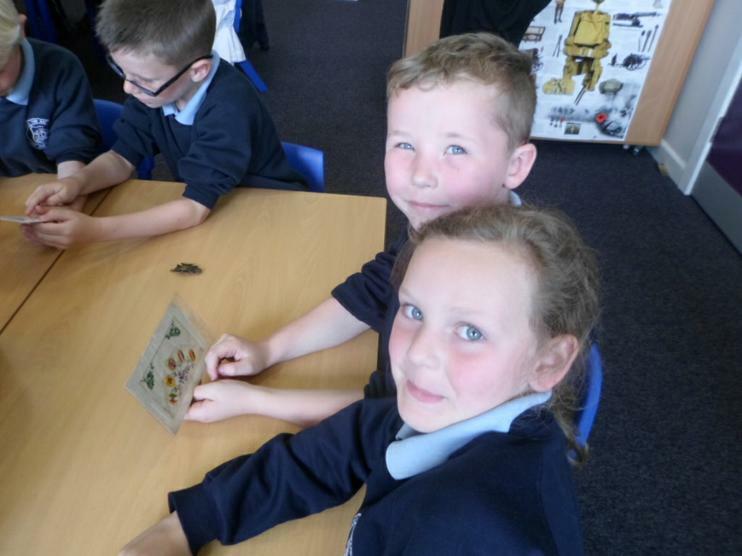 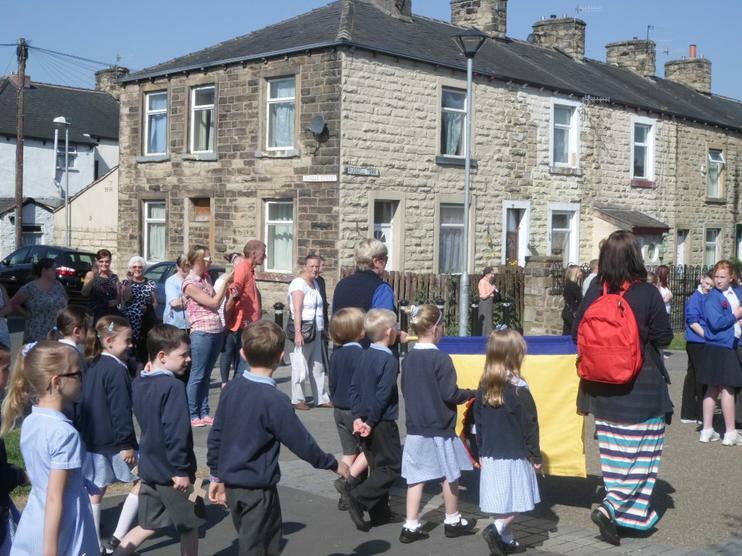 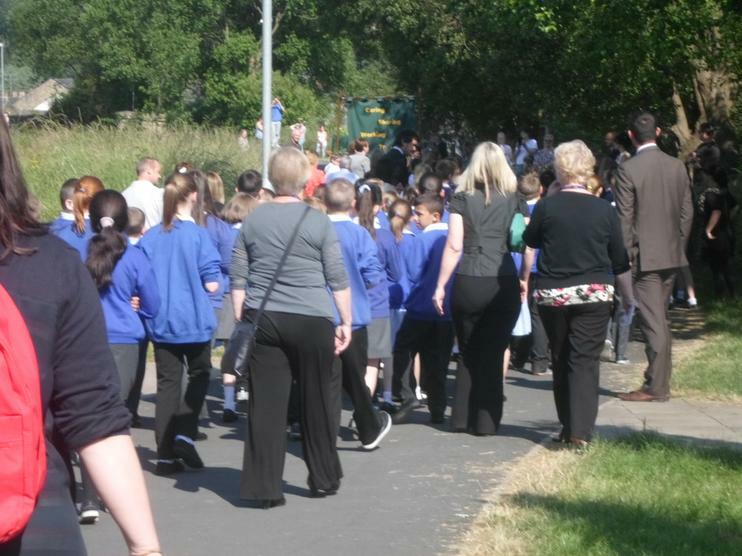 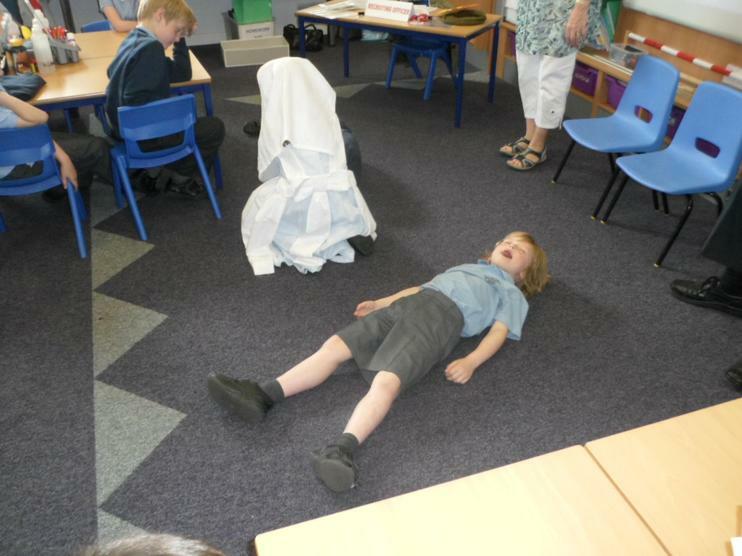 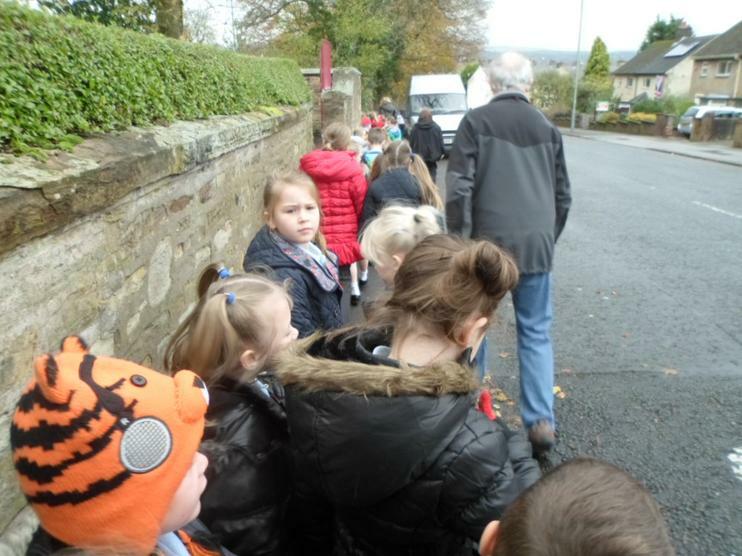 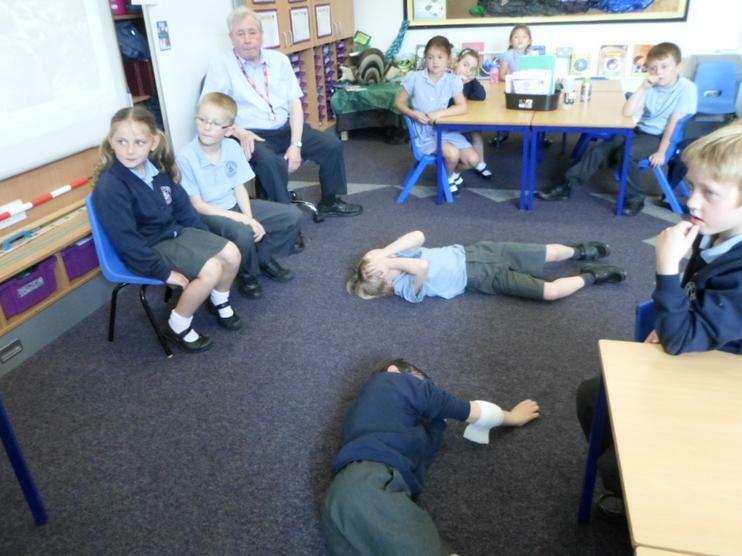 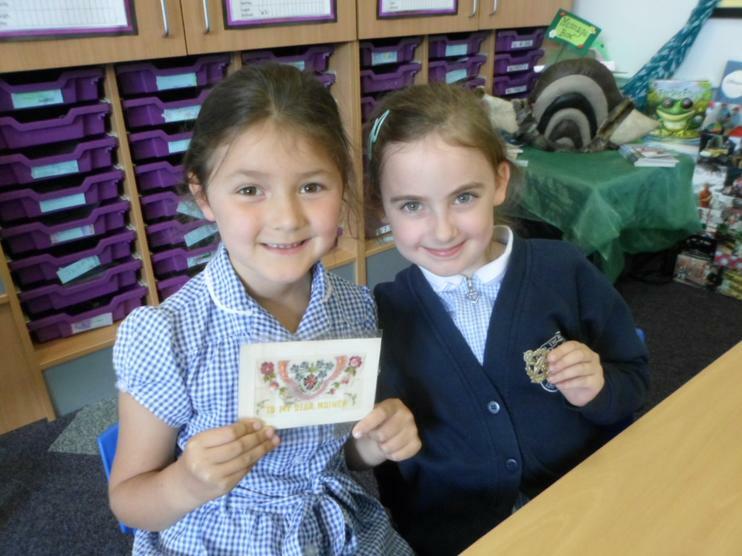 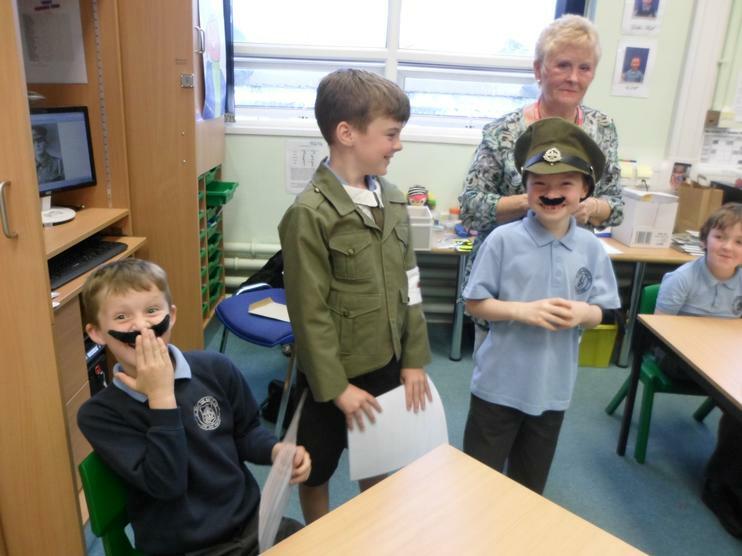 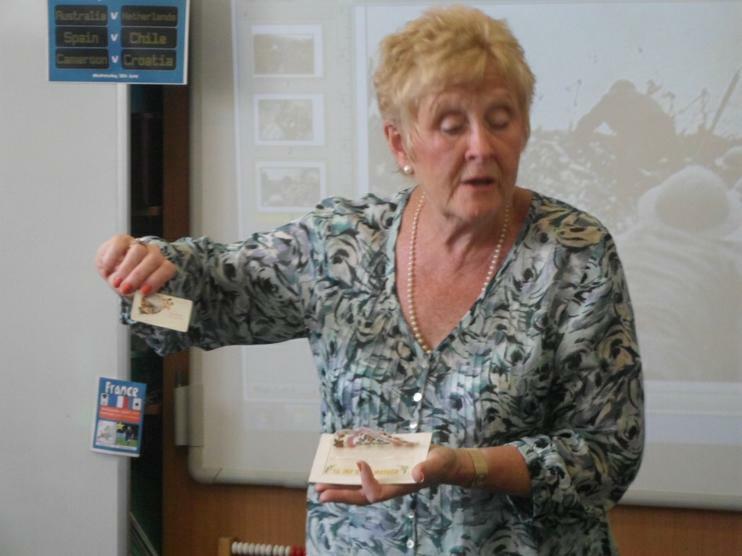 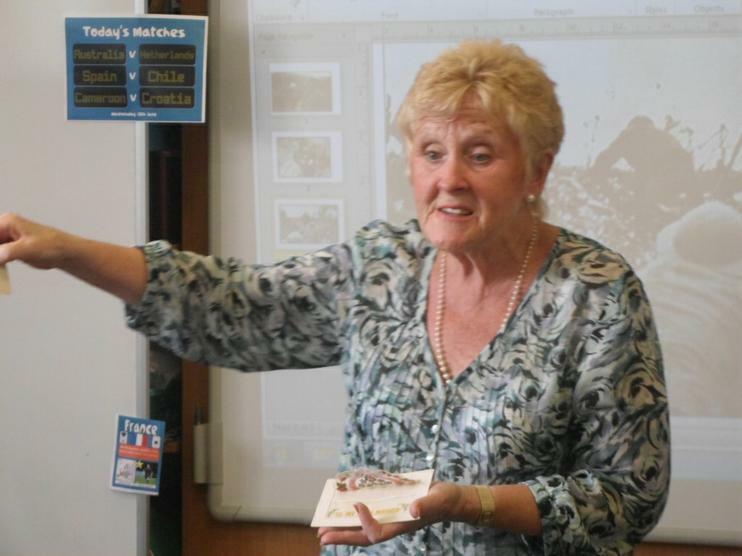 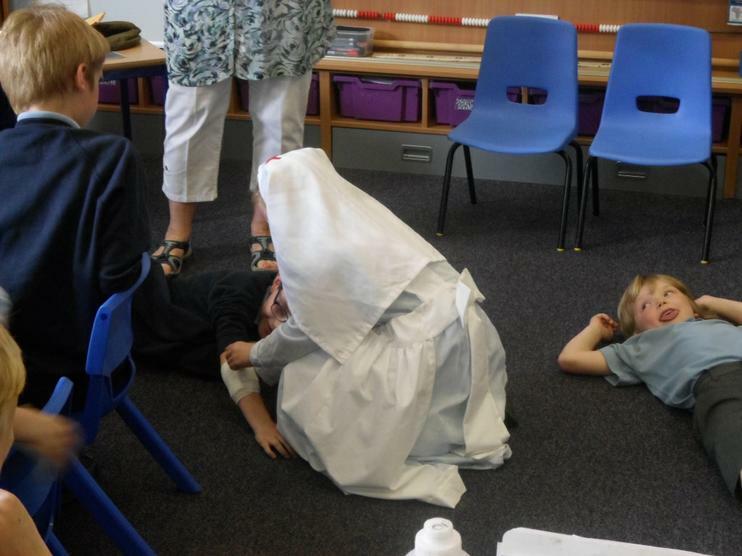 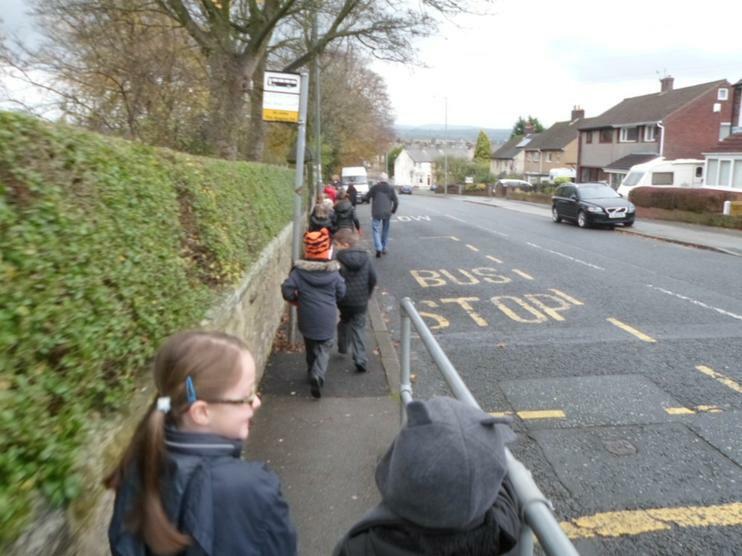 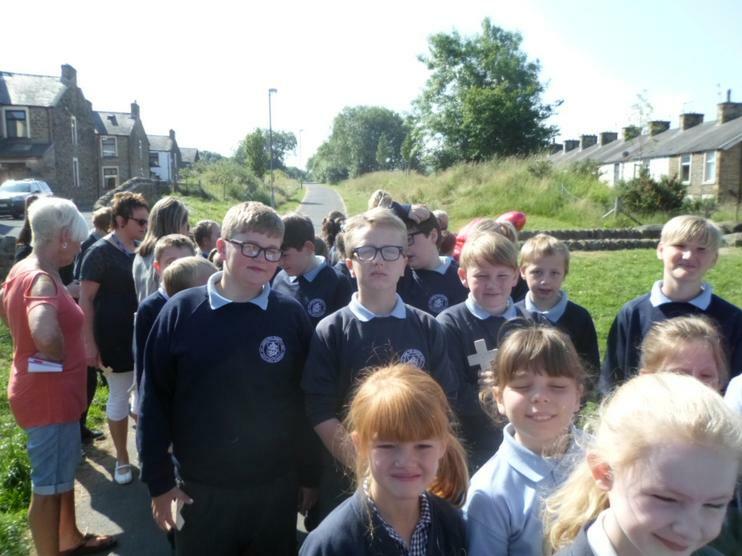 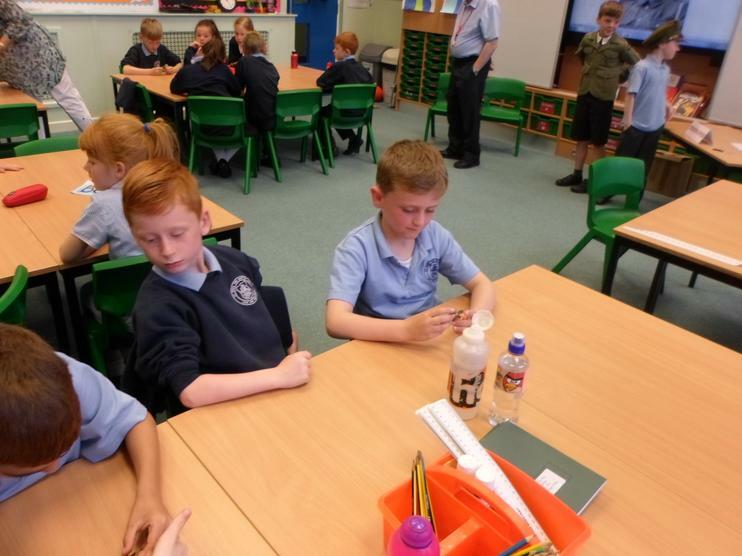 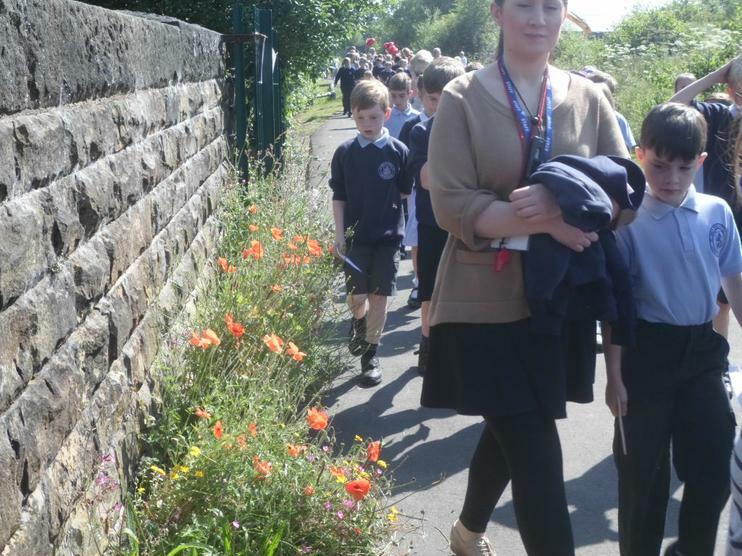 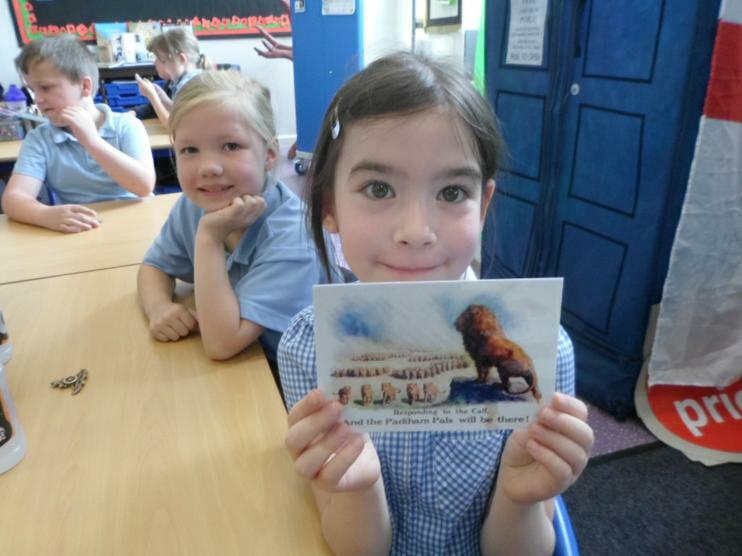 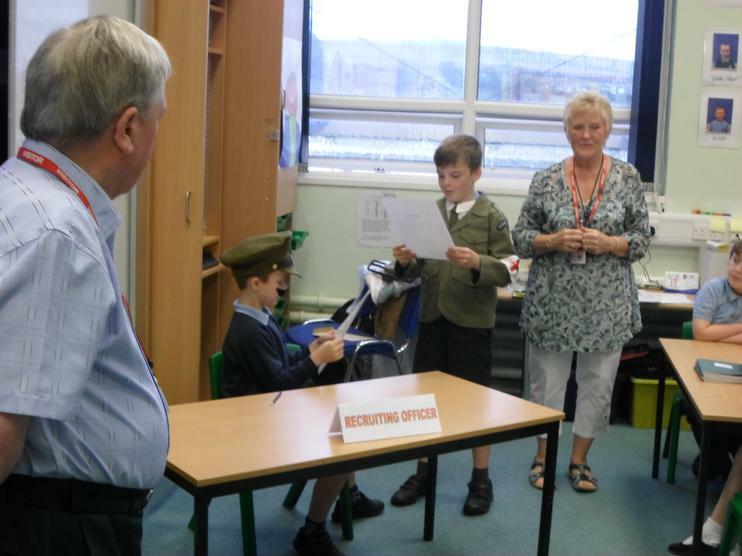 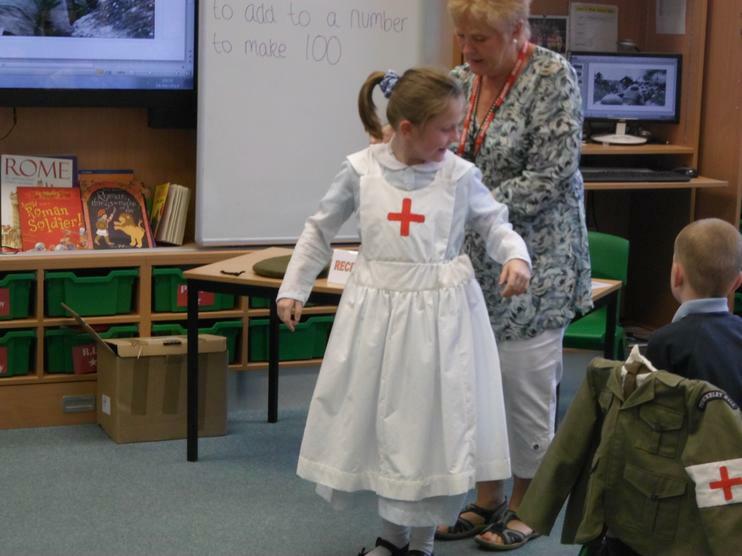 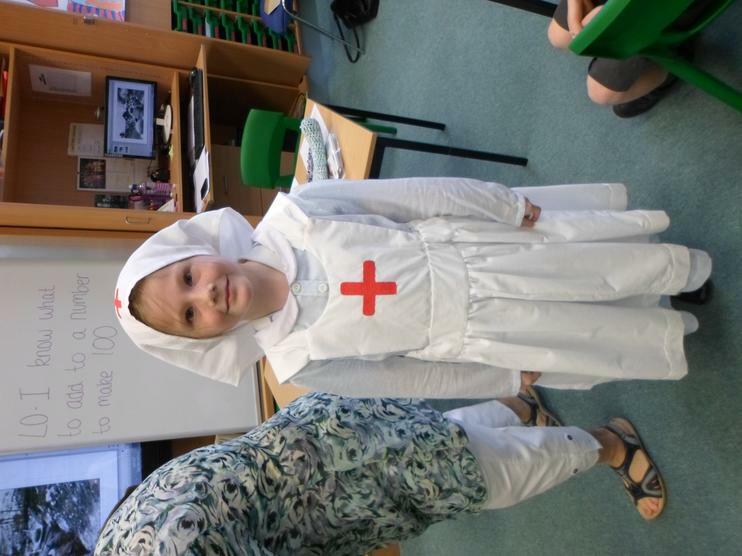 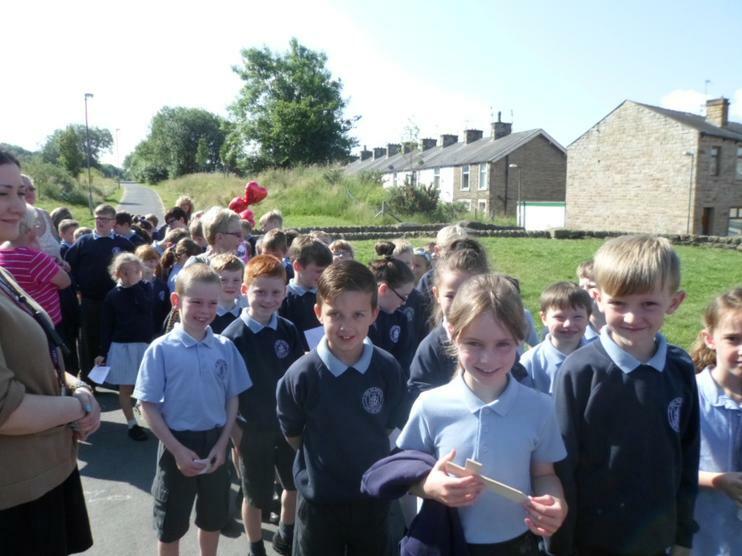 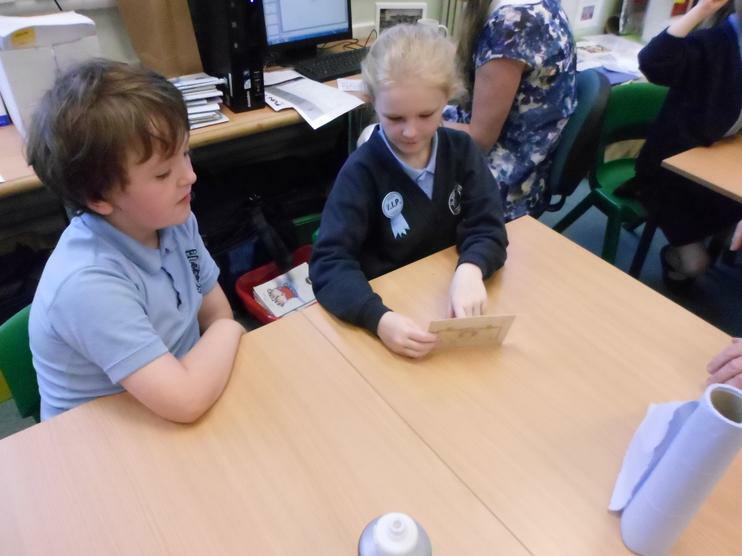 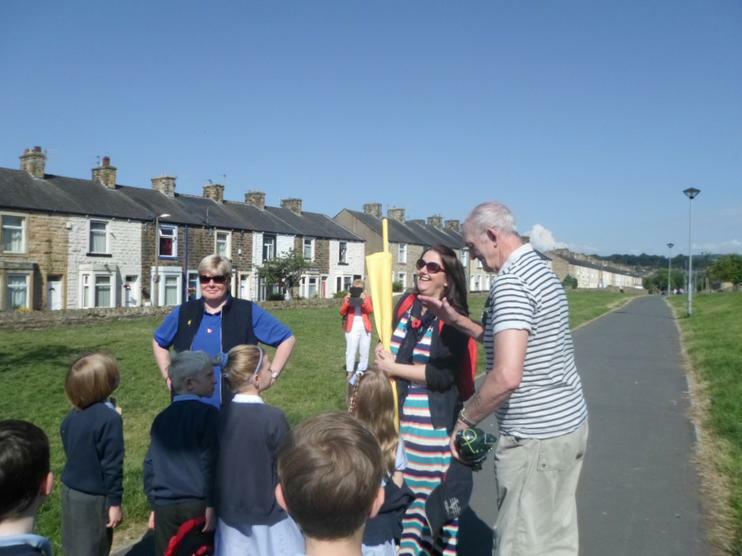 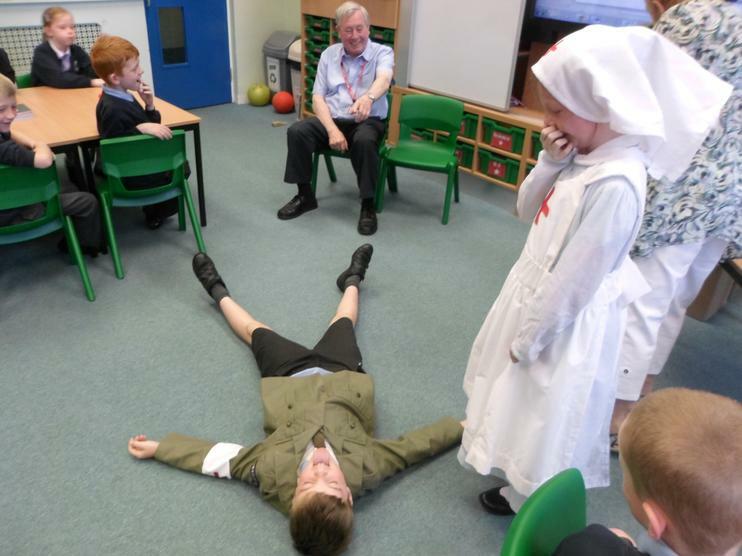 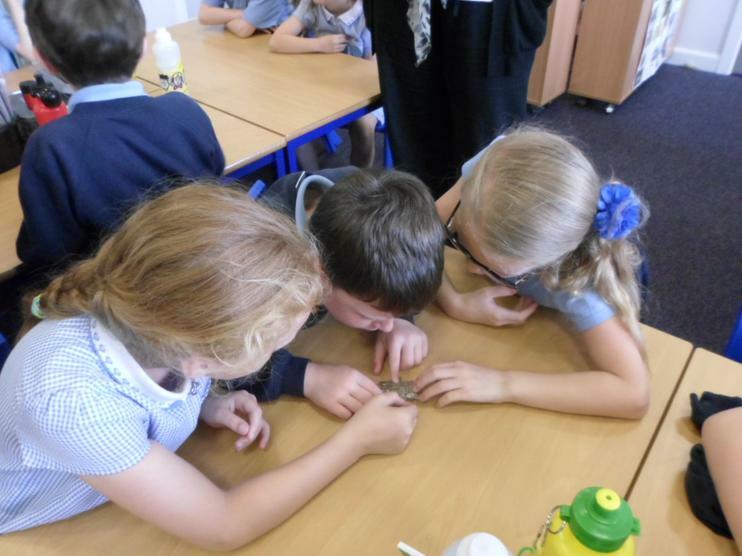 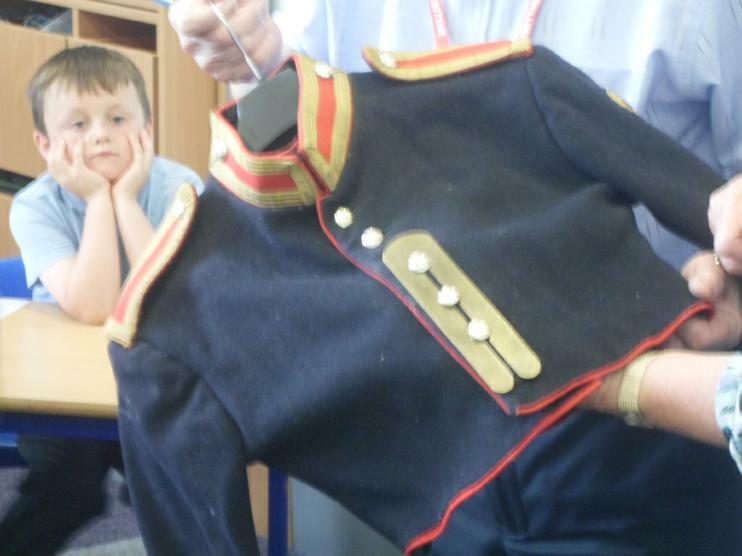 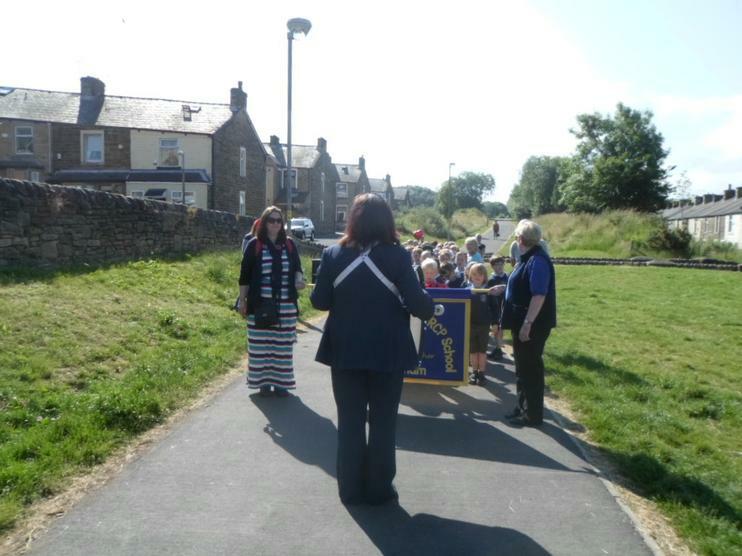 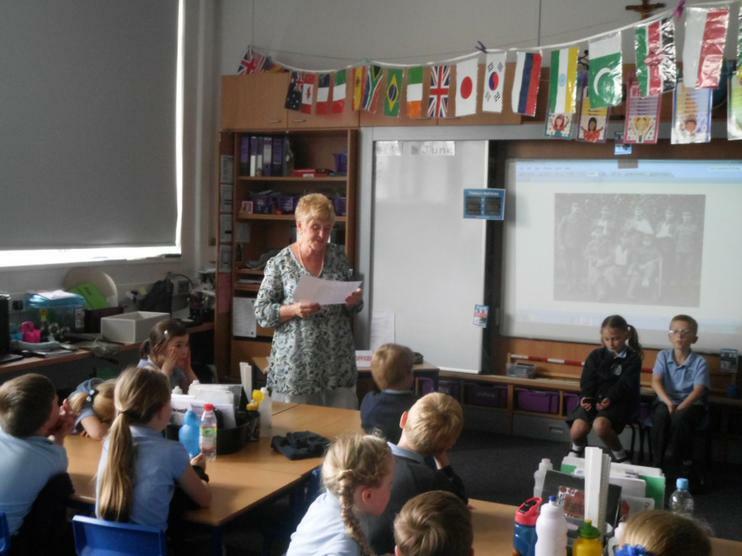 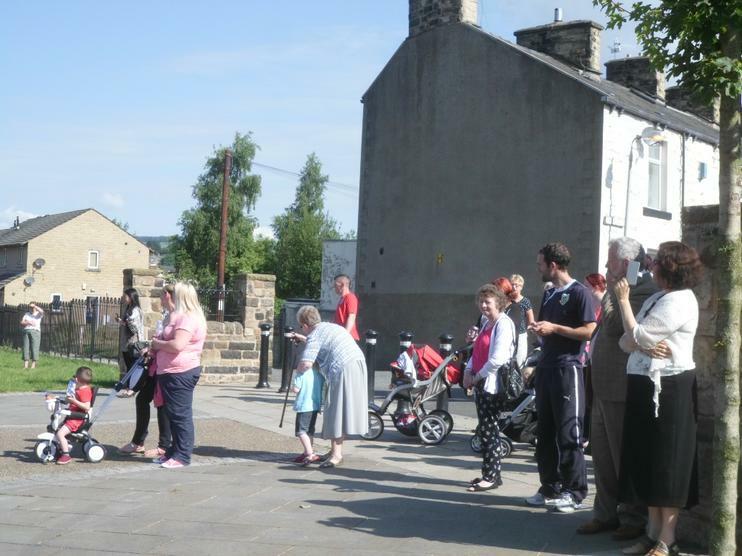 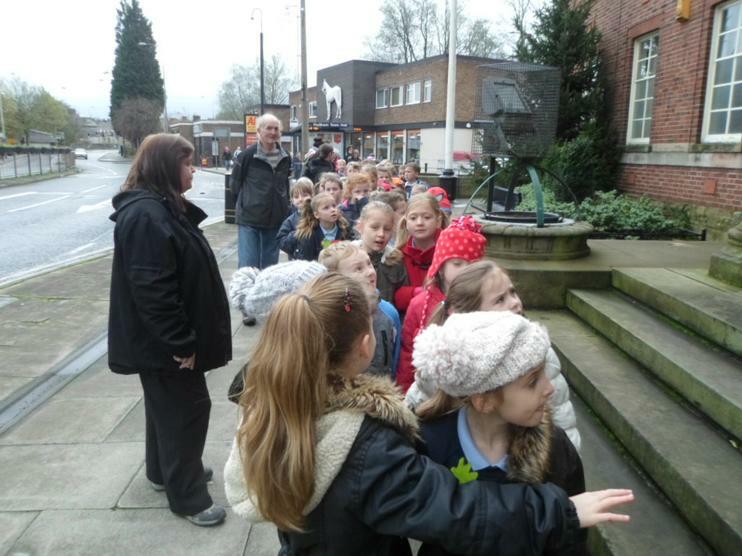 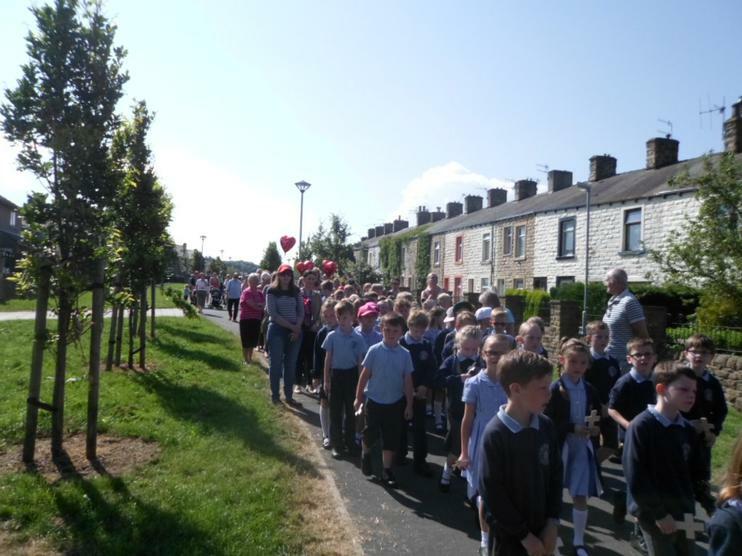 Whilst Bob and Anne were visiting Year 2, the Burnley Express came and took some photos. 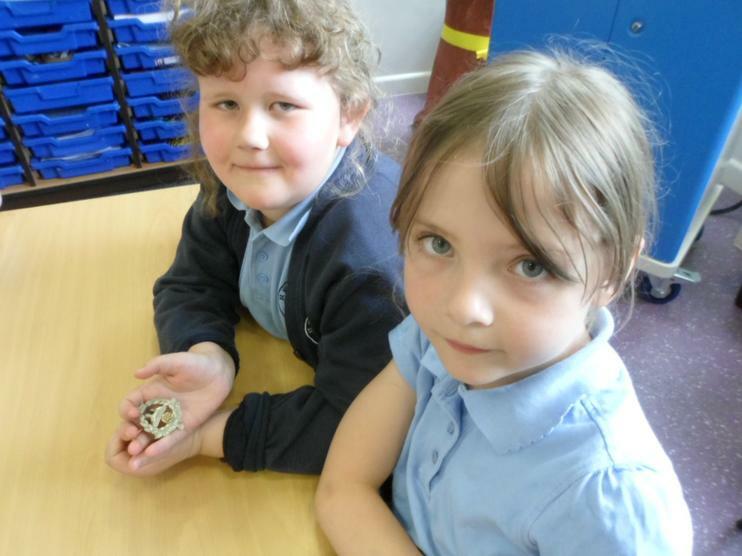 The article can be seen in this Friday's newspaper and also on-line. 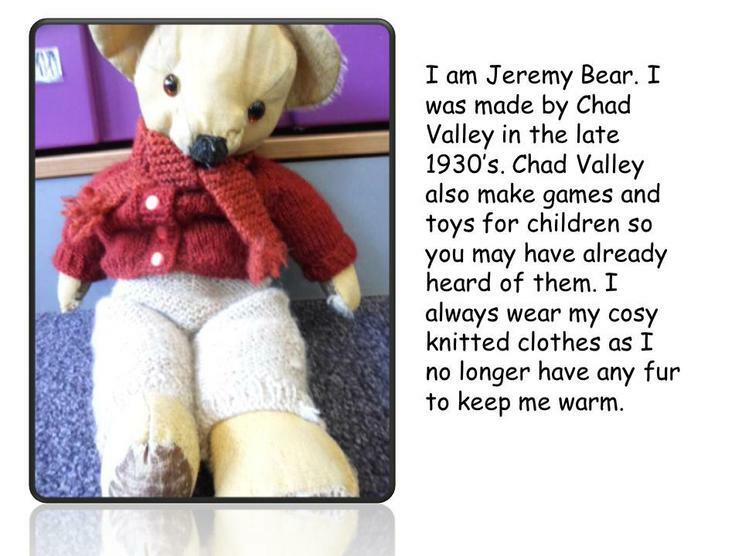 Click on the link below. 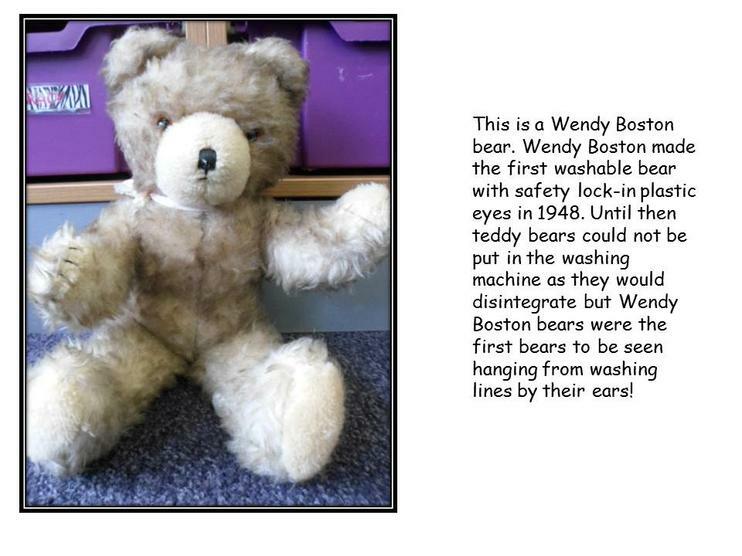 Mrs Howley gave a talk to the children in Year 2 about Teddy Bears. 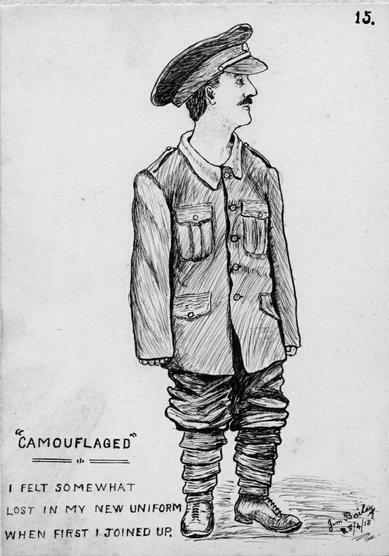 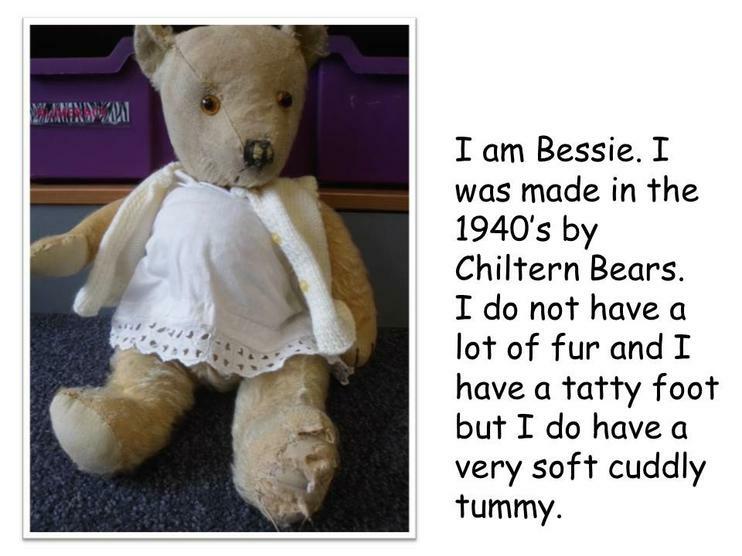 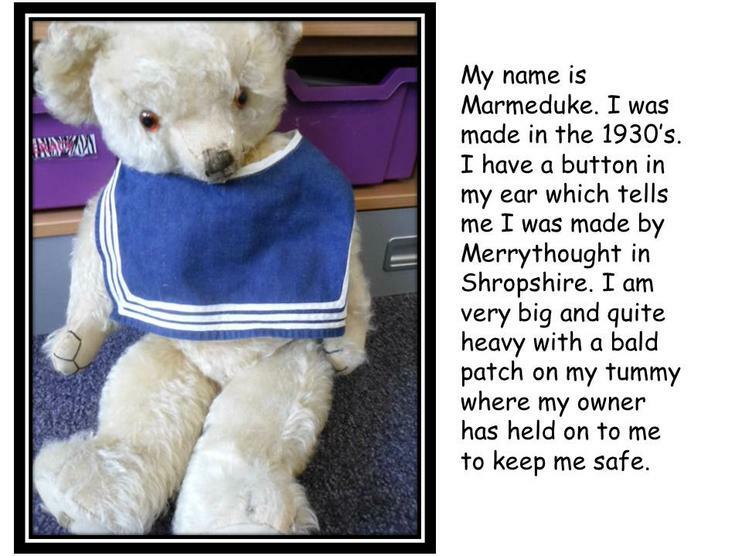 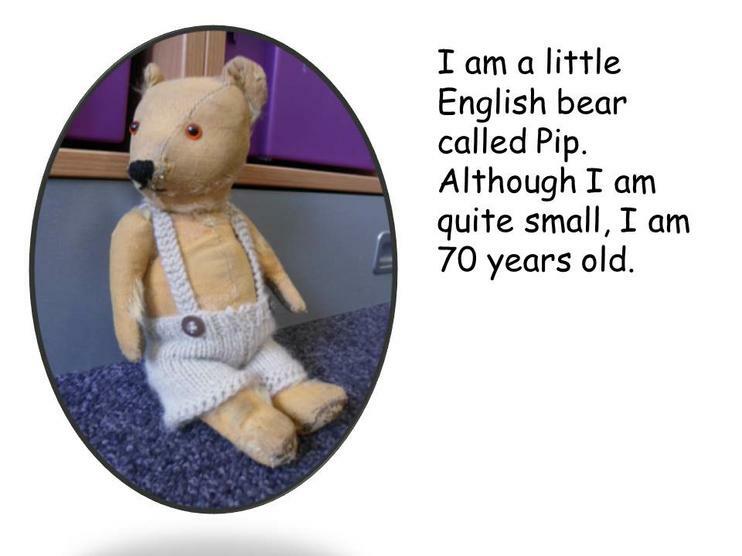 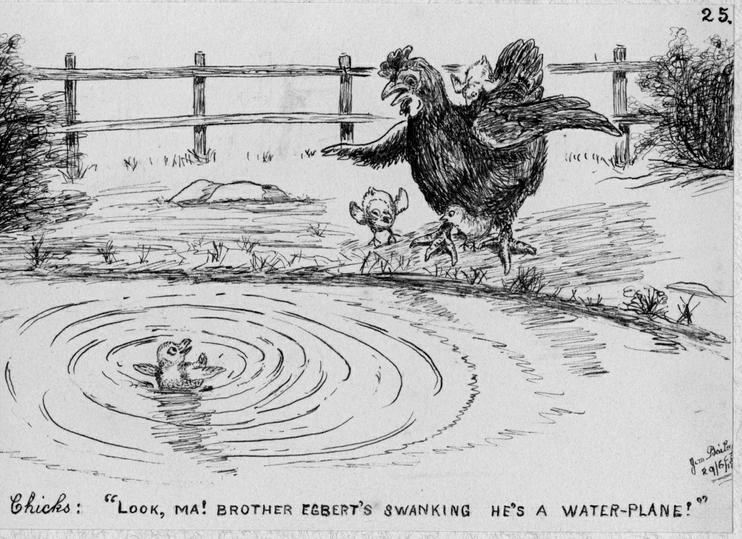 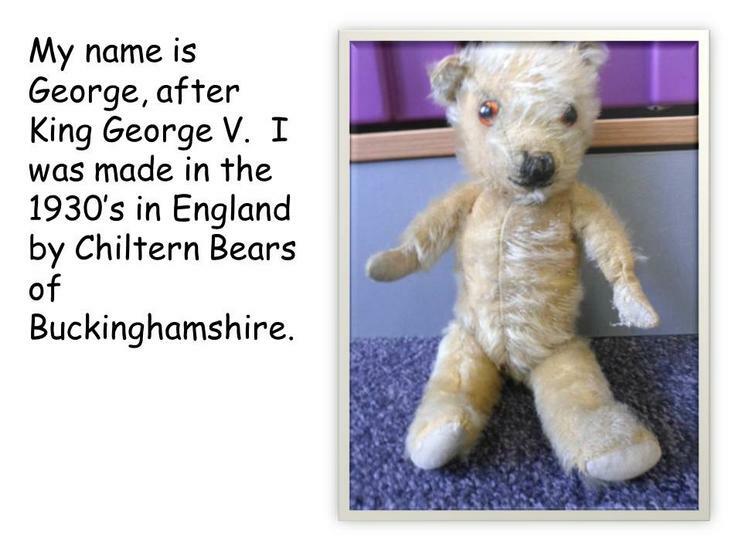 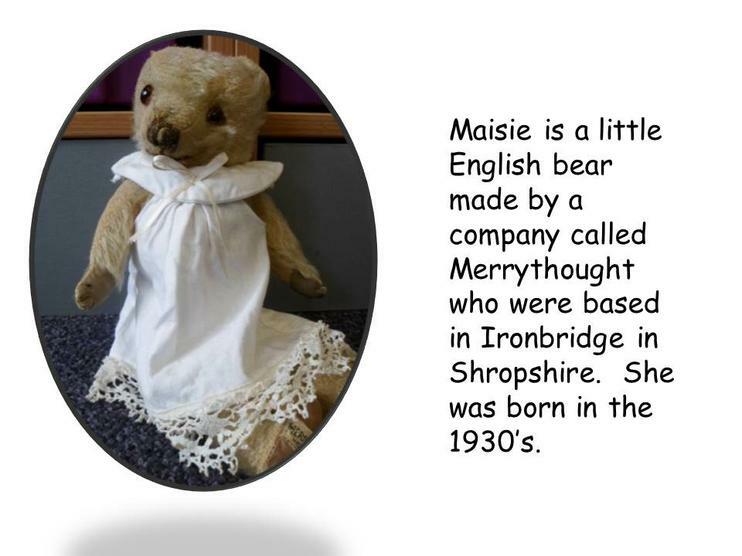 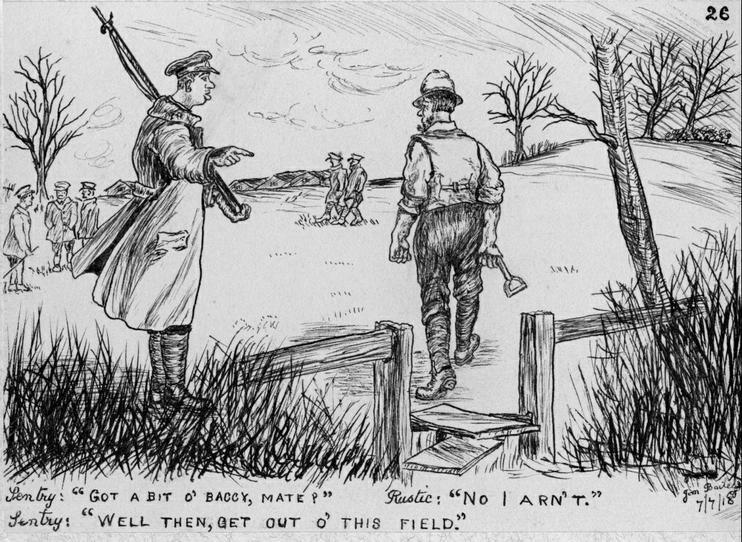 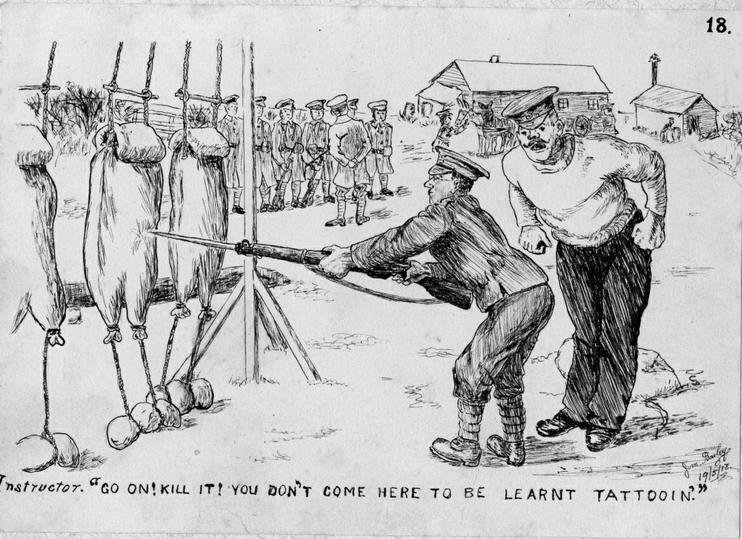 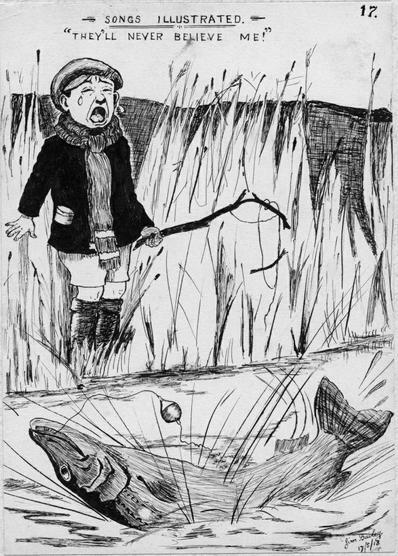 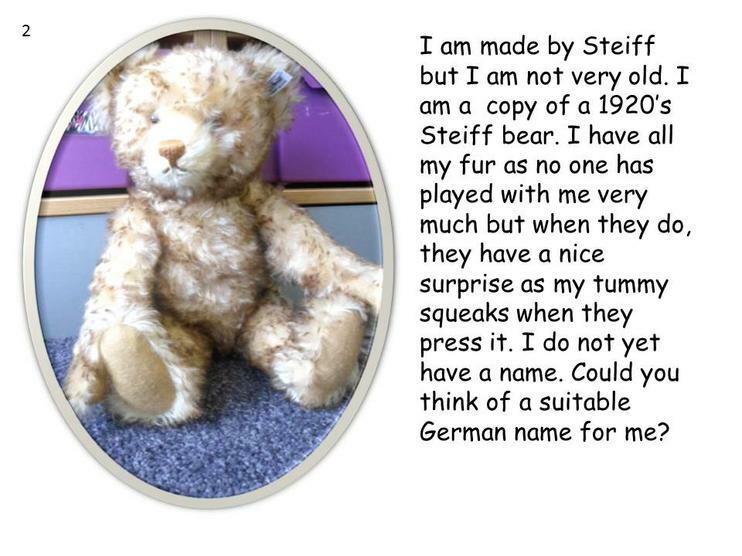 Teddy Bears were around in the First World War so this linked to the topic that the children were studying. 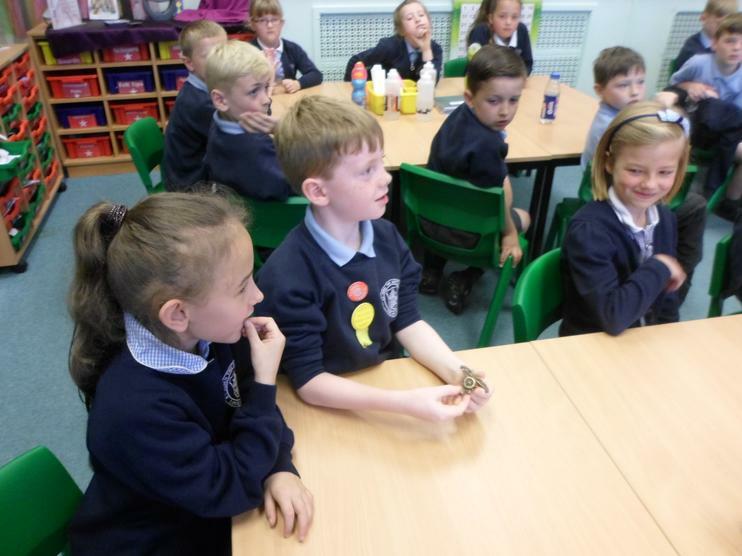 Take a look at the pictures. 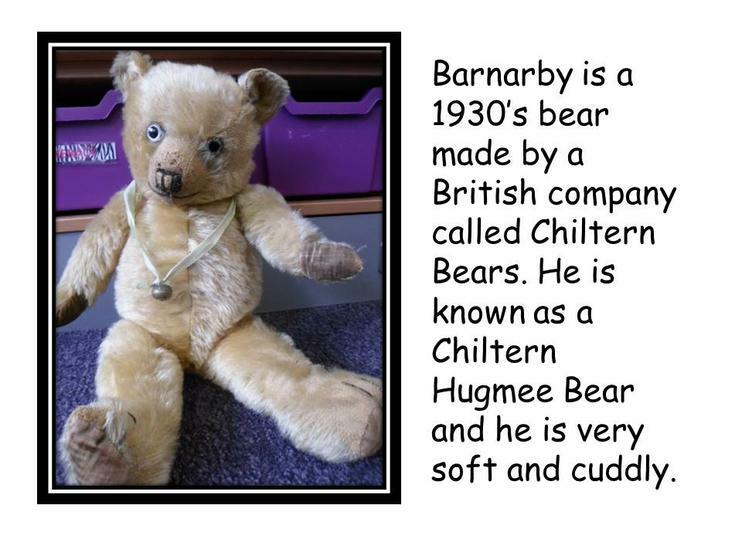 Some of the bears have names but 4 of them don't. 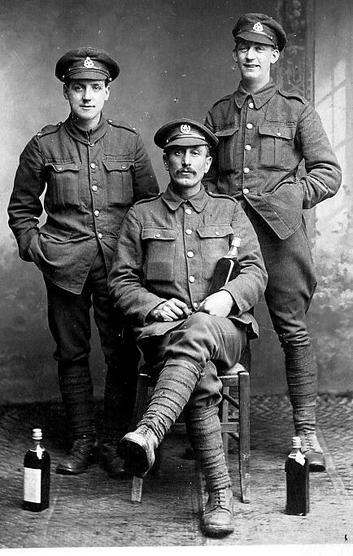 The four that do not have names have a number in one of the corners. 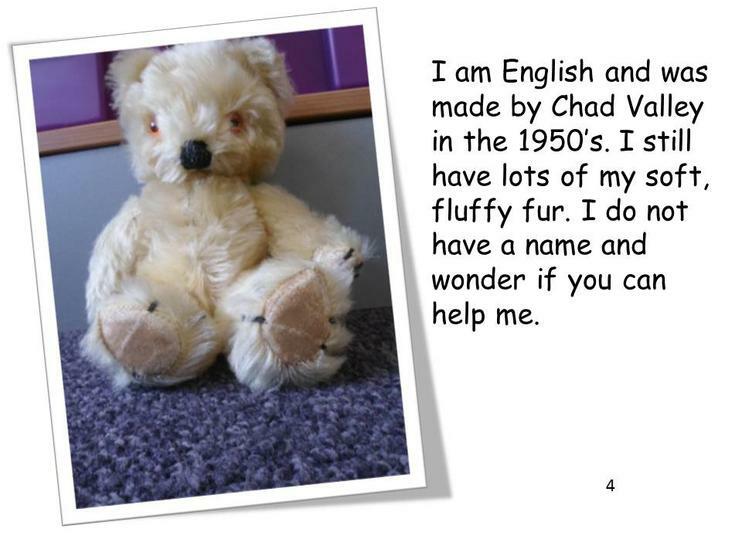 Can you think of any good names to give these bears? 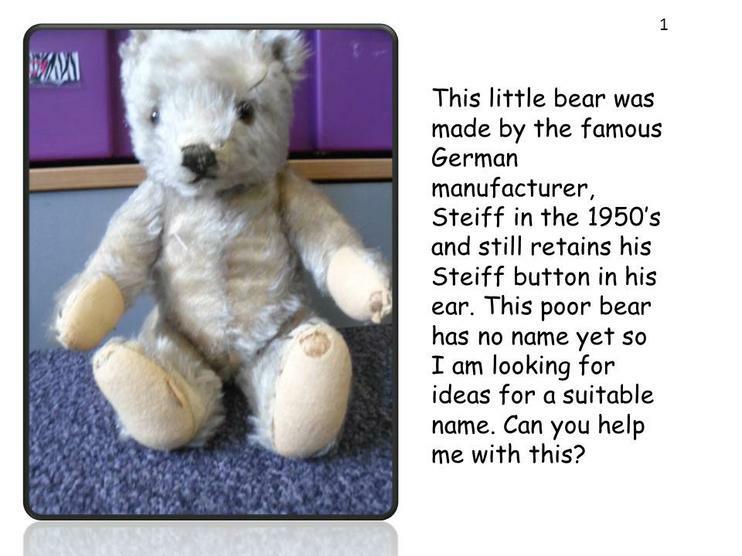 You can use the contact form below to send your ideas. 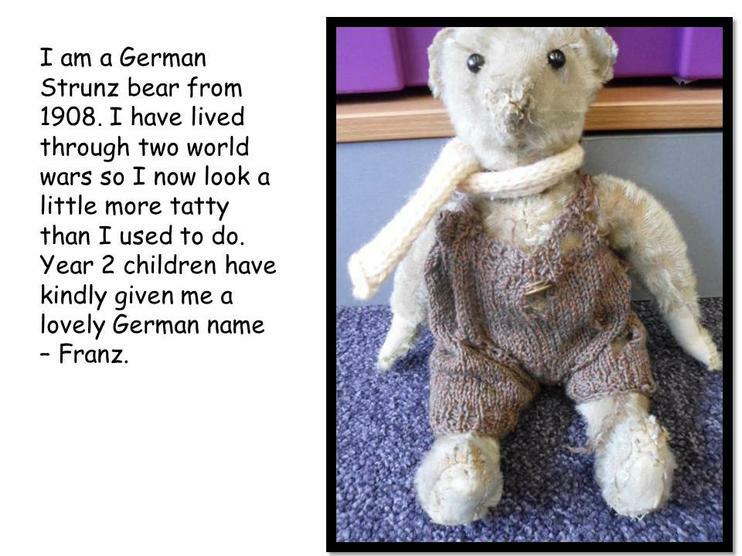 Make sure you write which number of Bear you are naming. 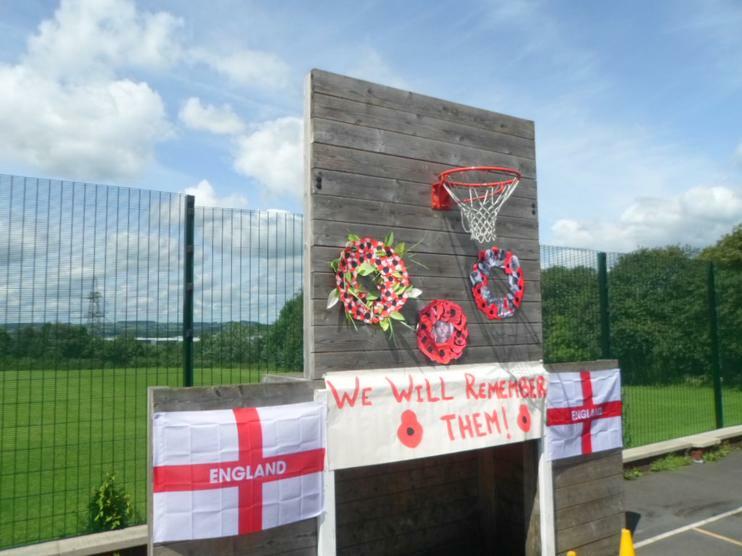 Mrs Bracken has made the most amazing banner for our school. 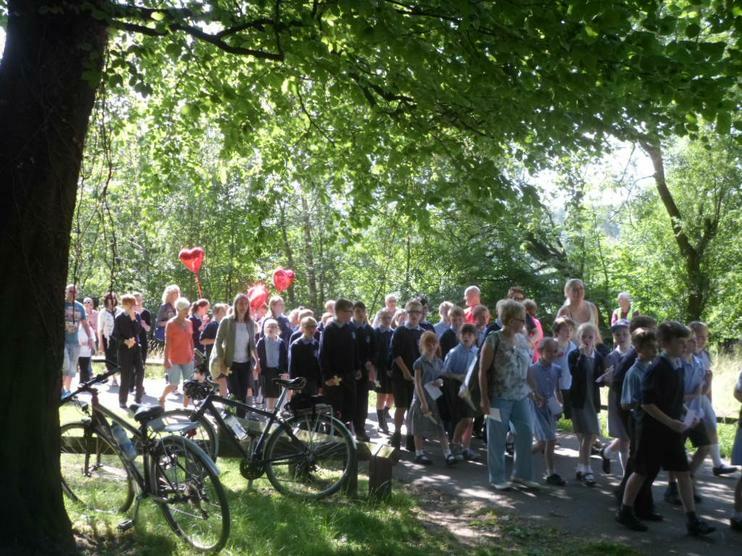 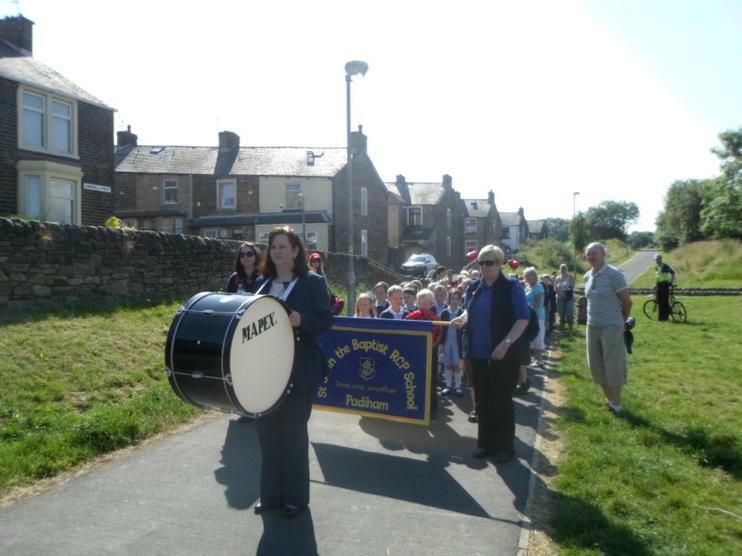 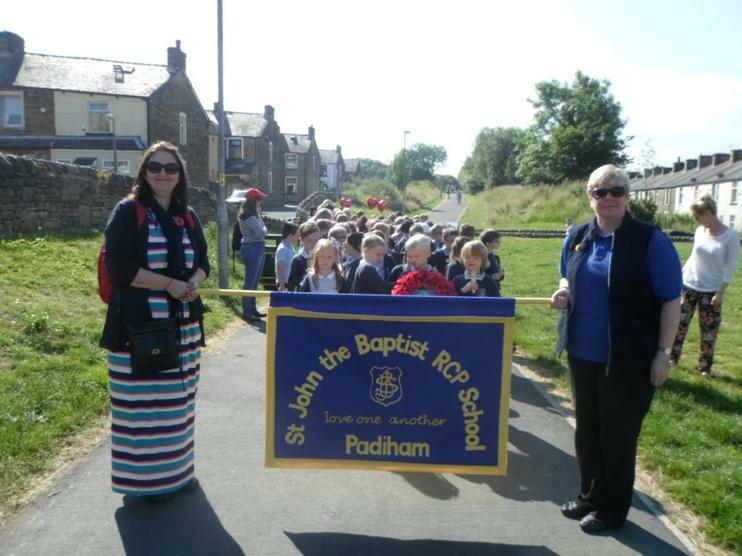 It will get its first official trip out on Tuesday 1st July as it will be carried on the Padiham Greenway with 90 of our children who will be representing our school. 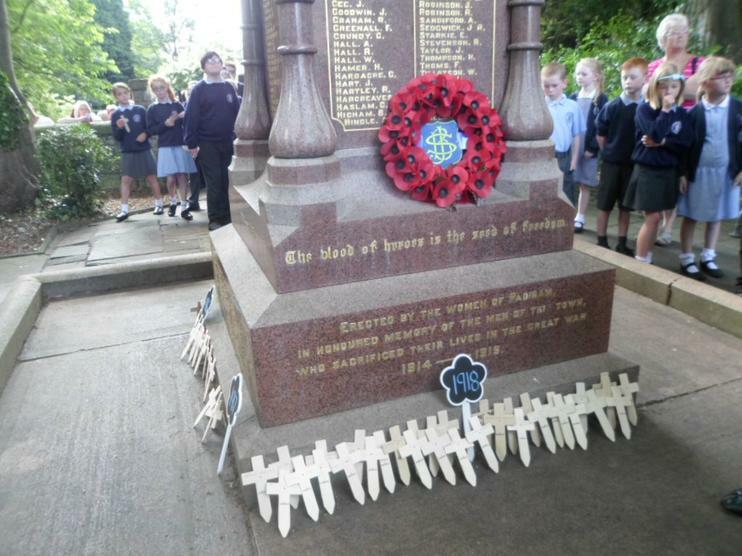 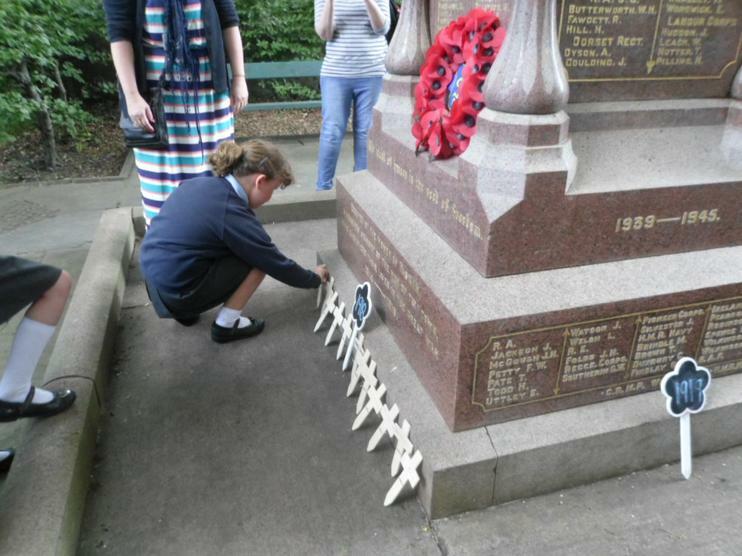 There will be lots of children from other schools and all the children will be laying a cross with the name of their adopted soldier written it. 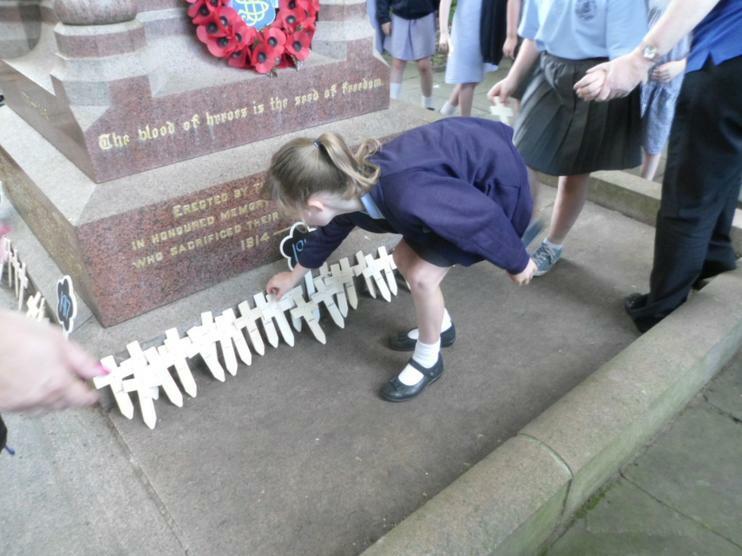 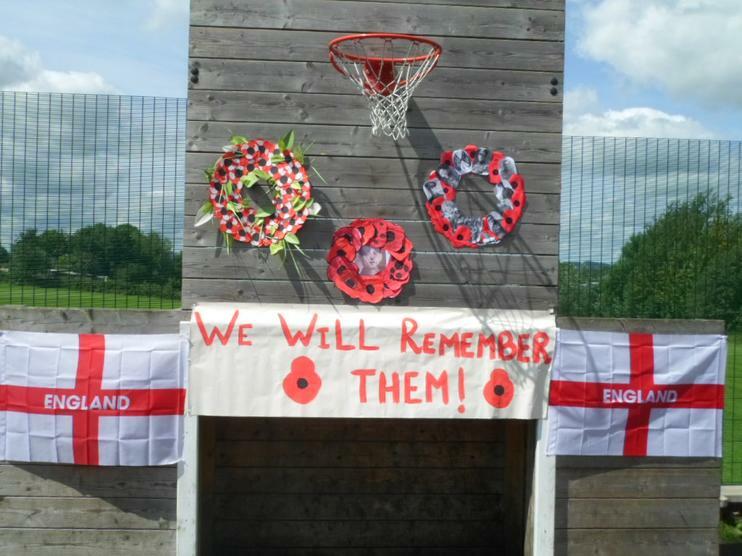 This will be a very special and sombre occasion and the children have been preparing for it with the respect it deserves. 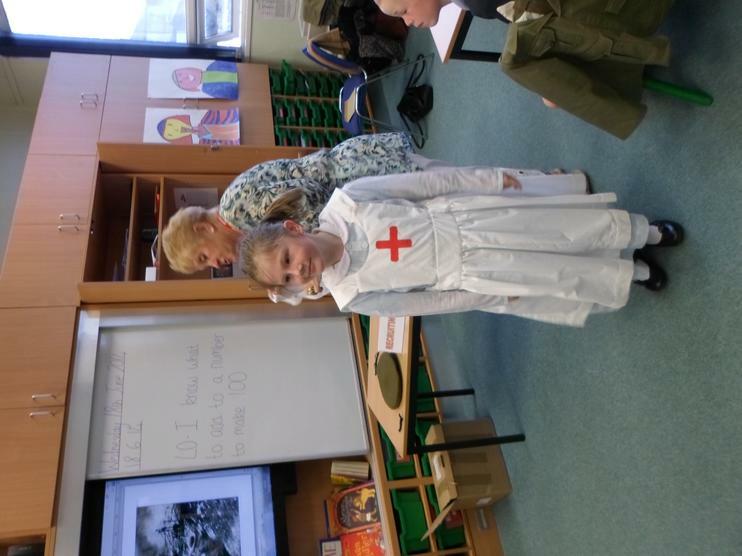 We are very proud of our children. 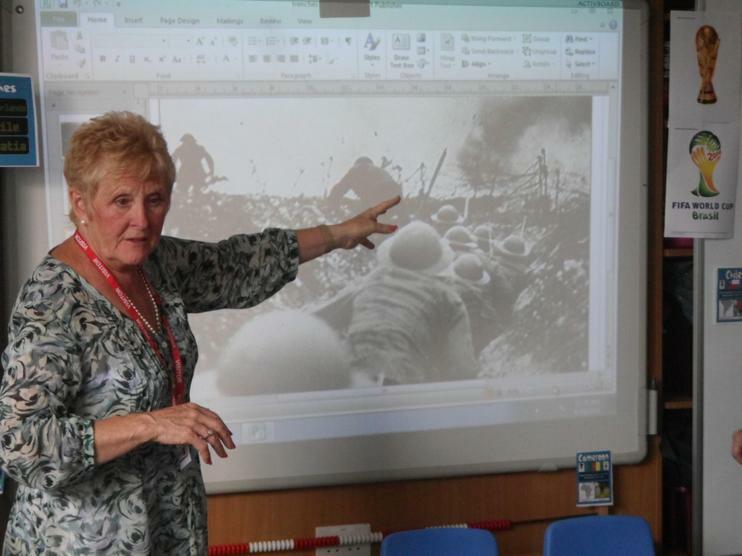 Thank you again Mrs Bracken. 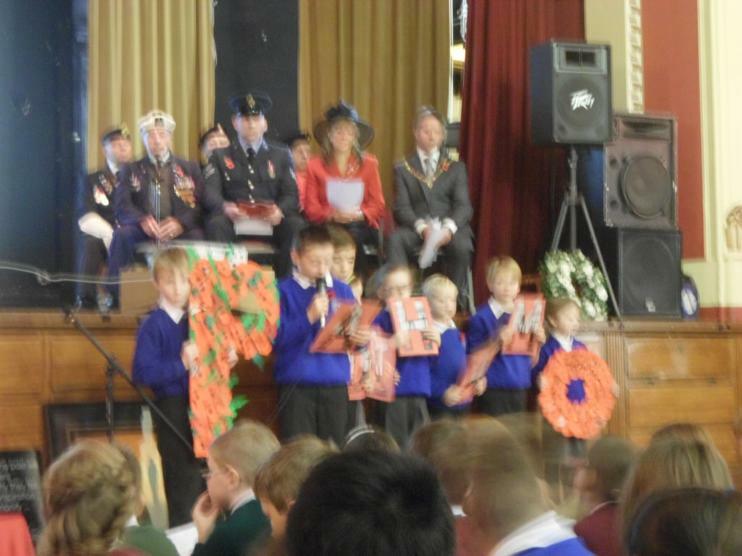 The children who represented our school were amazing. 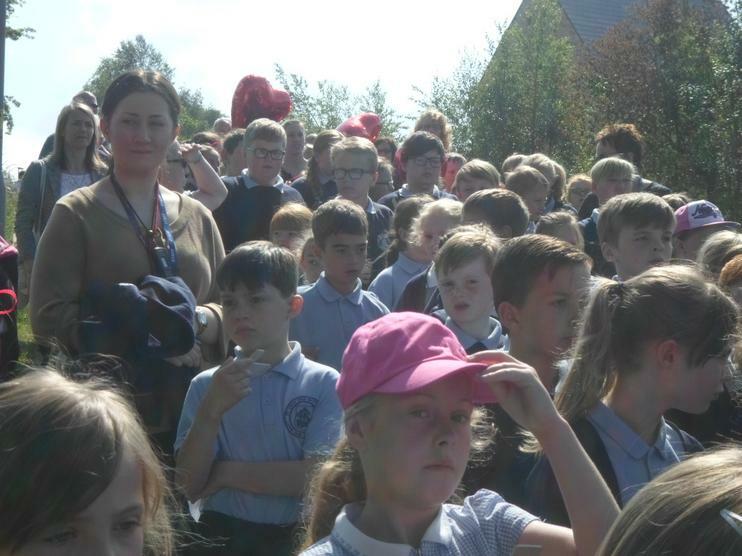 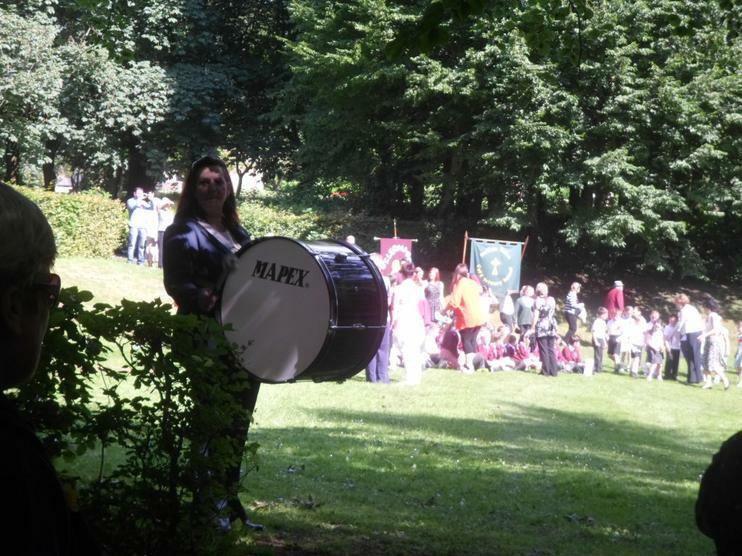 Thank you to Mrs Collins who helped to organise the event and to Mrs McKeating for leading the event in time to the drum. 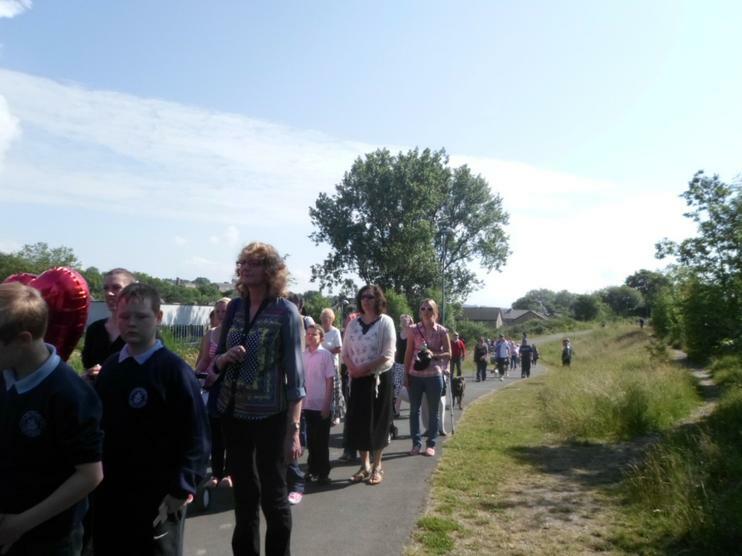 Thank you also to the parents who came to support the event. 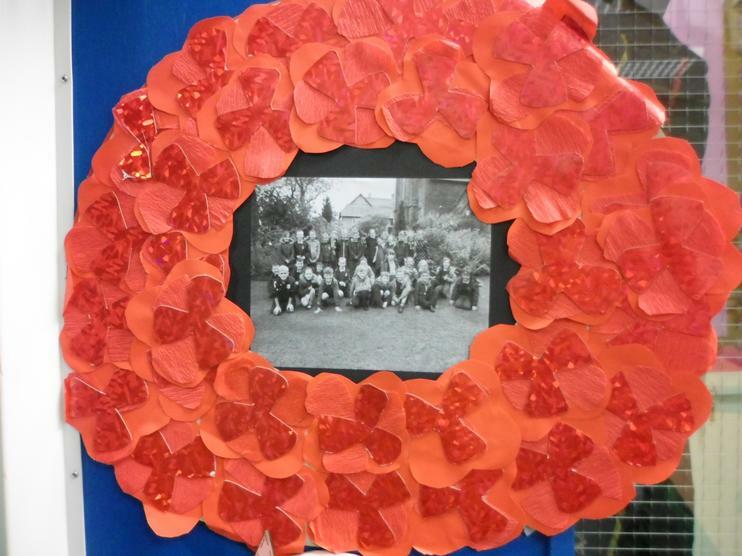 Each class has made a wreath to hang on their classroom door. 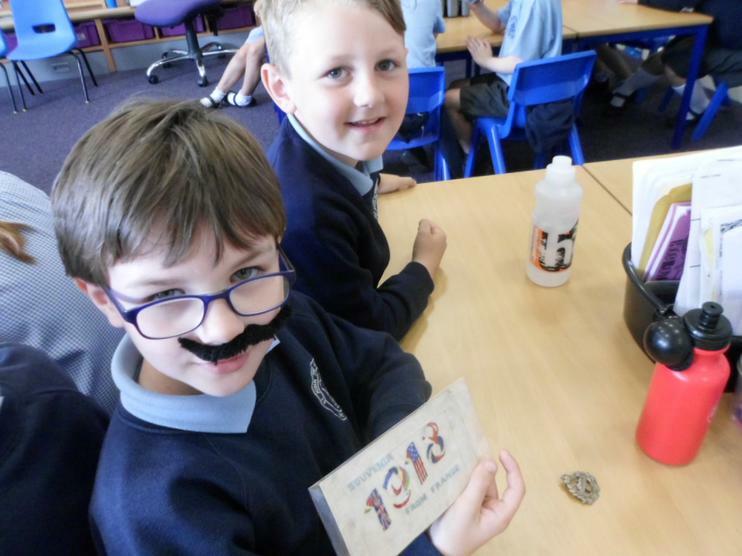 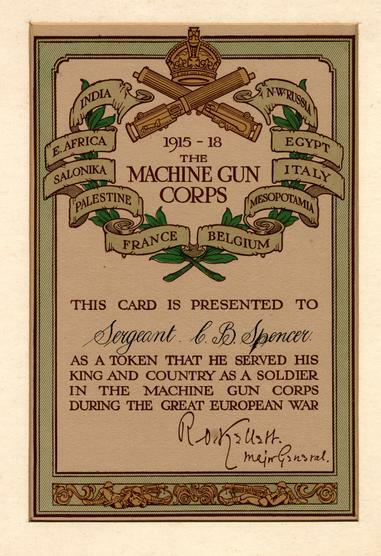 These all look fantastic and are a very special reminder to everyone in school of the courage and bravery of all the soldiers who fought in the war. 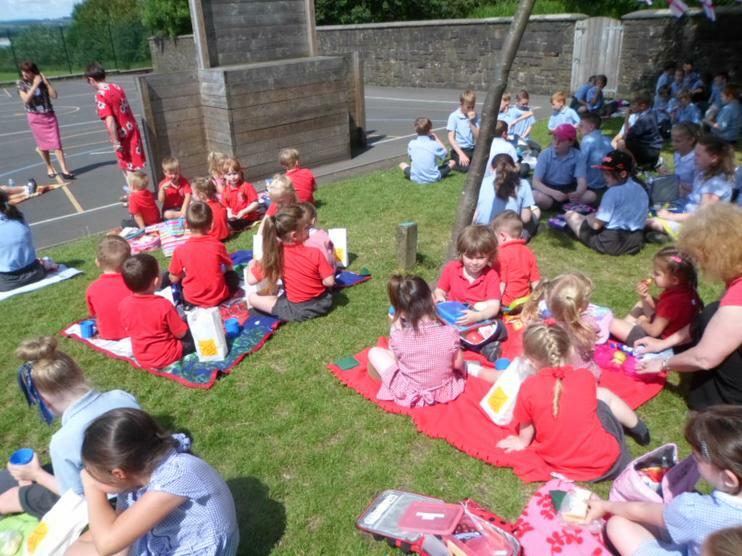 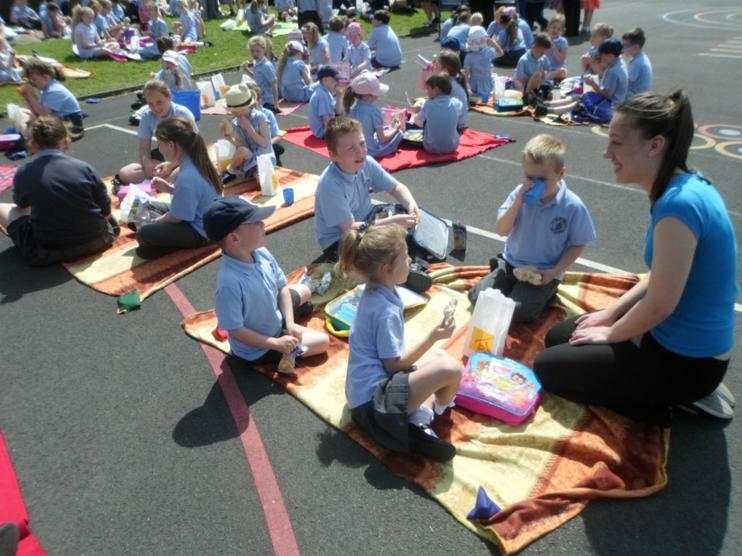 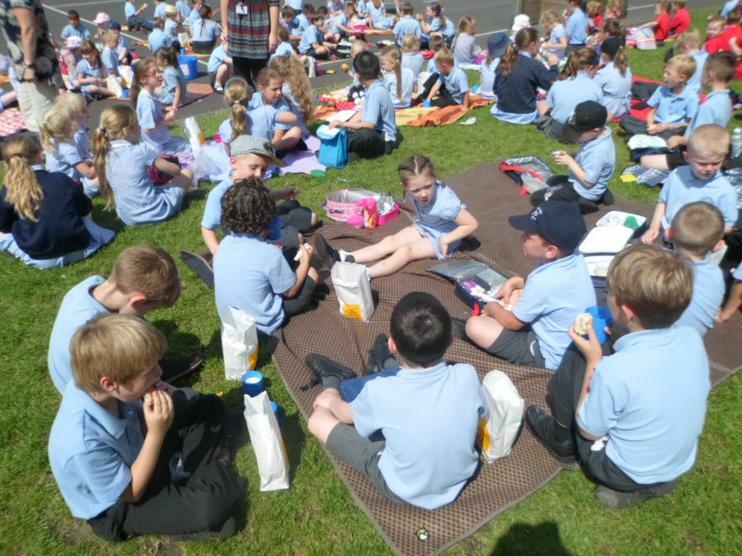 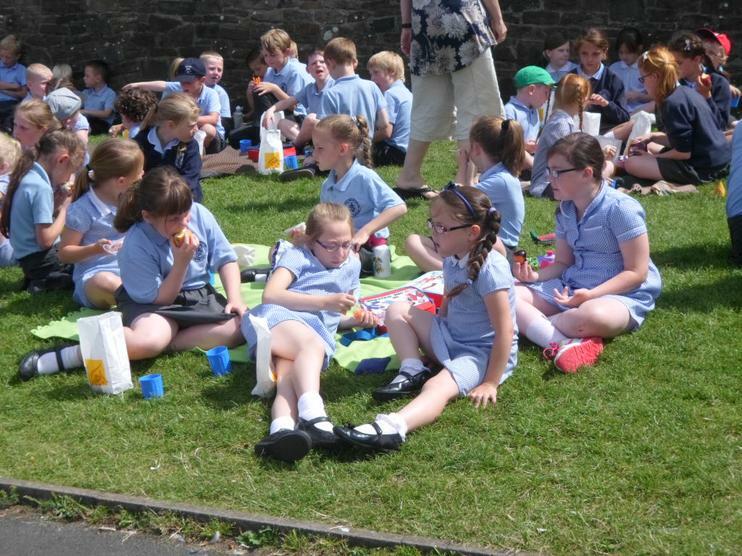 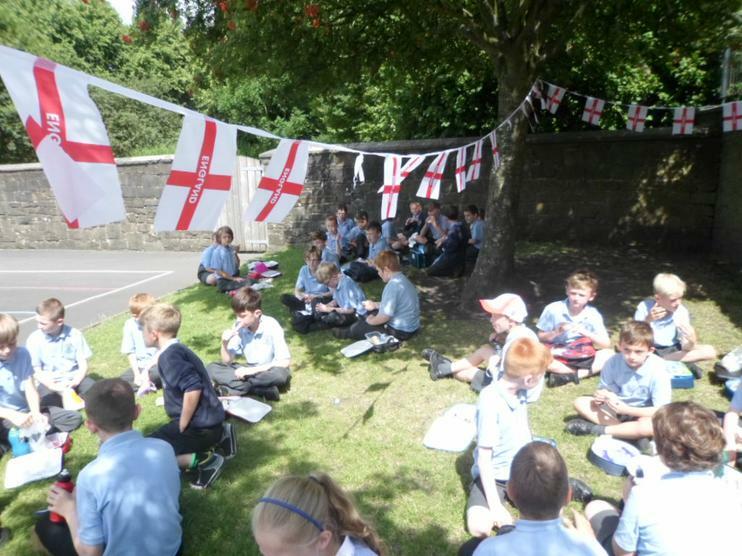 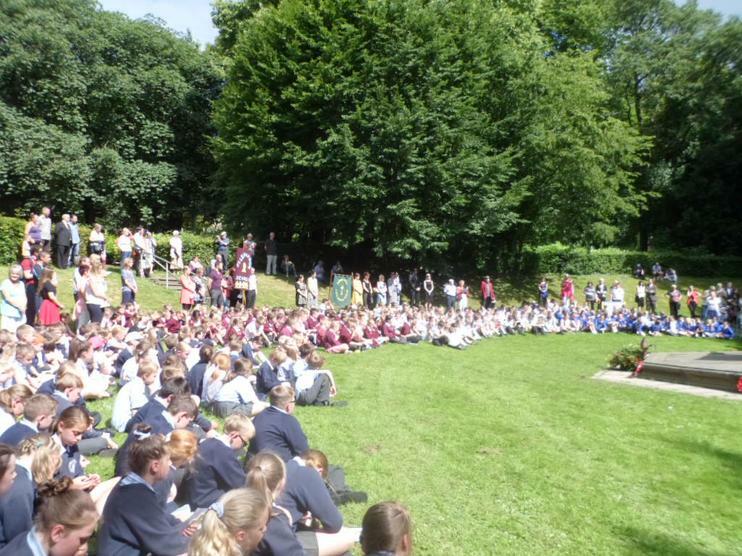 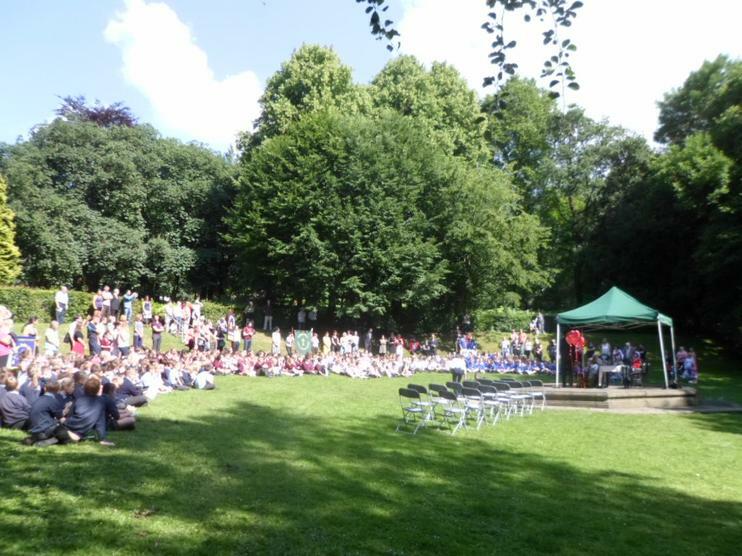 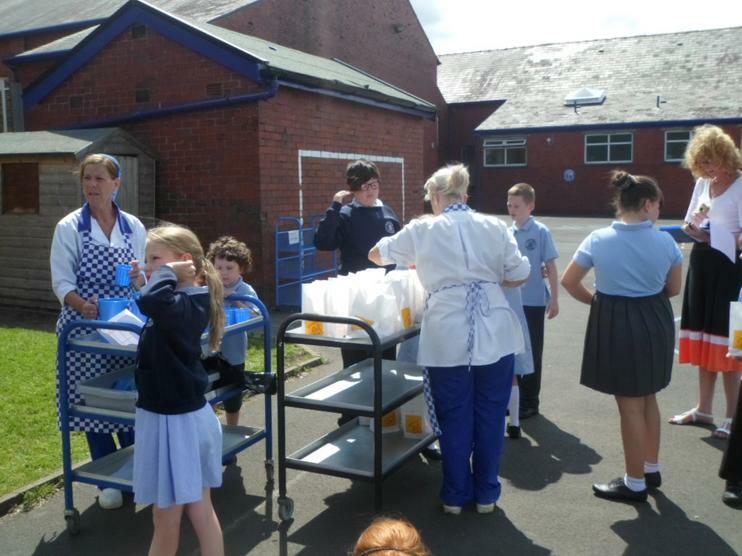 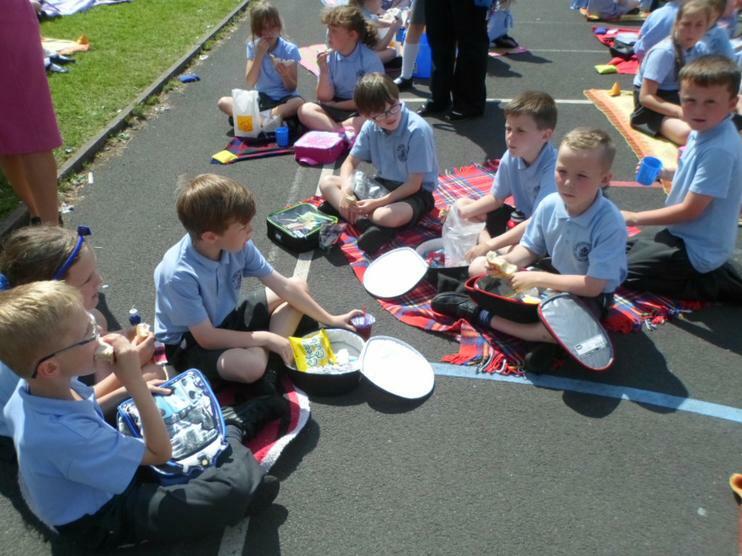 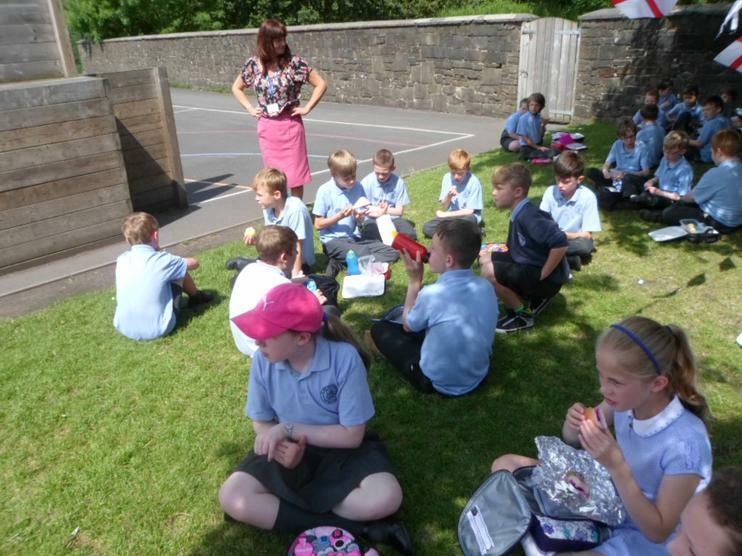 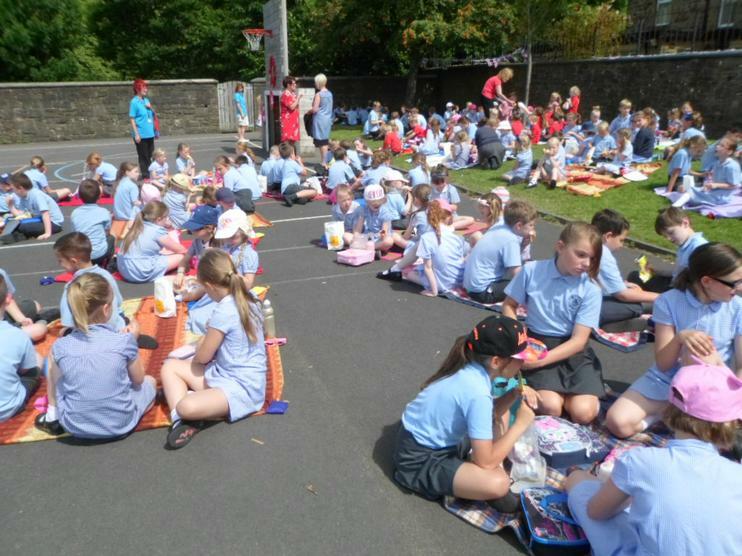 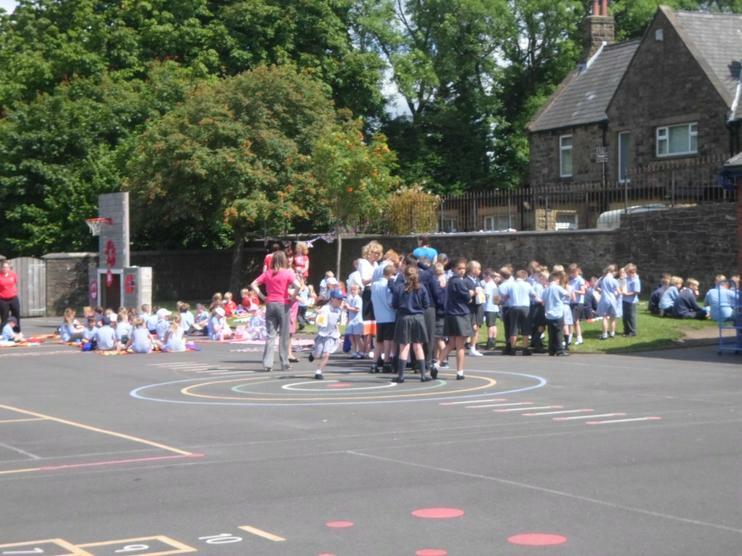 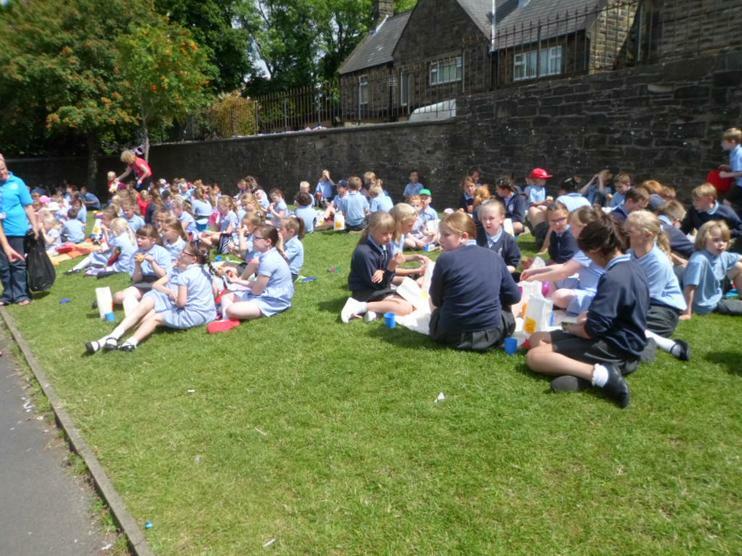 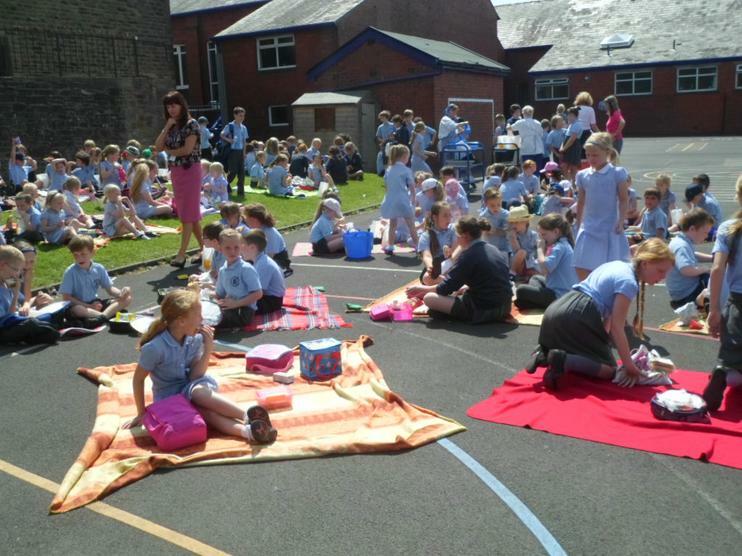 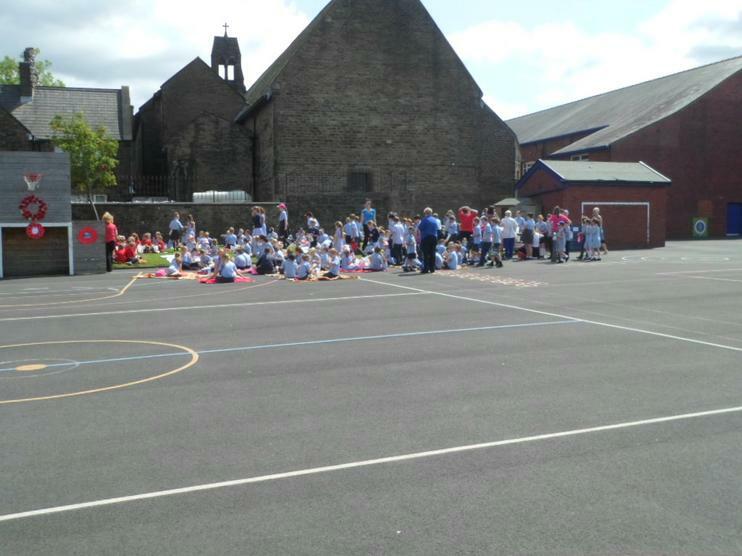 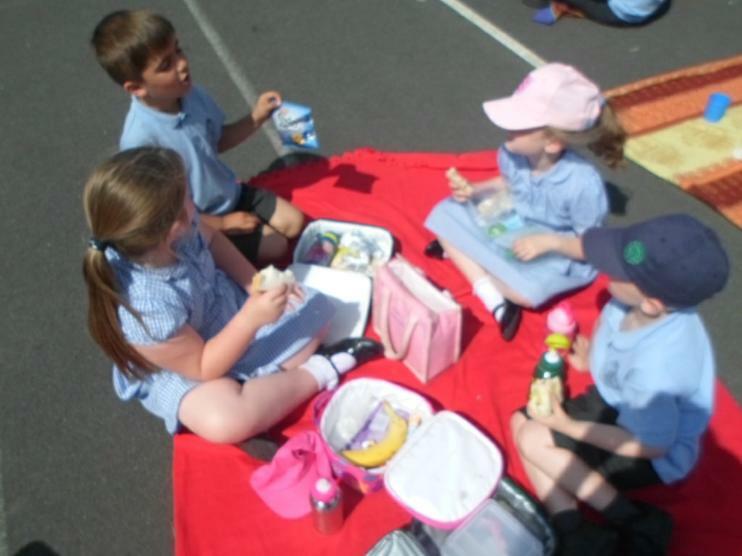 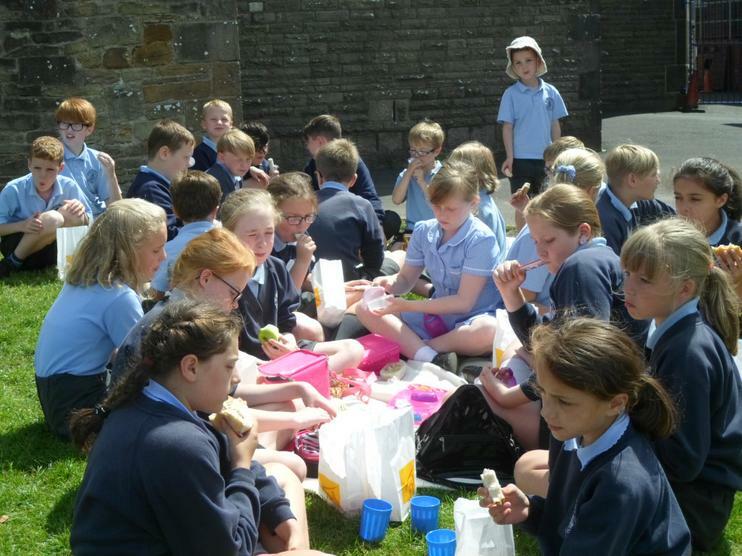 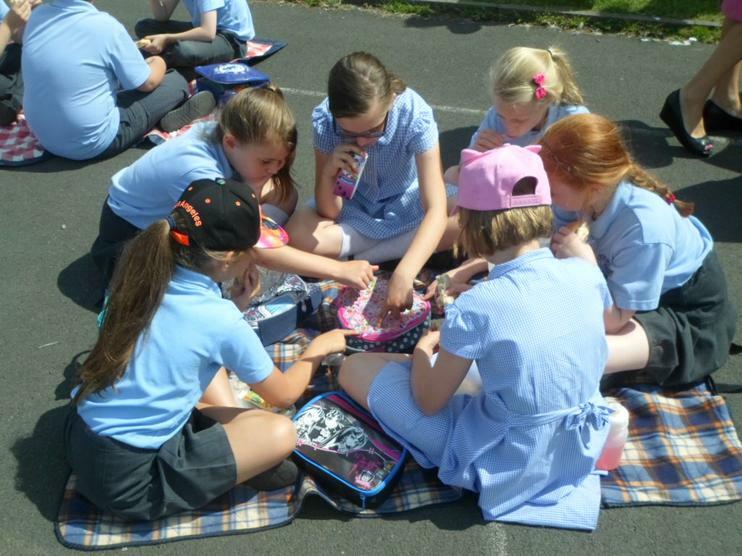 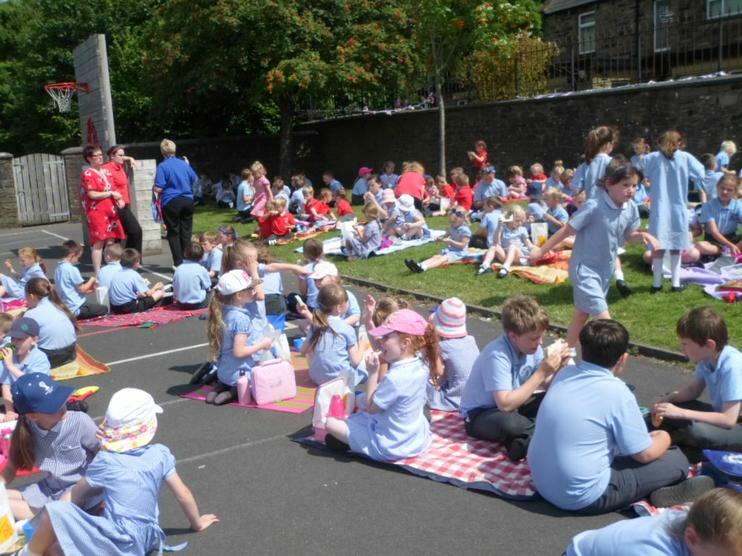 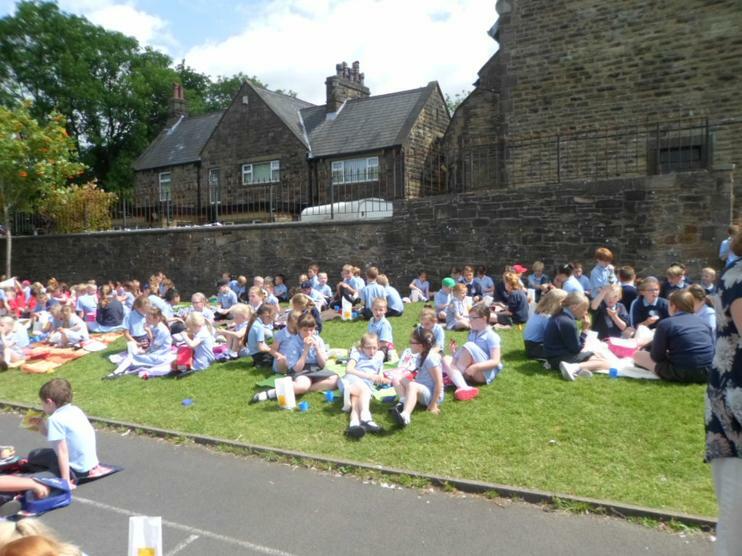 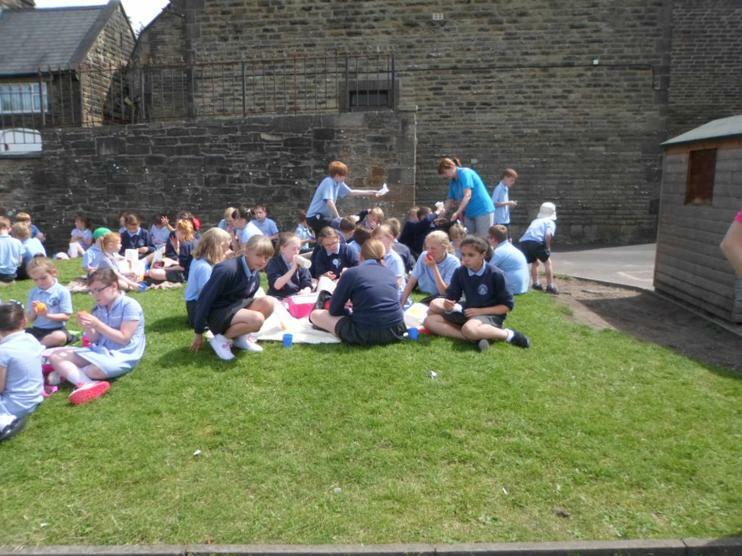 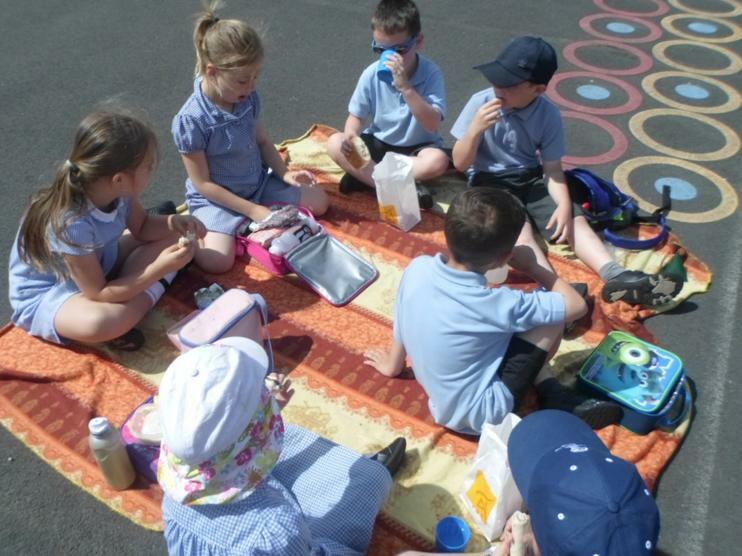 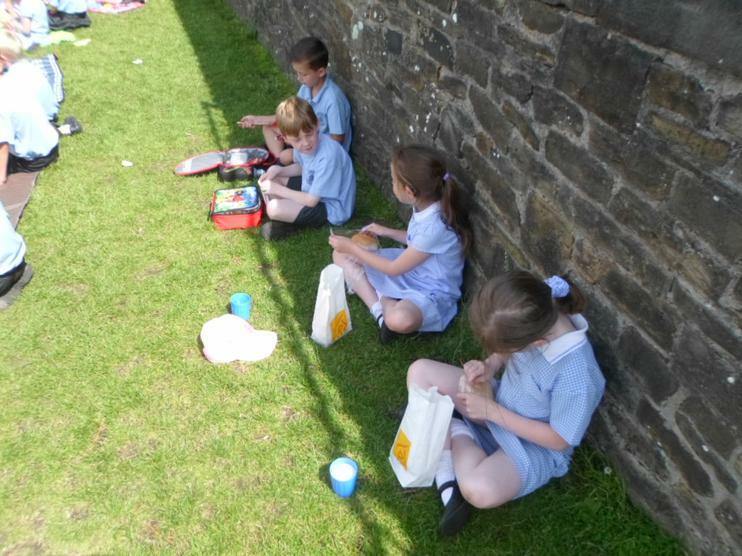 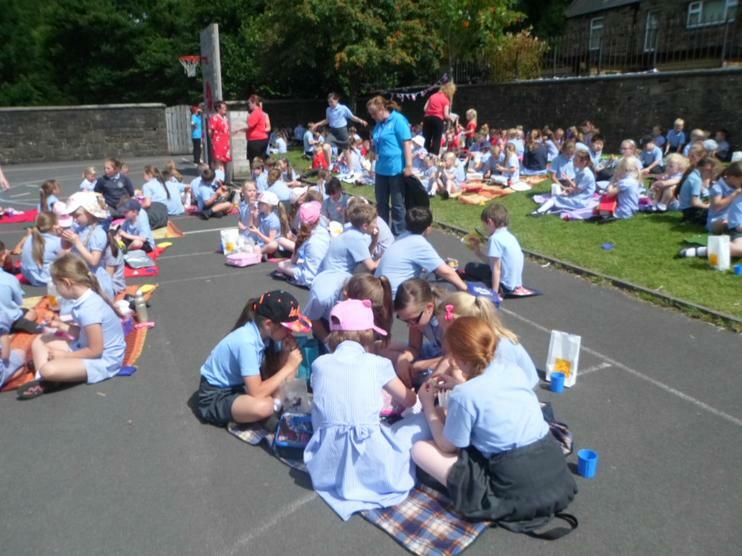 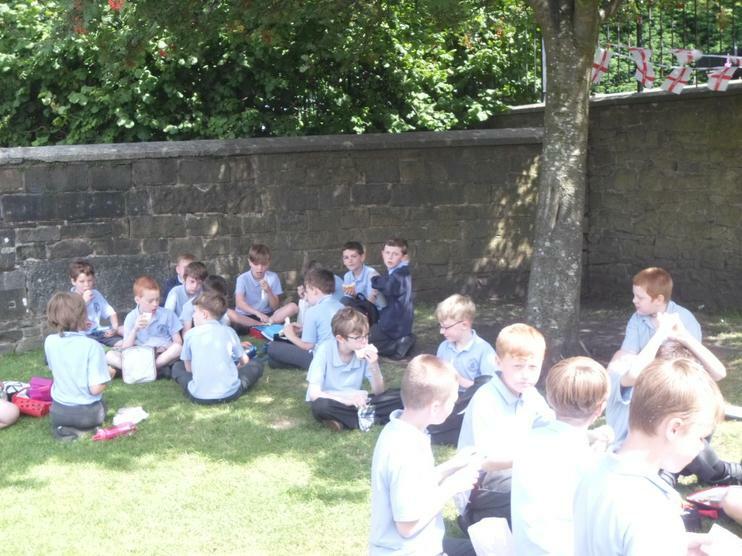 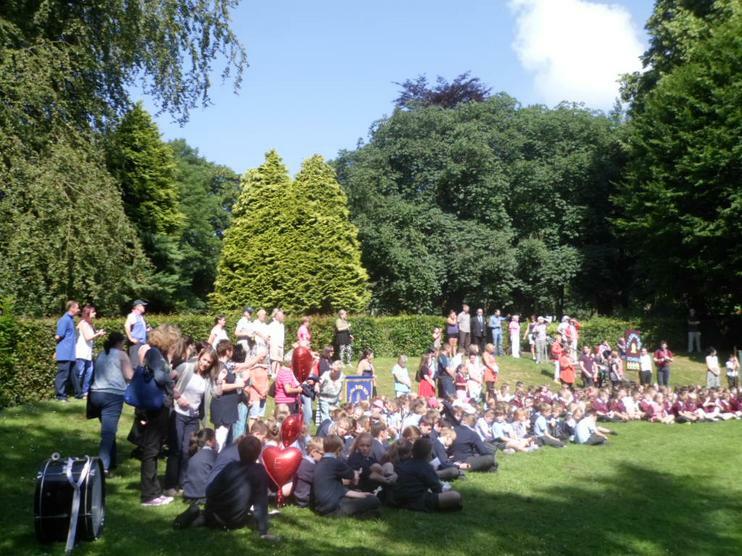 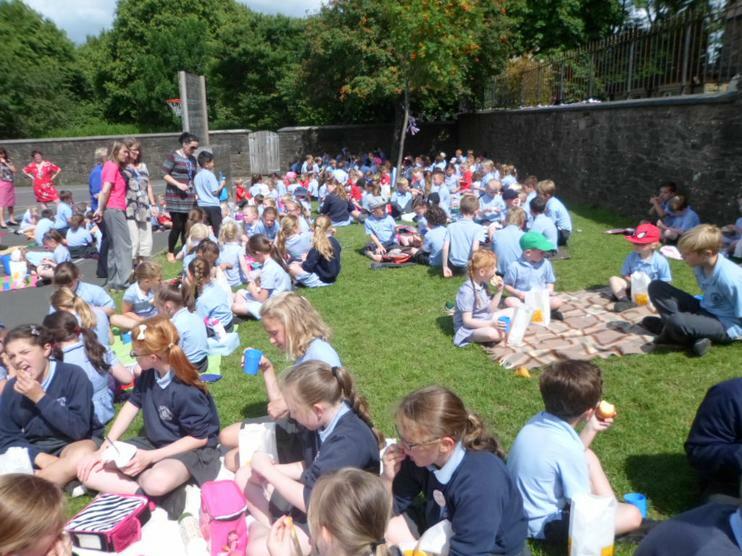 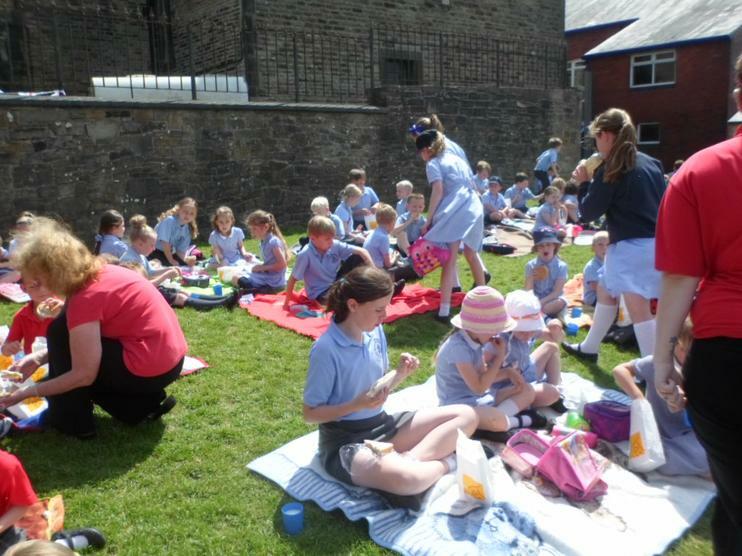 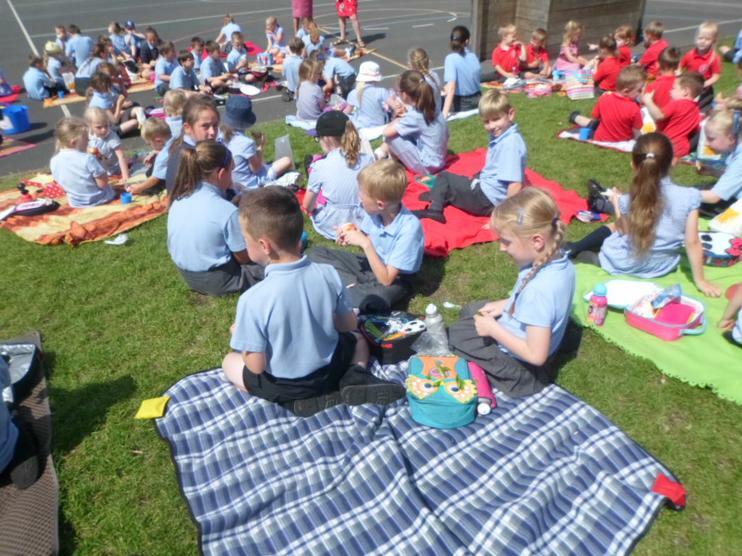 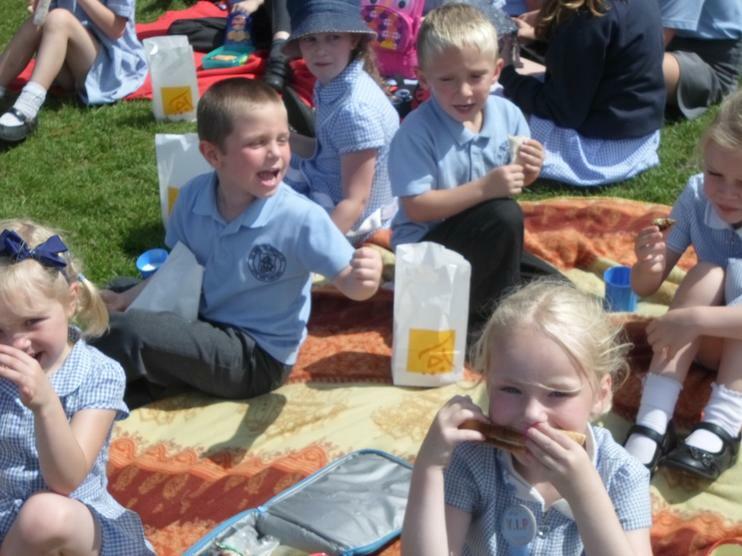 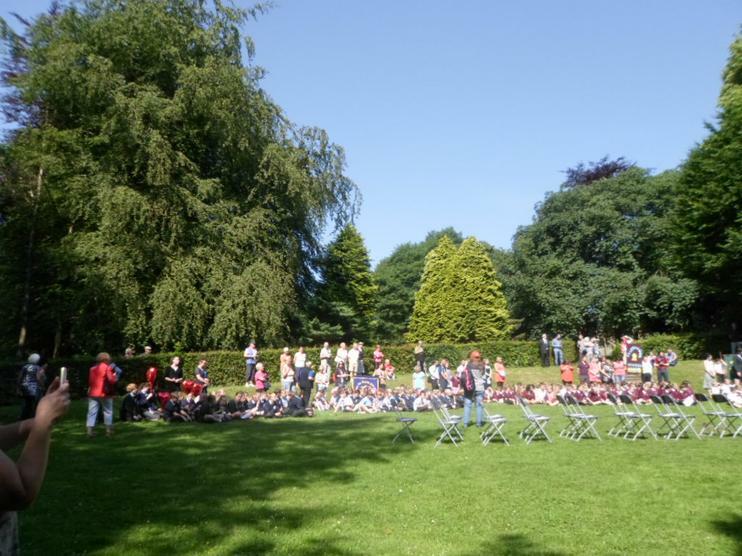 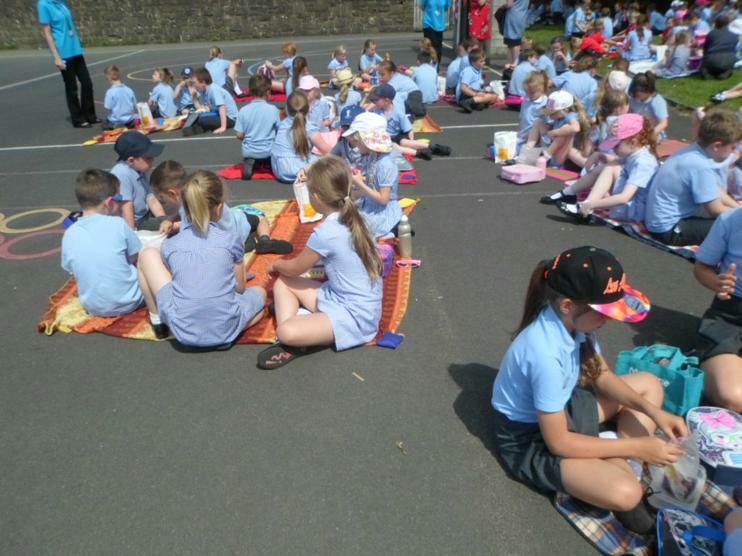 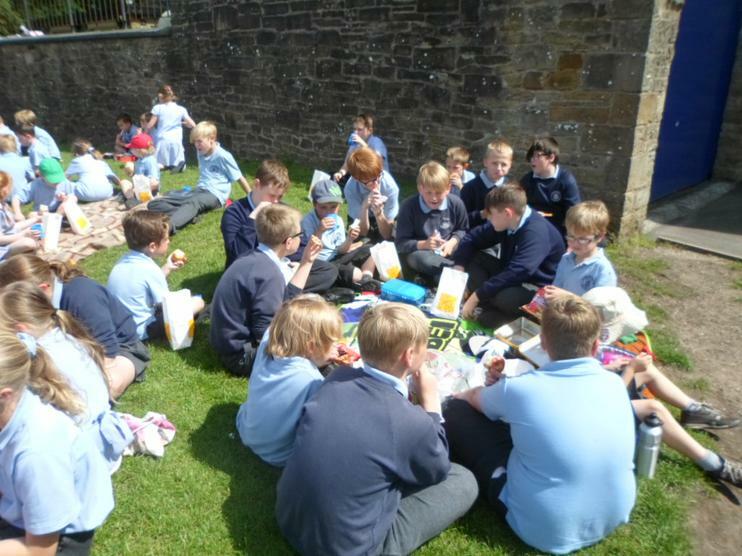 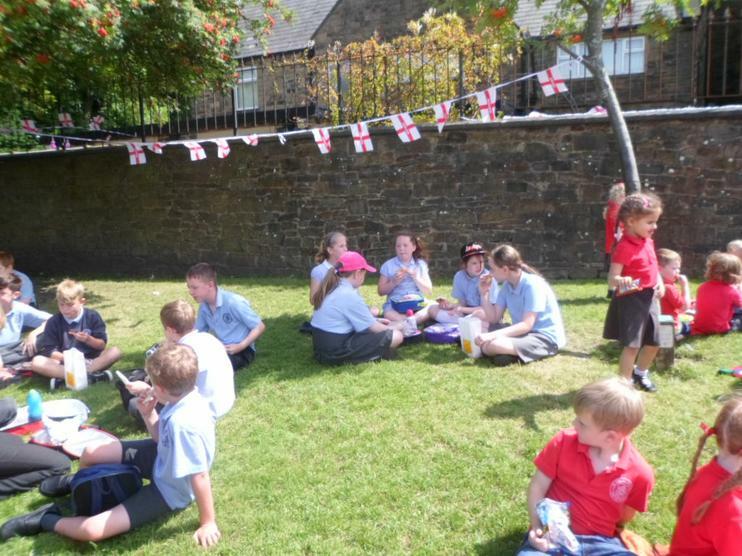 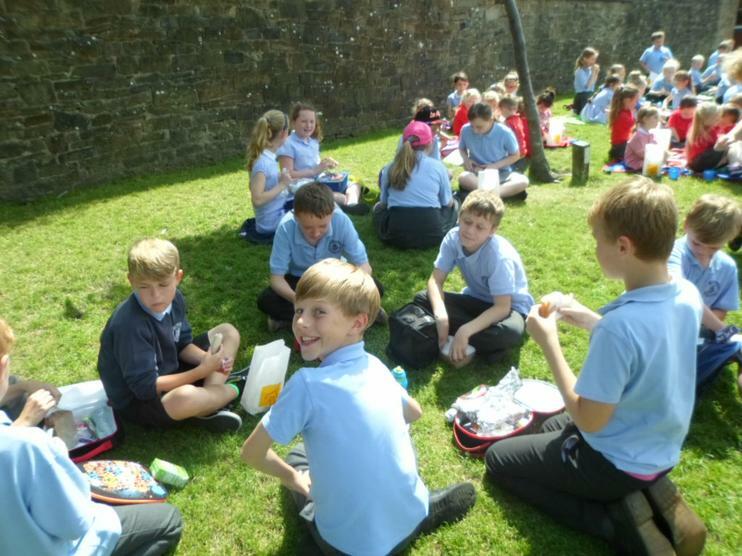 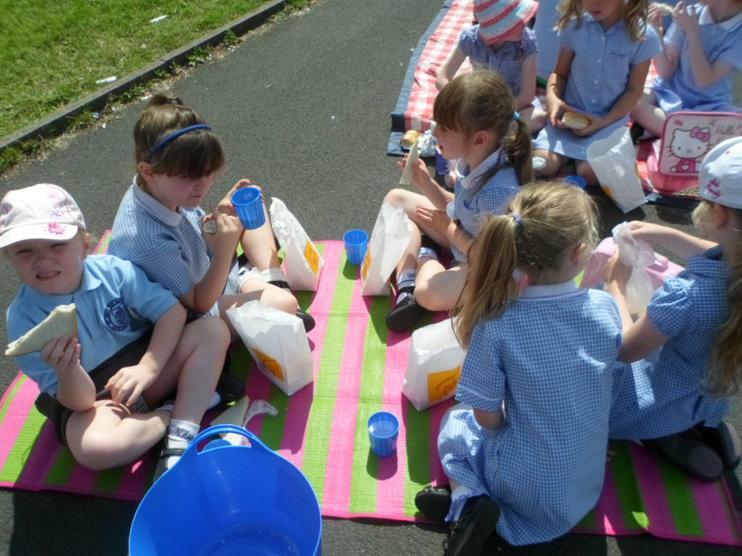 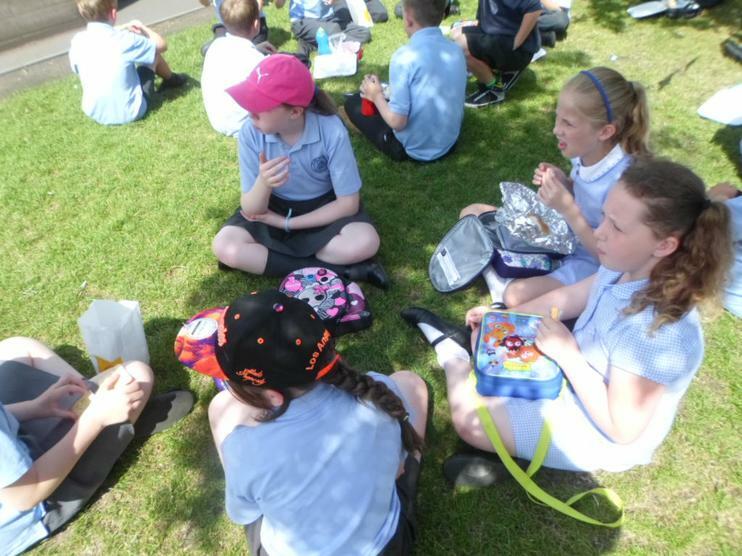 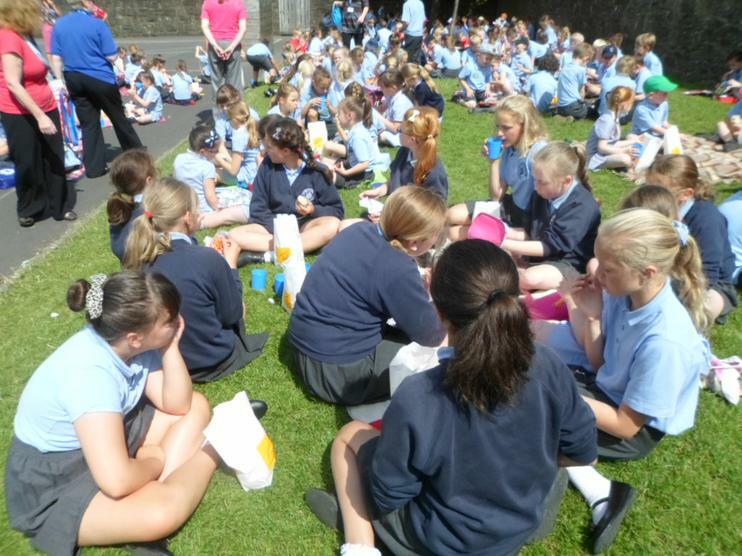 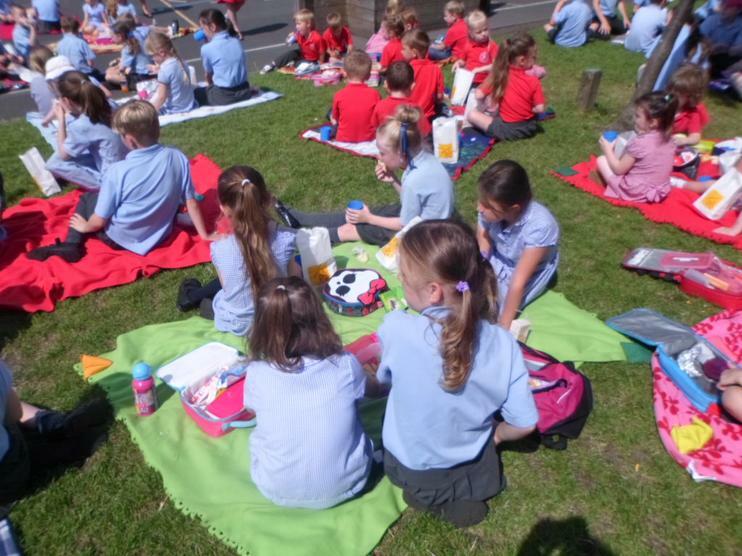 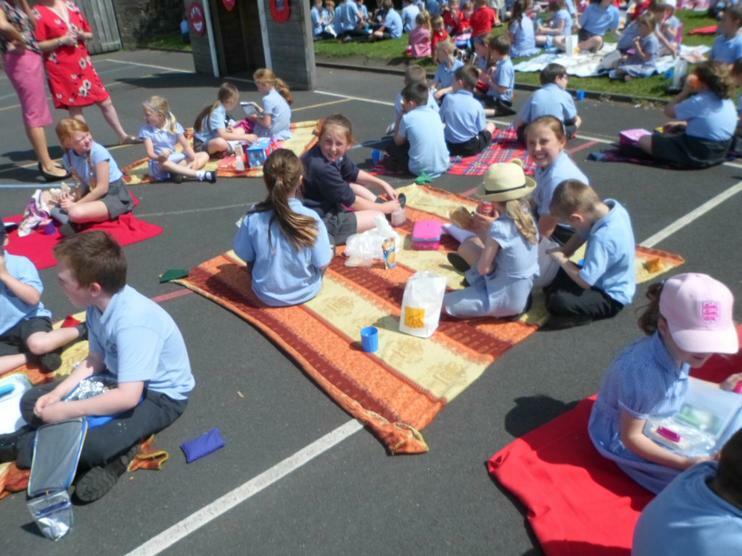 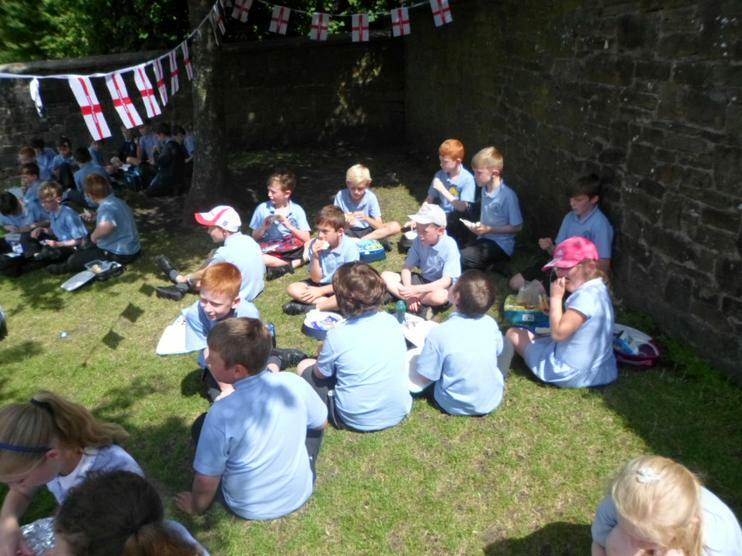 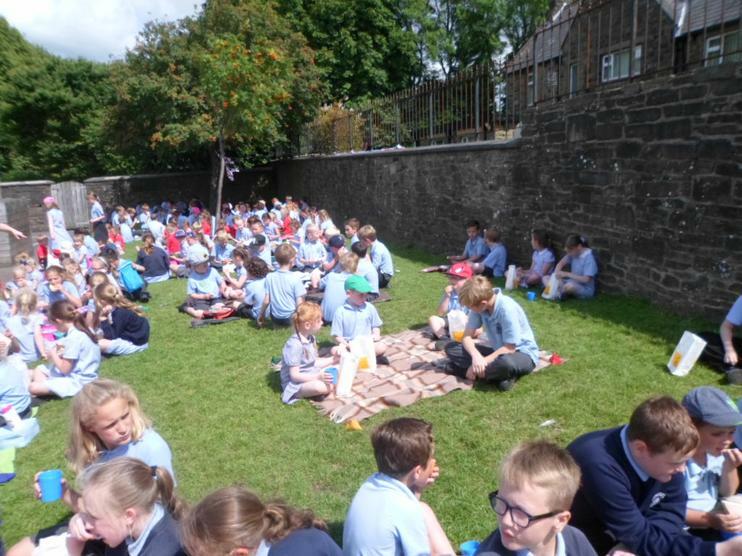 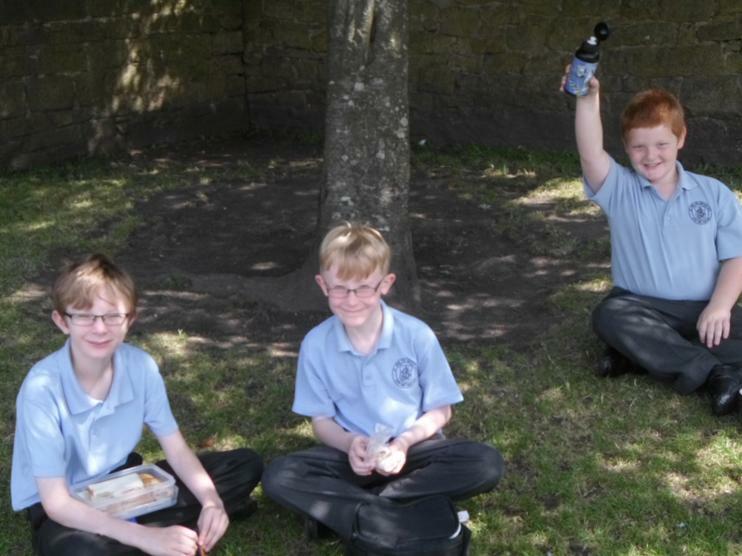 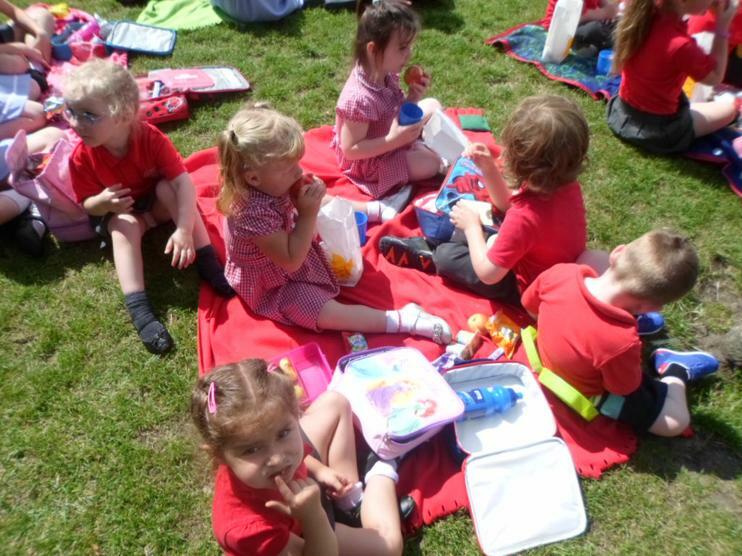 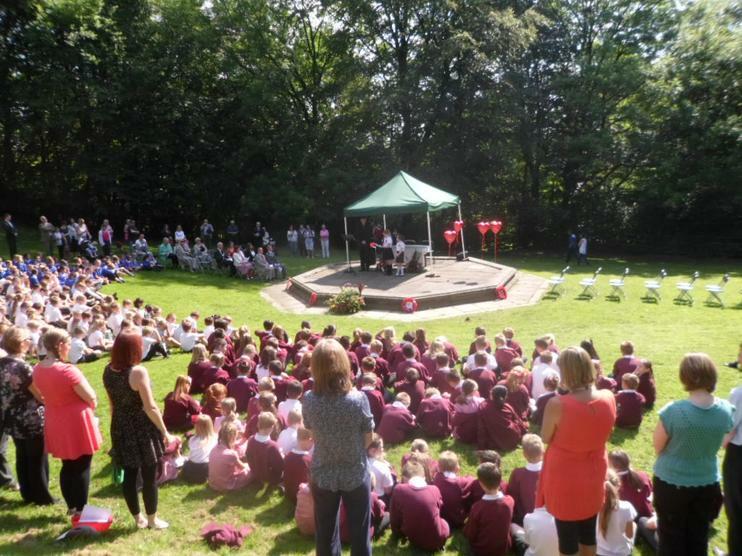 We finished off our end of the year having a special picnic outside to commemorate 100 years since the Great War. 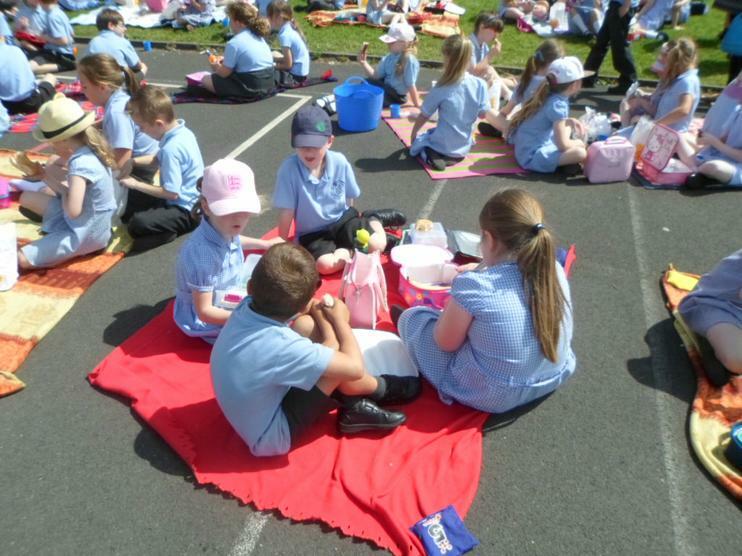 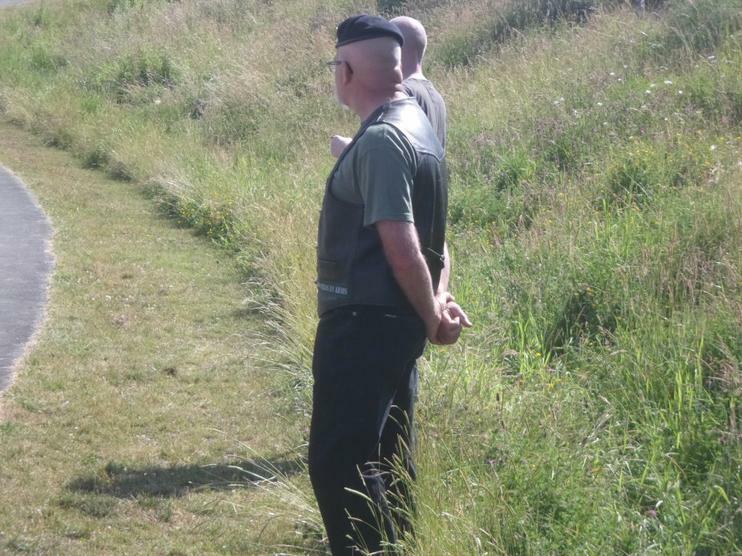 The sun was shining and everyone enjoyed themselves. 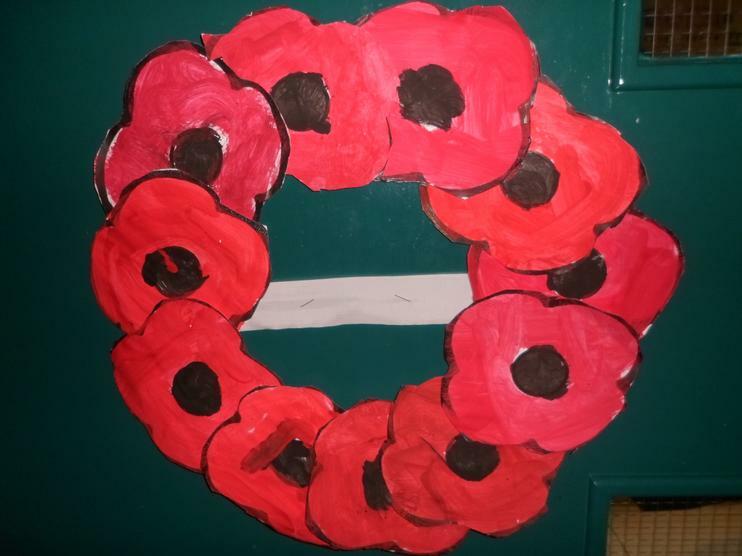 Mrs Collins and her family spent a busy weekend painting 69 poppies; one for each of the soldiers our school has been learning about.